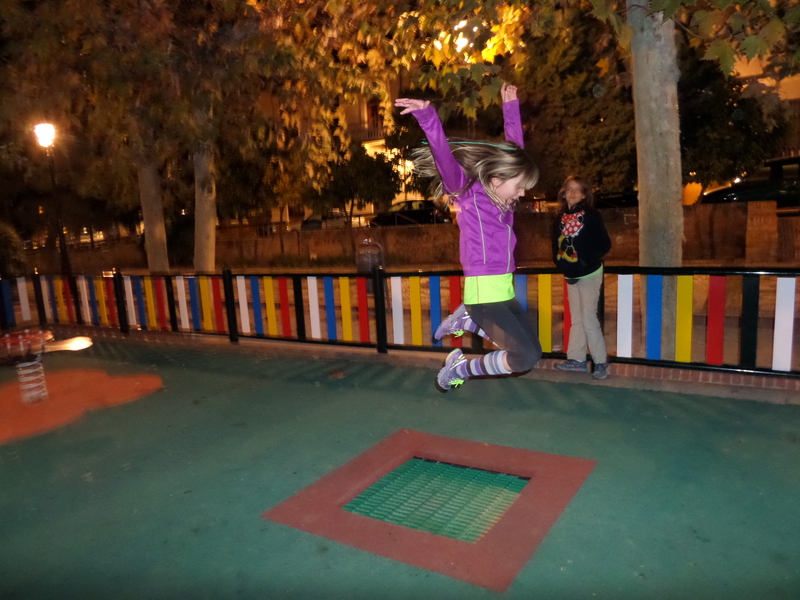 The Adventures of Team Kezmoh | A year in Spain! 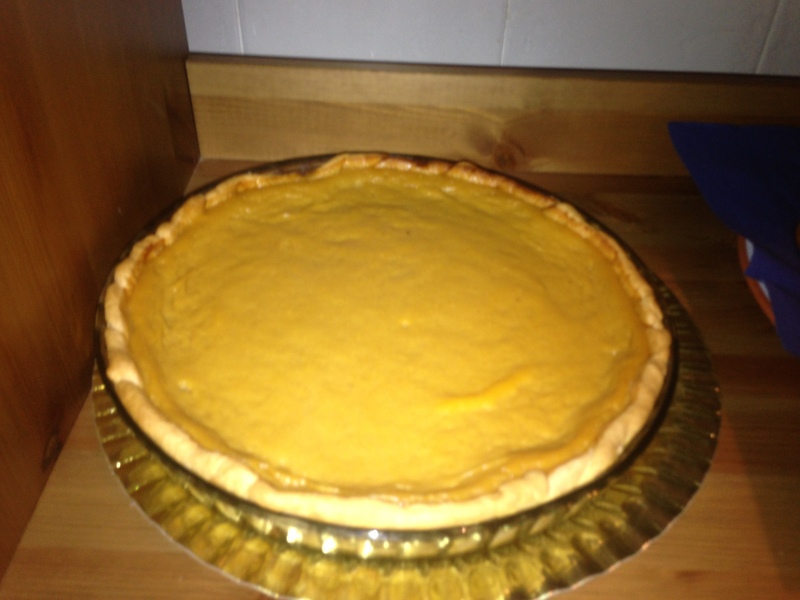 Pumpkin pie made with natural pumpkin. No cans of pumpkin in Spain! 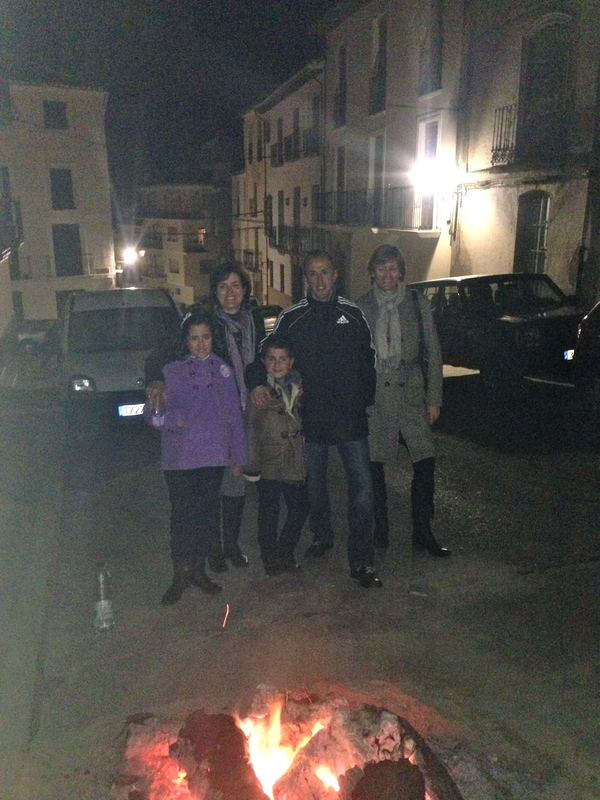 In our little village, Alhama de Granada, we are the only Americans in town. There is one Canadian and several other European expats but we are the lone Americans. 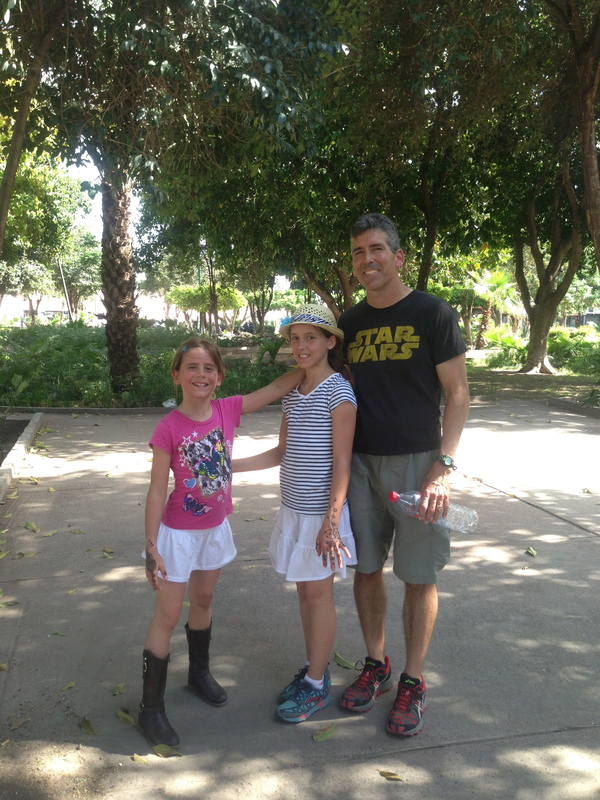 But… outside of town live Michelle, Eric and Barbara who are Americans with whom we instantly felt at home. 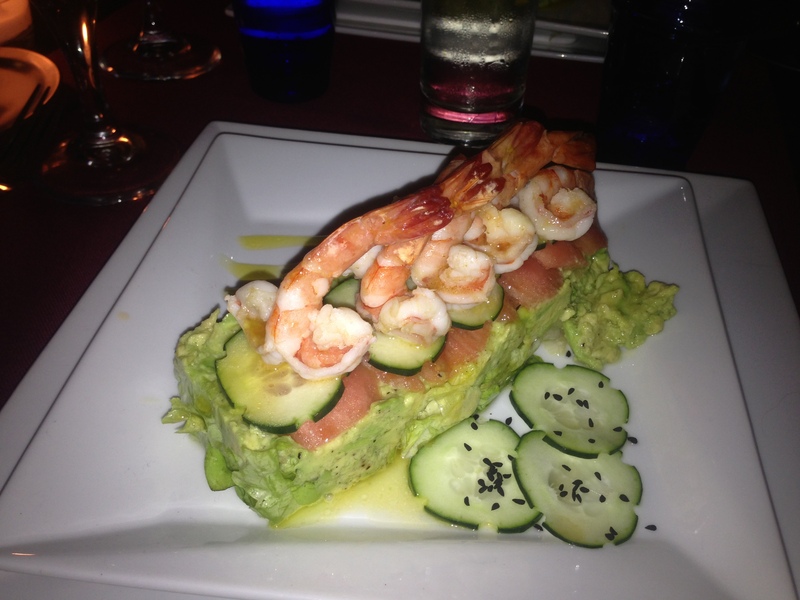 Thanks for the amazing food! 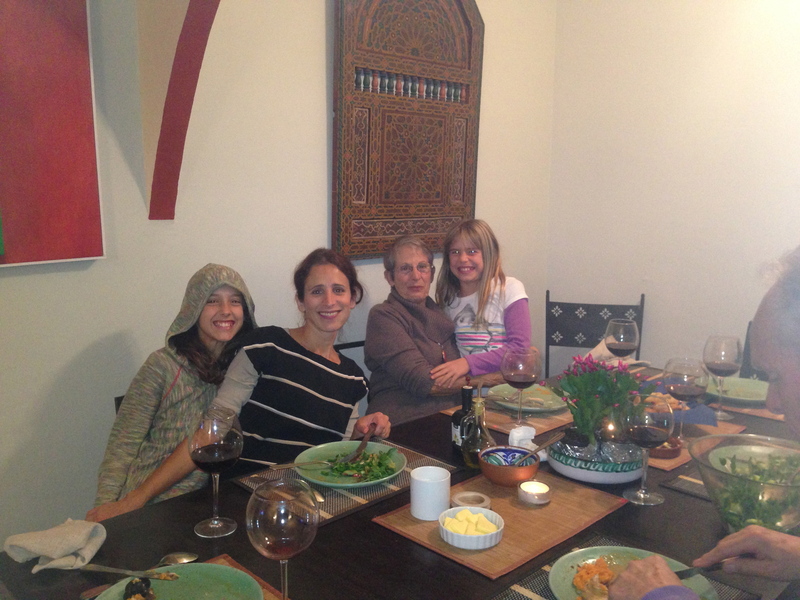 Although they hardly knew us, Michelle and Eric invited us to spend Thanksgiving with them. They promised turkey, stuffing and football. How could we refuse? 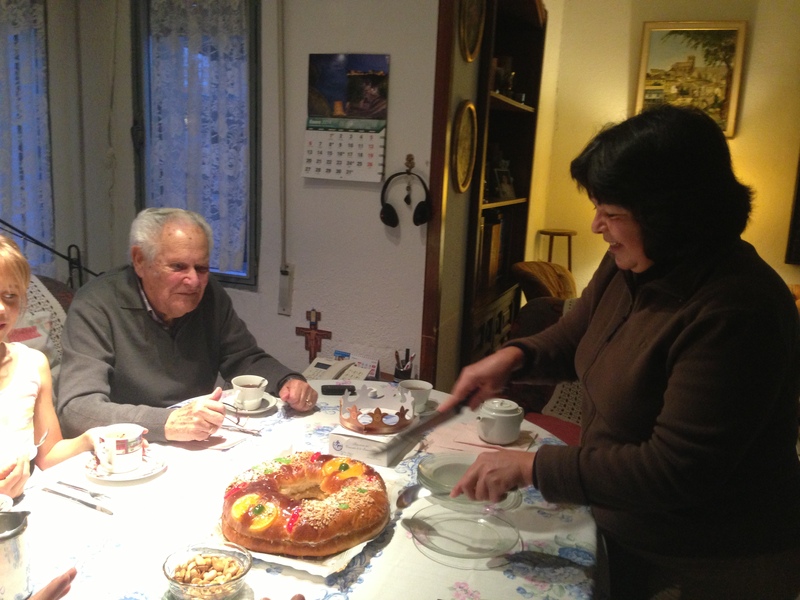 Of course Thanksgiving is not celebrated in Spain but it is the one holiday that seems to inspire some homesickness for me. It is not about the food, most of my Thanksgiving memories involve my grandmother making a special dish just for my cousin and me. We are both vegetarians and being from Illinois, that might just mean that we are mutants. 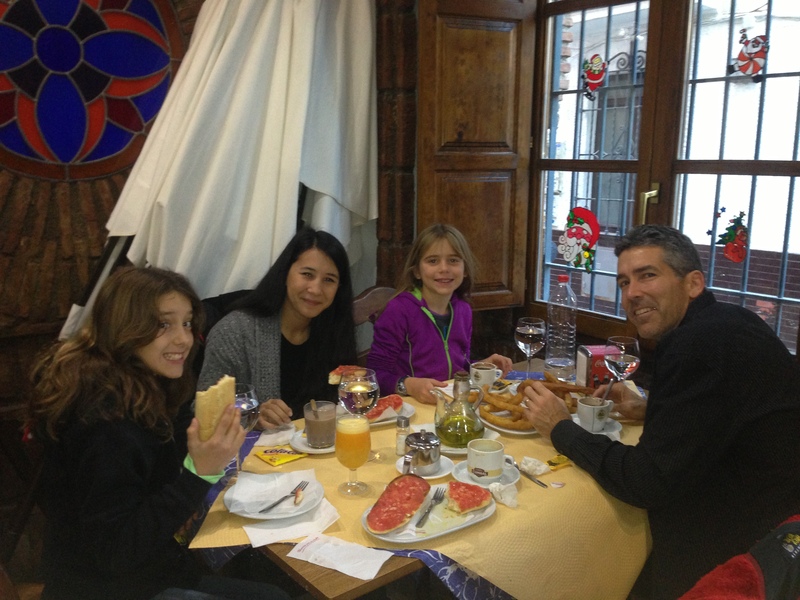 Maybe it is a recessive trait but for a family of farmers from Illinois, vegetarians are about as rare as they are in Spain. Anyway, Grandma Ann always made an mushy eggplant and velvetta dish for my cousin Lindsey and me. At the time it wasn’t my favorite but here in Spain I found myself longing for it in the days leading up to Thanksgiving. No, Thanksgiving is not about the food and certainly for me it is not about the football. It is about it being an American holiday. 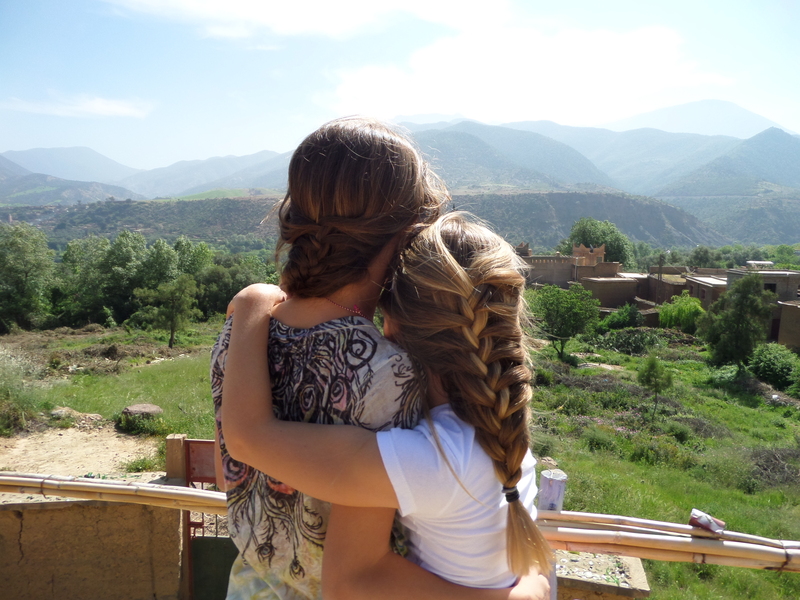 It is about being in a place where you feel completely comfortable and belonging. 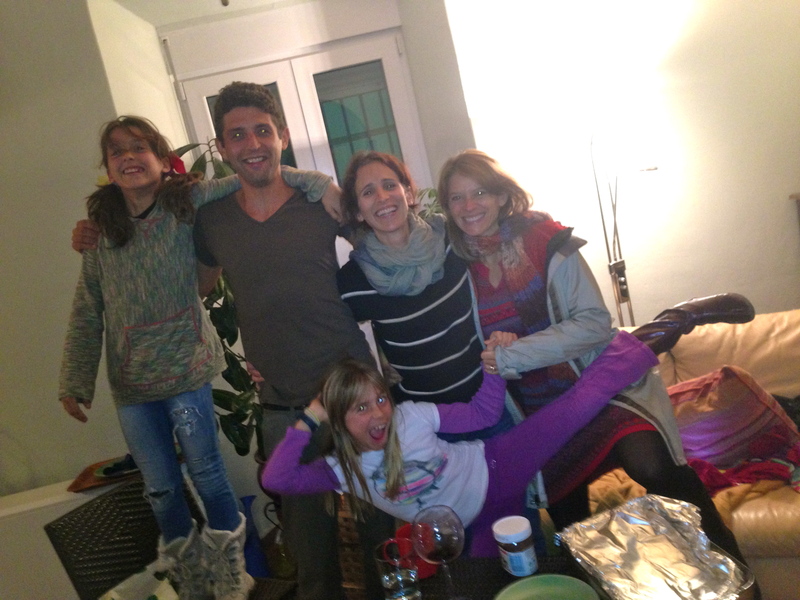 I am enjoying this year abroad and we have glimpses of belonging amoungst our new friends. 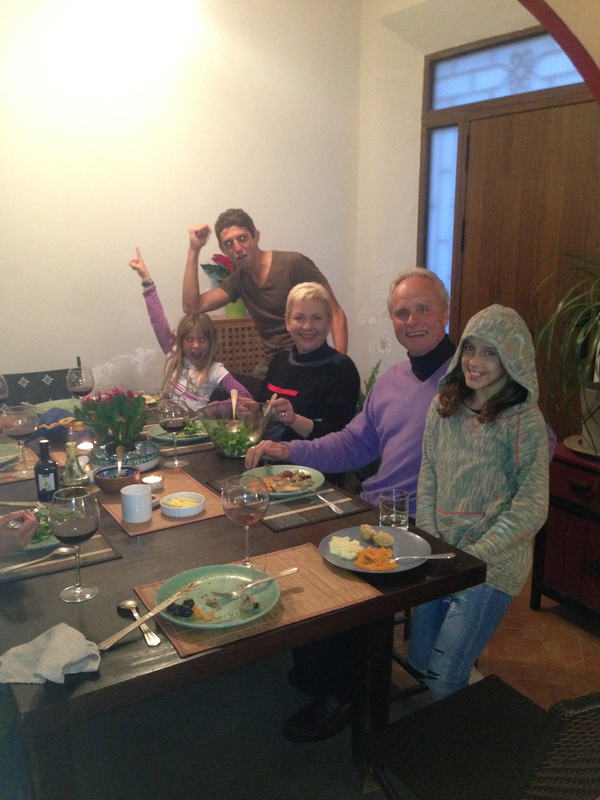 However, there is nothing is more homey than Thanksgiving on the farm with family. 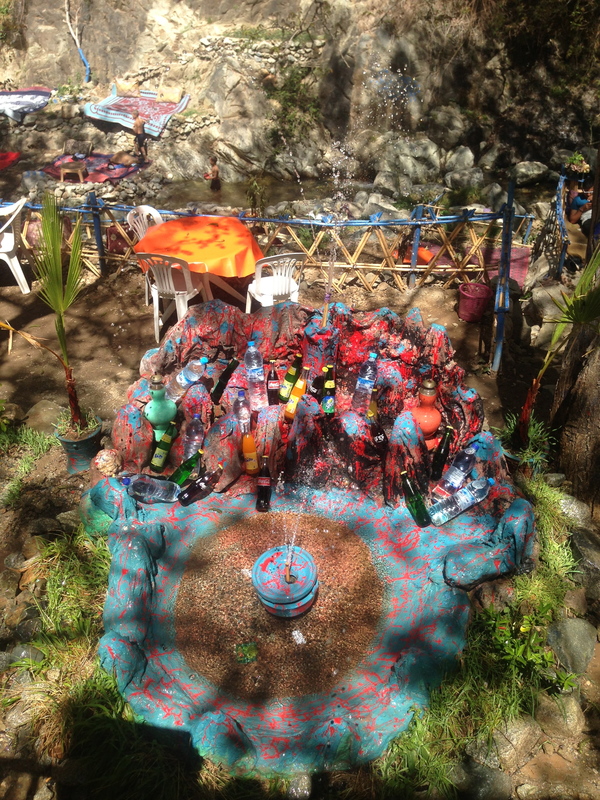 Michelle and Eric live in a very cool cottage near the village of Santa Cruz de Comercio. Michelle is a writer and Eric is a musician. They are also runners so we were instant friends with that alone in common. 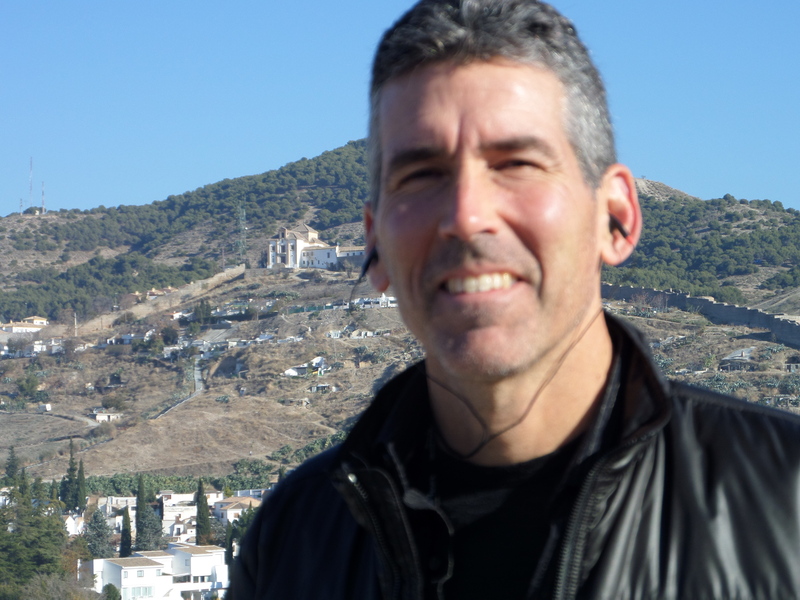 Eric also stars in one of my previous posts: Team Kezmoh Runs to Nerja. 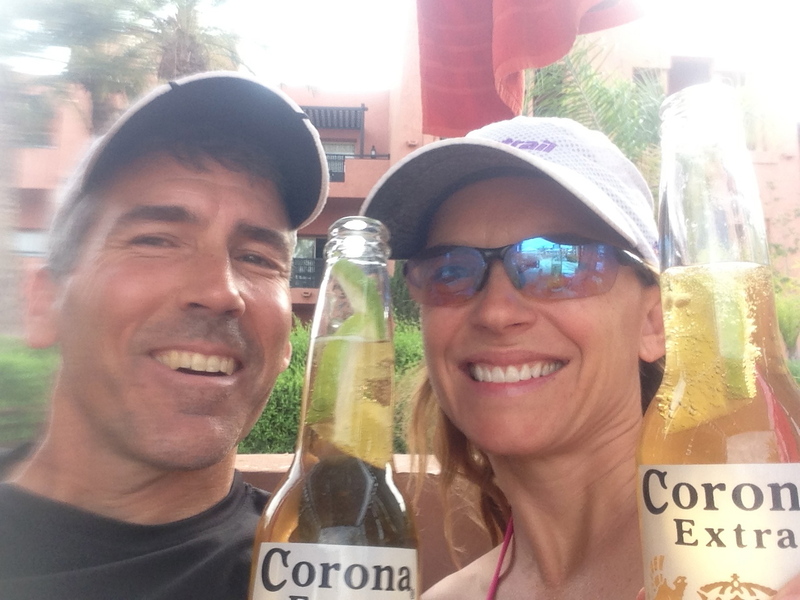 Michelle, Eric and Barbara along with our friend Paul Bateson put on 2 amazing trail races near Alhama de Granada: Ultima Frontera which I ran and wrote a post about in October: Ultima Frontera Race report. The other race is in July. 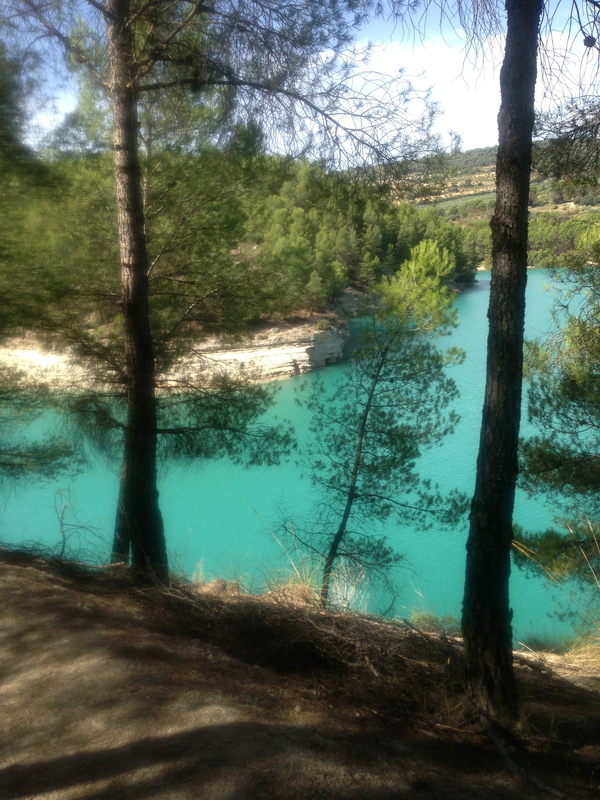 It is called Al Andalus Ultimate Trail . 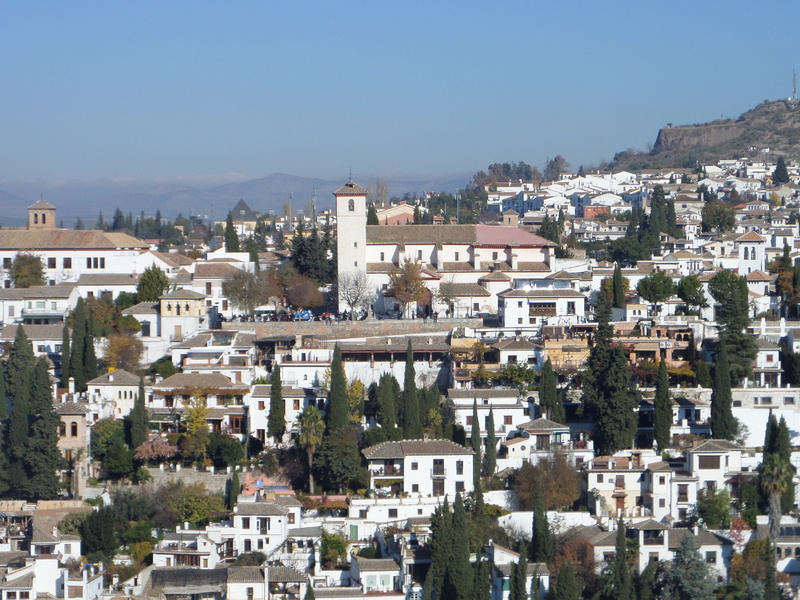 It is a 5 day 230 km stage race based in and around Alhama de Granada. 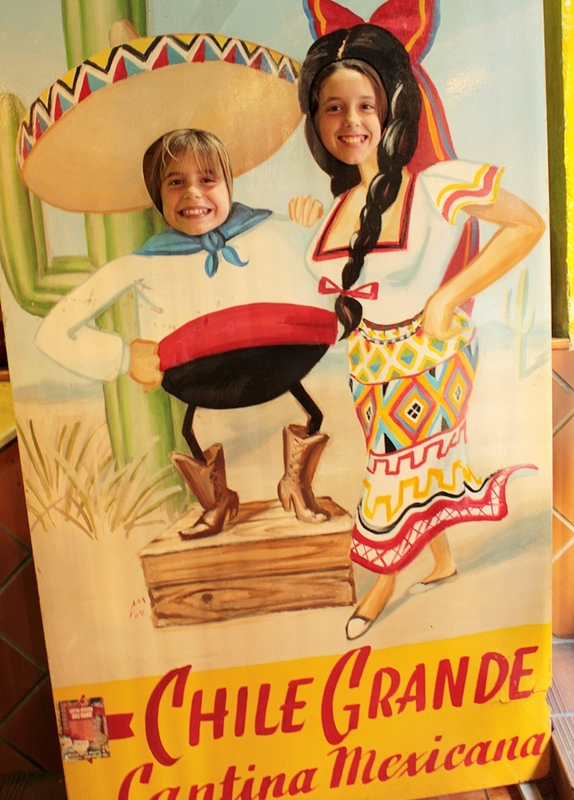 Sadly we will be back in California by then so we will miss the fun. Anyone interested in running with me in 2015? We arrived armed with a big bowl of sweet potatoes and empty tummies. 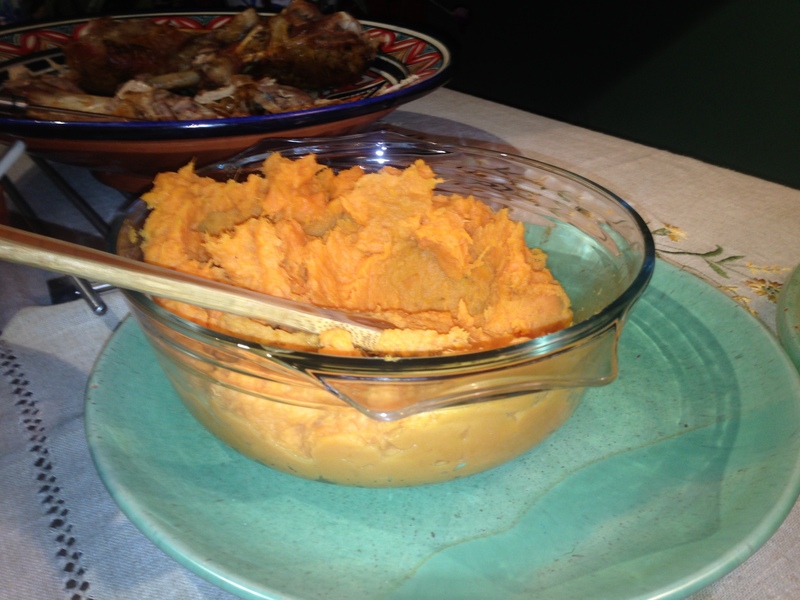 Sweet potatoes, my Thanksgiving specialty. Our new friends welcomed us with hugs and kisses. They introduced us to Alina and Lawerence Strong who were strangers to us then but have become like family to us in the past months since we met them on Thanksgiving. 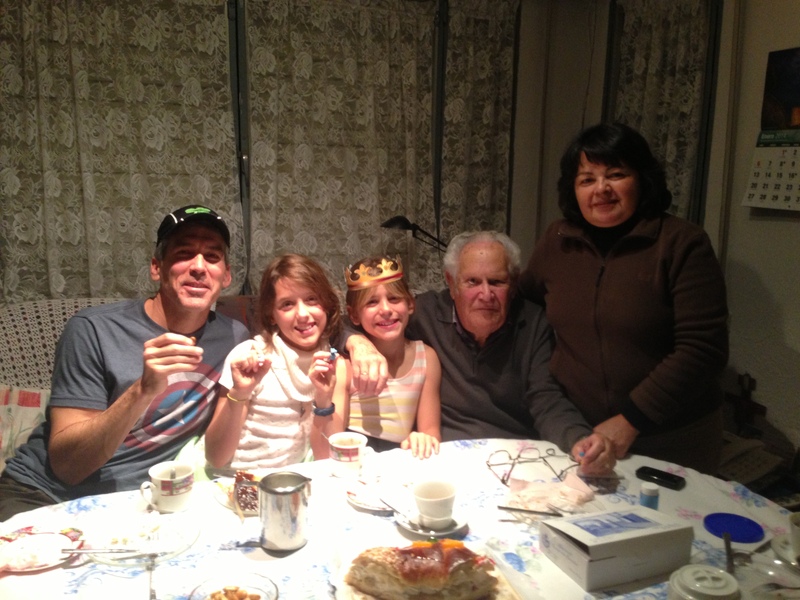 Thanksgiving 2013 fell on the first day of Hanukkah so our first course was a delicious matzo ball soup. Michelle read a blessing and lit a candle. 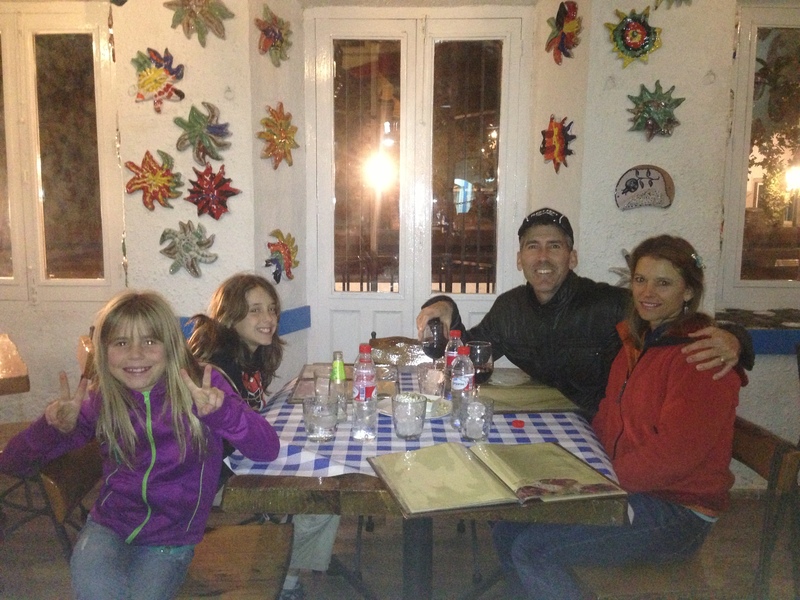 We sipped Spanish wine, and ate turkey that had to be ordered specially because it is not normally sold in local stores. The kid’s table. An international Thanksgiving tradition. We enjoyed the food and the conversation. 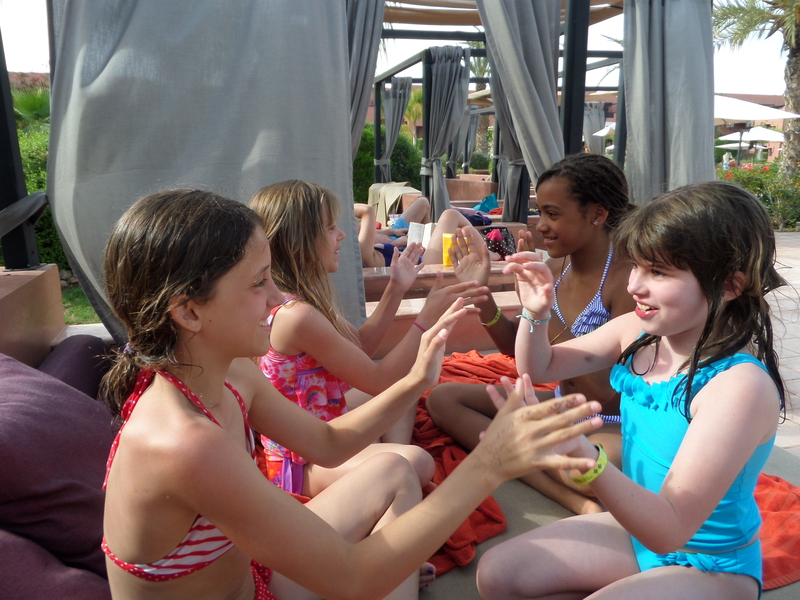 Sky, Michelle, Barbara and Savannah. 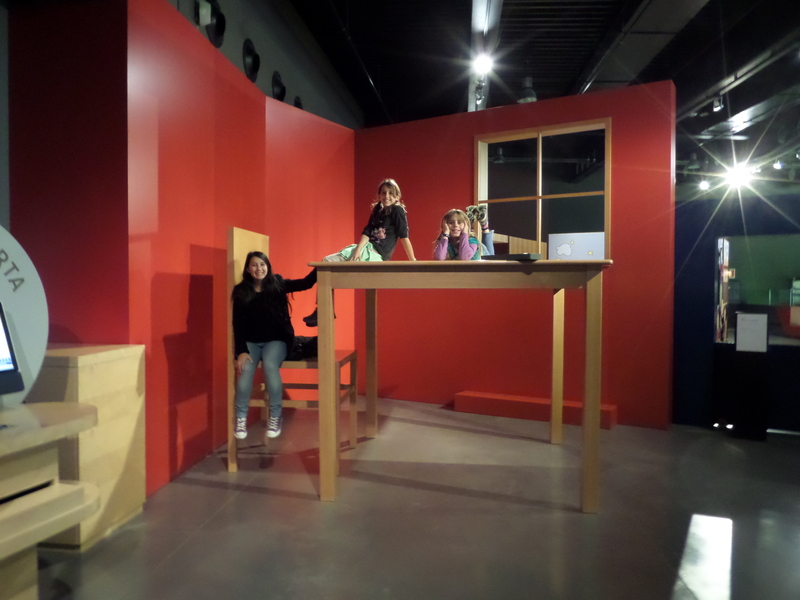 I love it that the girls posed with each side of the table! 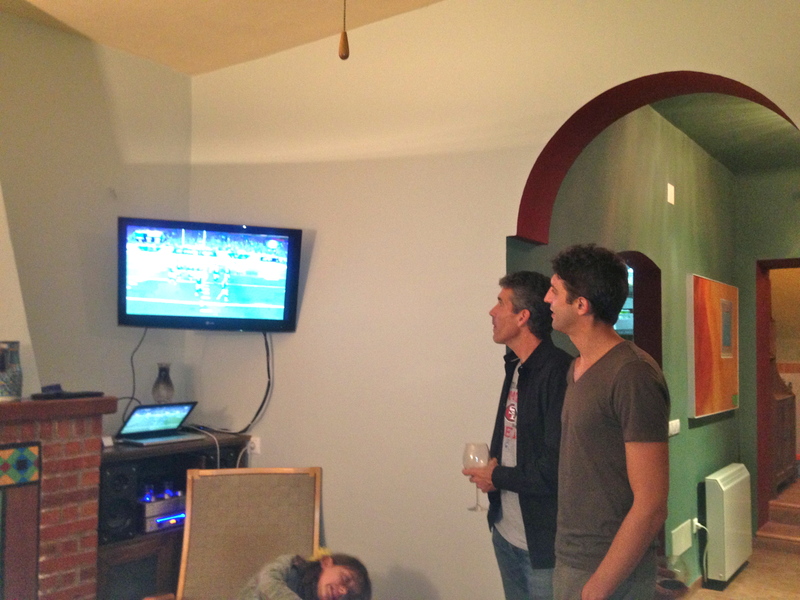 After dinner Sky and Savannah pulled out their iPads and the boys enjoyed some American football. 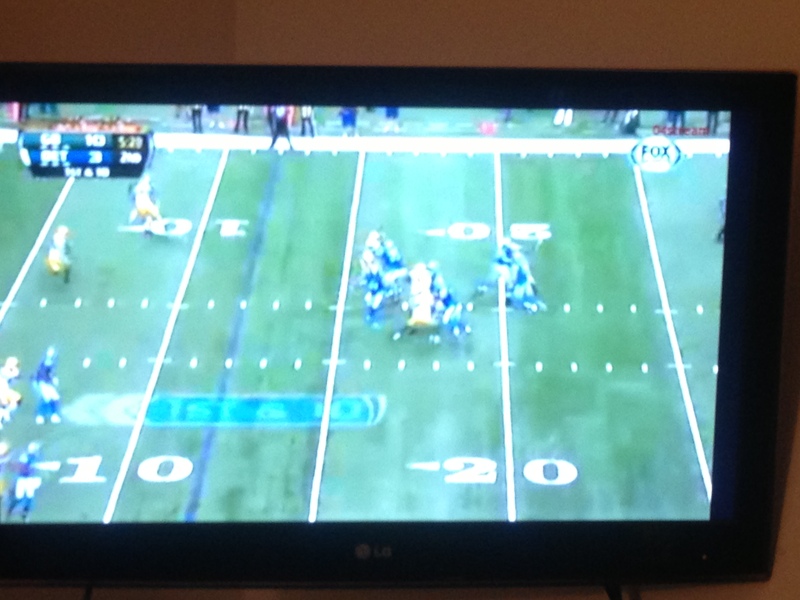 Getting to see Football was exciting for Mike because it is just not on TV here. Eric was able to download it from the internet. 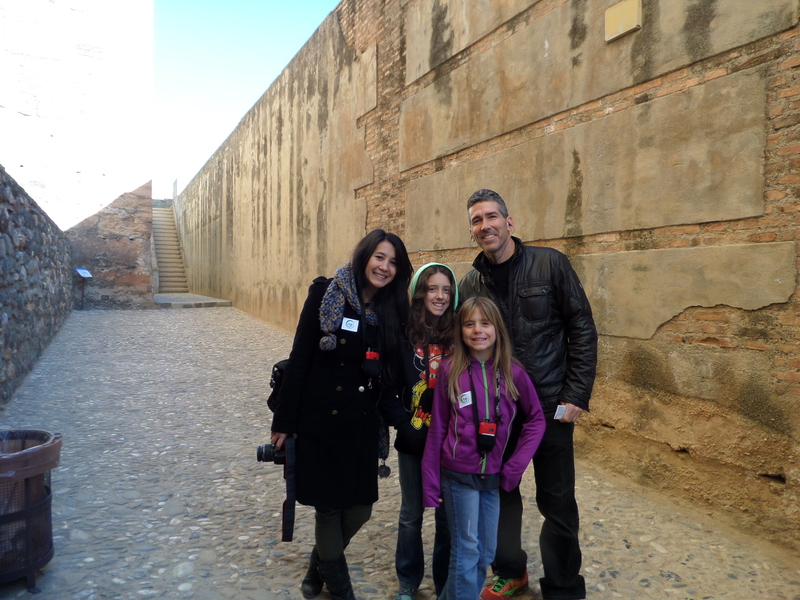 We spent the day with our new friends and felt like we were beginning to have a family here in Spain. A year later I looked back at these pictures and felt Thankful for friends and family both here in California and across the pond. 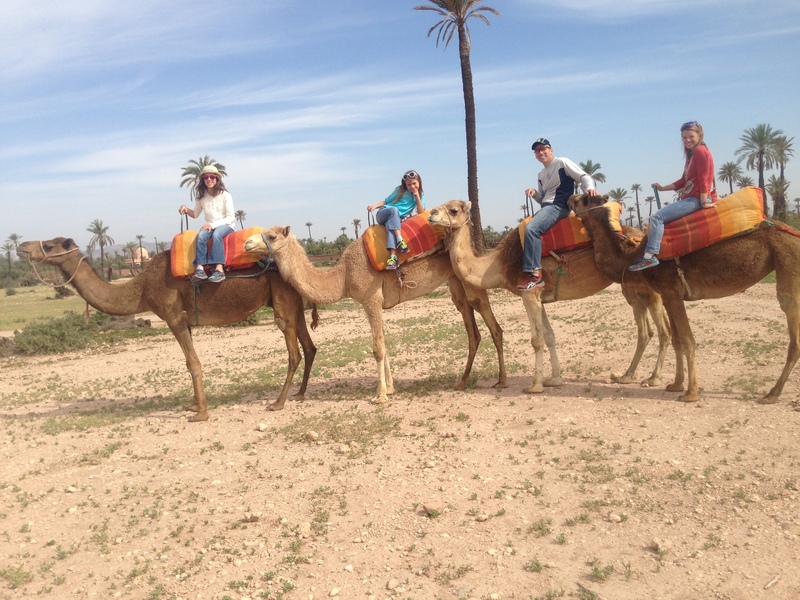 For some reason in my North American mind it was very important that we ride camels while in Morocco. Never mind that there were good roads in Marrakech and that no one was riding around on camels, we still felt compelled to find some camels. 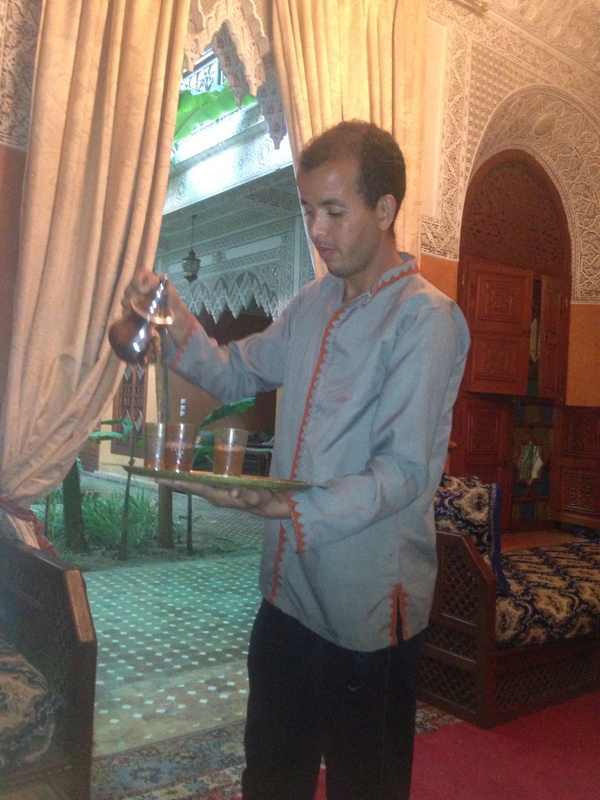 Youssef, our host in Riad Jardin Secret arranged for a driver to meet us outside the rampart wall. His car was modern and comfortable and stood out amongst the tiny run-down cars that are common in the medina. 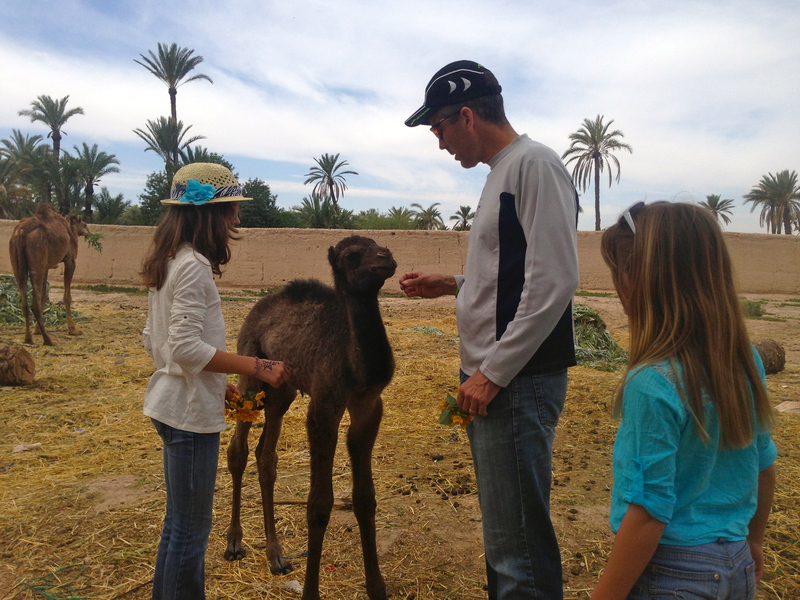 He explained that we were off to ride, not camels, but dromedaries. Camels have 2 humps while dromedaries have only one. Who knew? As it turns out we really knew nothing about camels/dromedaries. One thing that I have really enjoyed about traveling is learning new interesting facts. 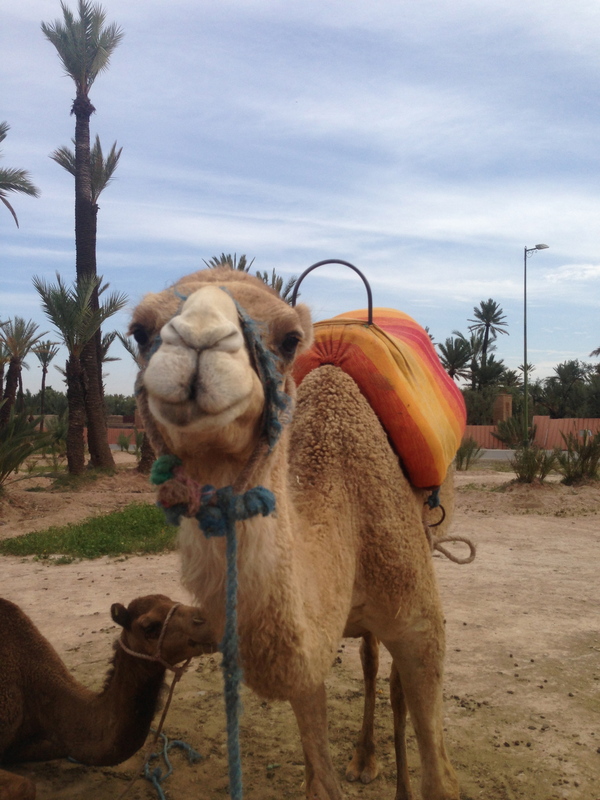 Dromedaries are cool! Here we go, ready to ride some Dromedaries! 1. They do not store water in those humps. Nope, the humps are fat. 2. So if the humps don’t store water, how is it that they can go so long without water? This is the cool part: Camels are really good at minimizing water losses. 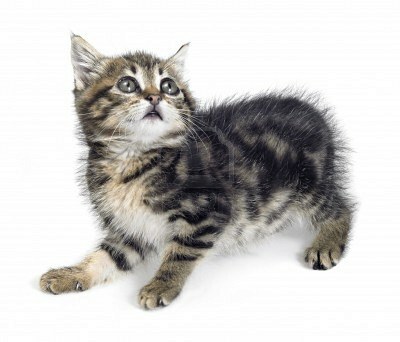 First, they have very little urine output and there poop is very, very dry. Camel urine is as thick as syrup and their poop is so dry it is burned by nomads in the desert for fuel. Secondly, they don’t lose as much water during breathing as humans do. Have you noticed that they have unusually large nostrils? Hot air is inhaled and cooled in spiral turbinates in the nose. When air is exhaled it is cooled by the turbinates and water vapor condenses just like dew on grass. This water is reabsorbed by the camel. Is this guy smiling for me? Really big nostrils! 3. Even their blood is different! A camel’s red blood cells are actually oval rather than circular like most other mammals. This facilitates the circulation of blood when they are dehydrated. It also allows them to tolerate osmotic variations that would kill a human and cause our red blood cells to explode. 4. Camels can tolerate up to a 40% loss of their body weight in water! That would be like a 180 pound (81 kg) man losing 72 pounds (33 kg) of water! 5. Camels can run 40mph for short stretches and can sustain a speed of 25mph. 6. Camels live 40-50 years. 7. Camels can drink 200 liters (52 gallons) of water in 3 minutes! Flower? 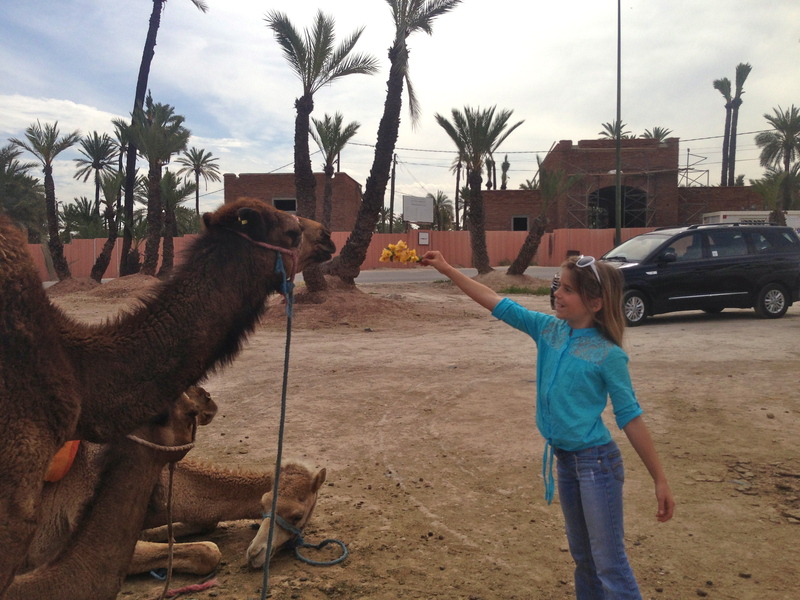 Savvy meets her dromedary. 8. Camels tolerate enormous fluctuations in body temperature. Their body temperature can range from 34 °C (93 °F) when they get up in the morning to 40 °C (104 °F) by sunset! Now you can fascinate and impress your friends with your new knowledge of camels/dromedaries, an added benefit of following Team Kezmoh! I think Sky and this dromedary are laughing at the same joke! 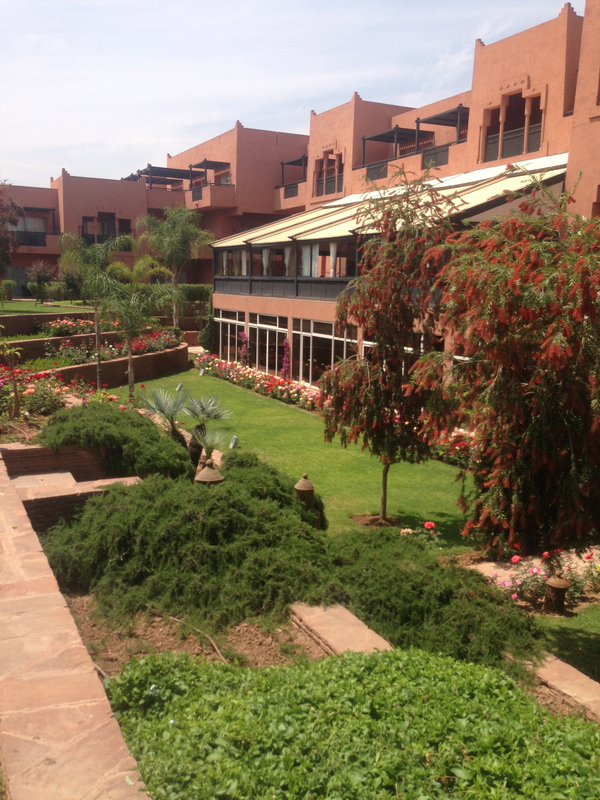 We drove to an area of Marrakech called the Palmerie. Although the landscape was completely flat, the road twisted between the palms. Abdul explained to us that it is a crime punishable by fine or imprisonment if you cut down a palm tree. The trees are older than the road, thus the curves. Along the way we passed many roadside camel stands just waiting for tourists to come along and rent a ride. 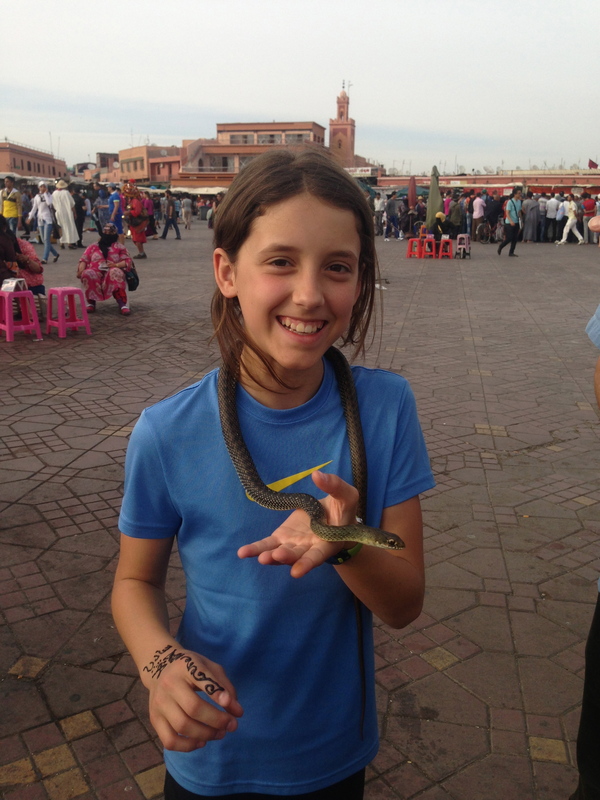 Somehow I thought we would be in the desert and that it would seem less touristy but Marrakech is an oasis and the desert is far away. 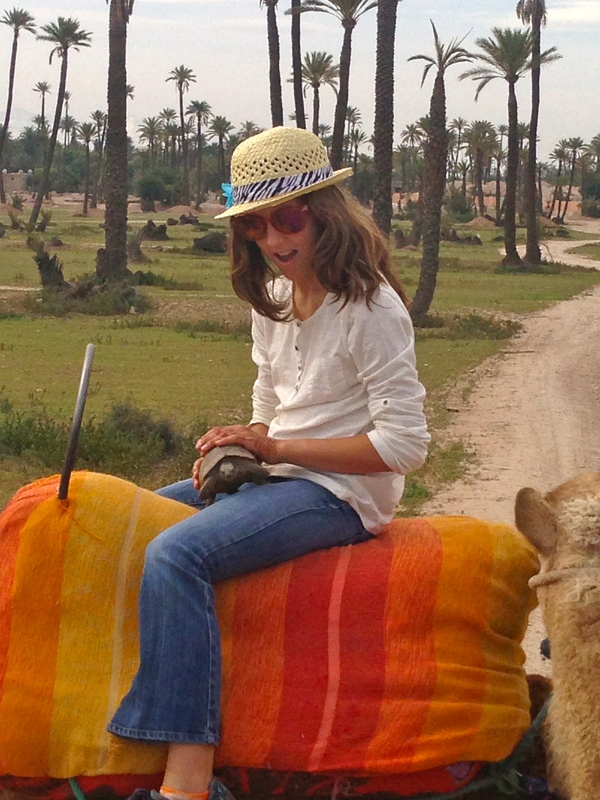 The truth is, riding a camel is a bit cliché, I realized. 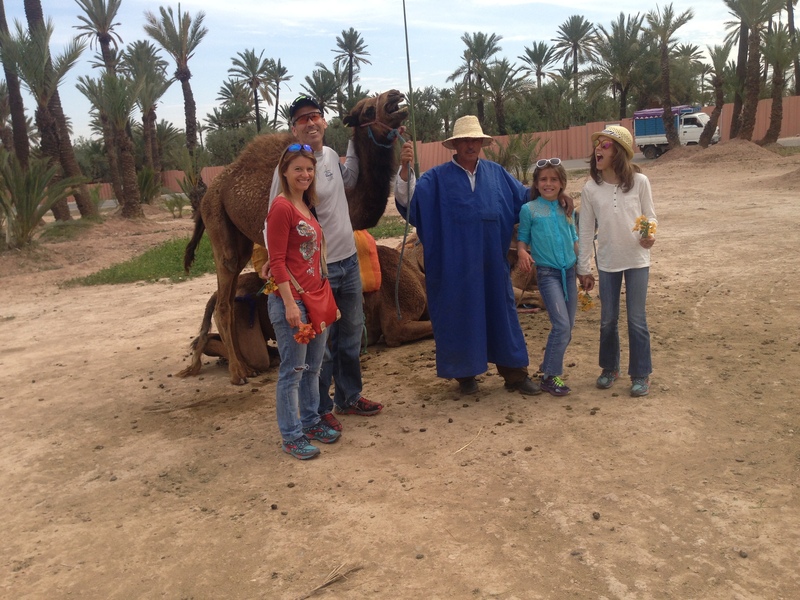 About 15 minutes from our riad we met our guide and our family of dromedaries. 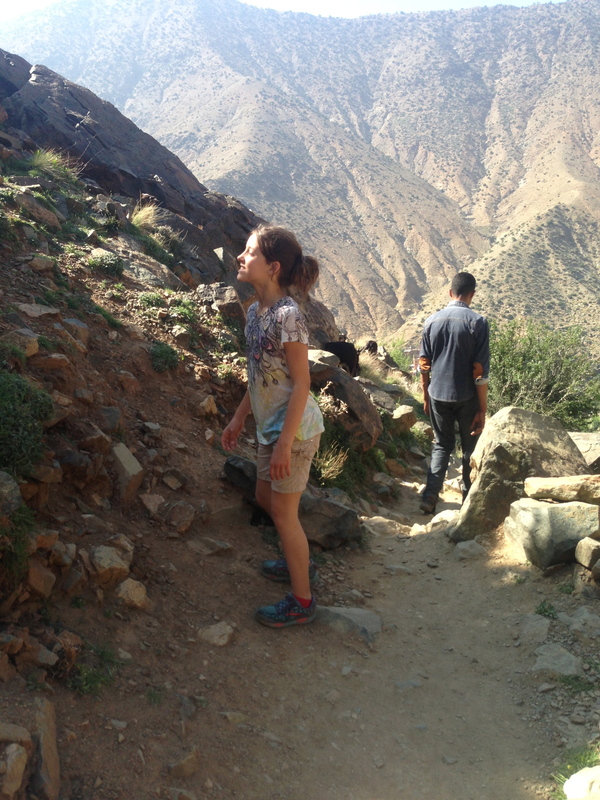 Team Kezmoh climbed onboard our new friends and had a loop around the Palmerie. 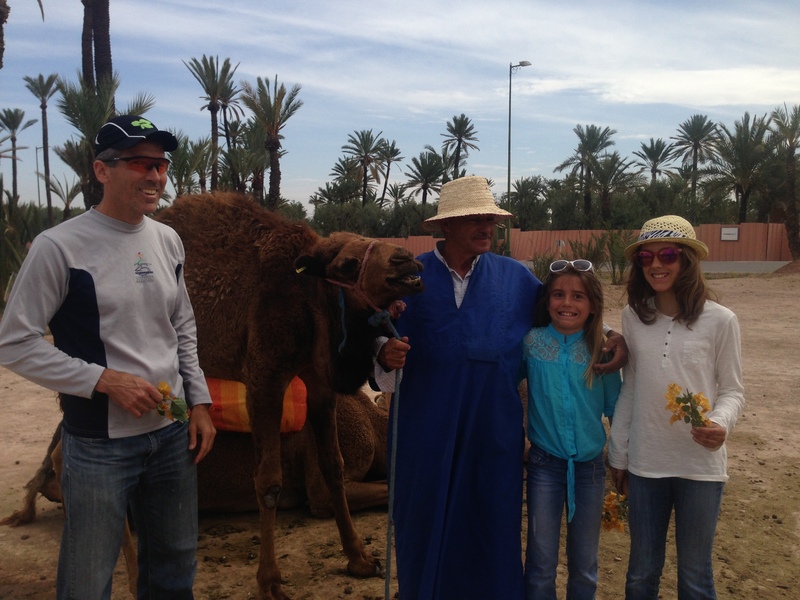 To be completely honest a camel ride is more of a photo op than anything else. 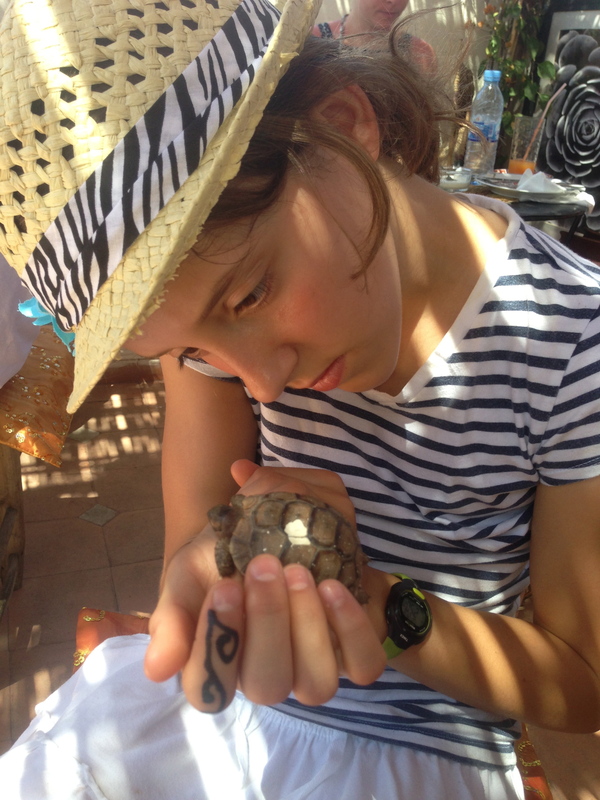 We did come across a turtle on the road and our guide saved him from our dromedary train. The highlight of the tour was when we returned to our base. 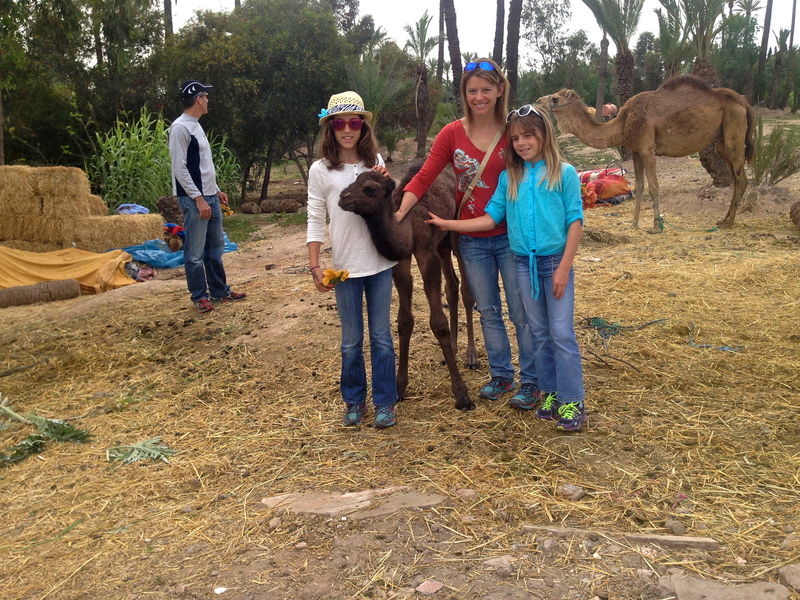 Our guide led us through the palms where 2 baby dromedaries and their mother were hanging out. The babies were 2 weeks old. One baby was nursing while his mother ate from a giant pile of leaves. I imagine a 1000 lb animal must have to eat constantly to support a baby that size. 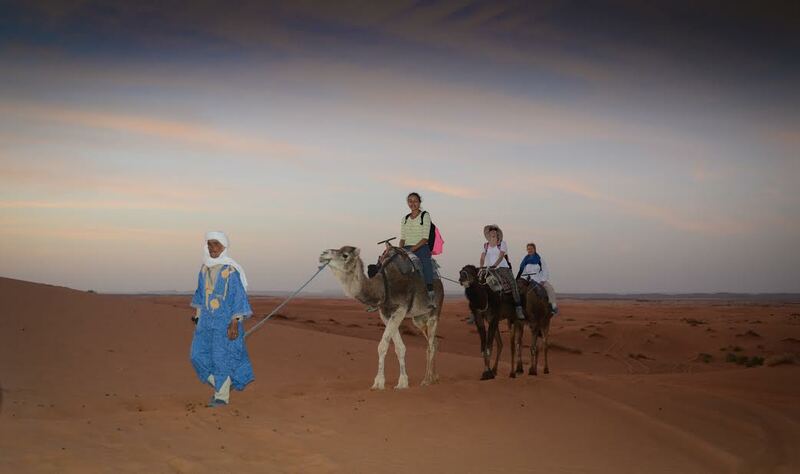 When we were satisfied that we had a full camel experience Abdul drove us back to the hotel. 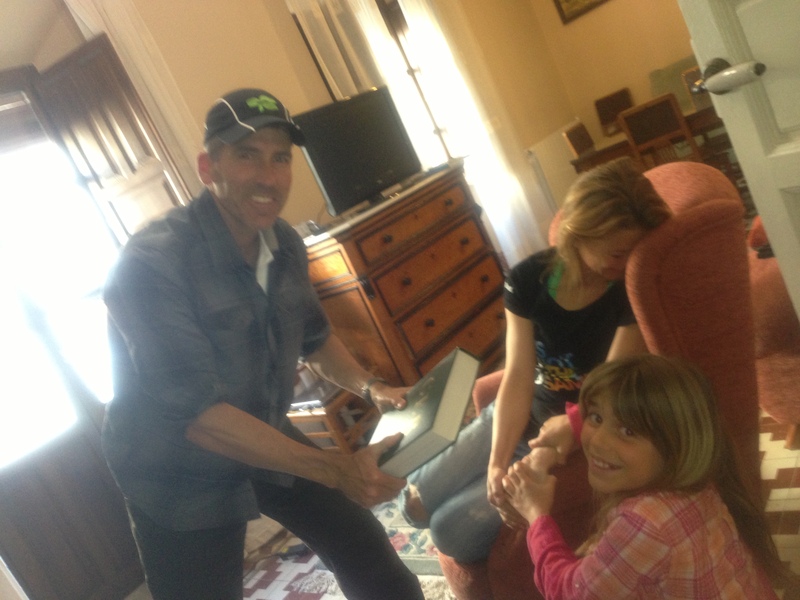 Shortly after we returned our friend Cathy Baker arrived with her daughter Jessica and Jessica’s friend Catherine. Mike and I work with Cathy back in California. 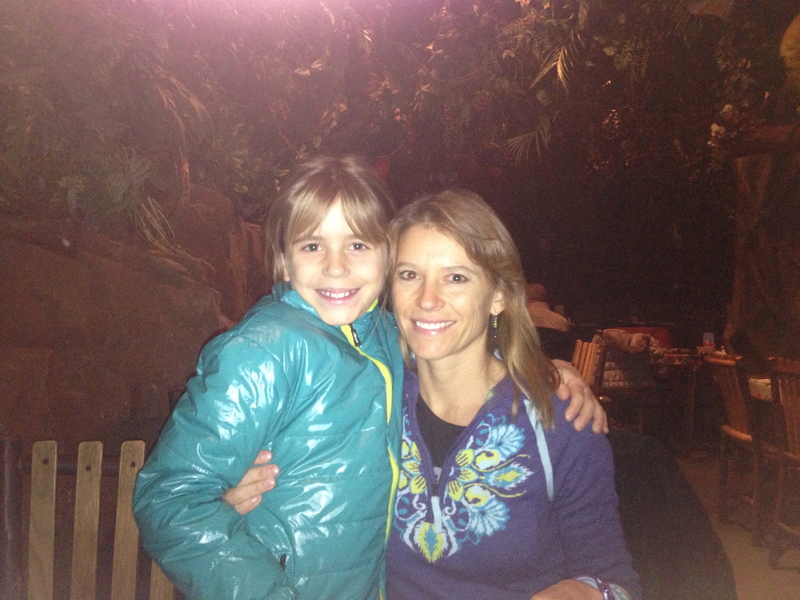 She is a dear friend and she actually is the obstetrician who brought both Sky and Savannah into the world. 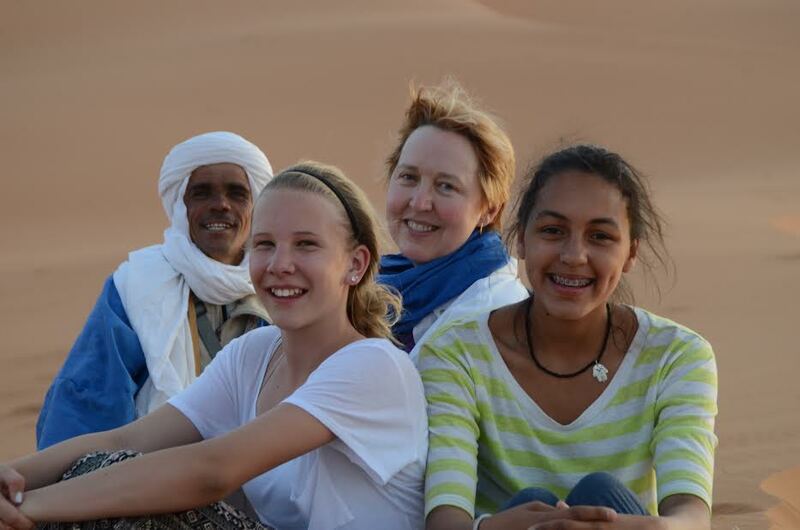 Cathy had been a Peace Corps Volunteer before medical school and lived in Oman. 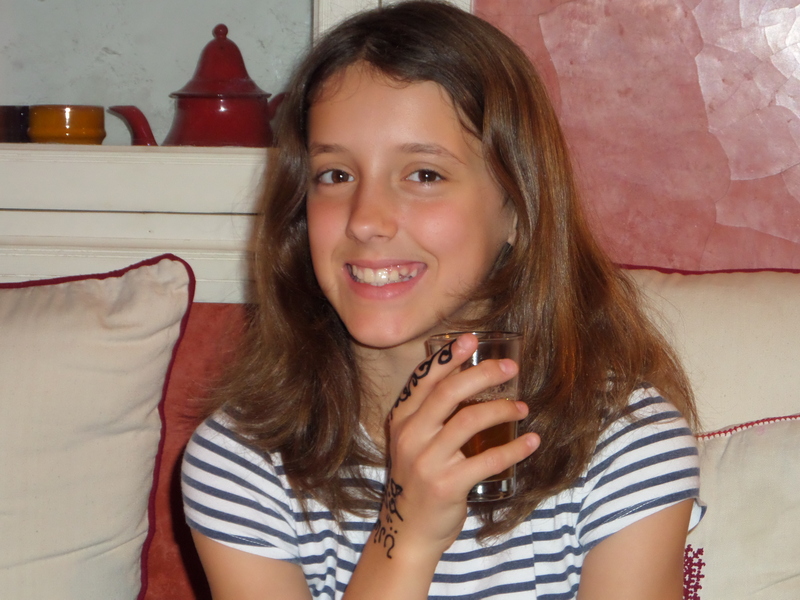 During that time she learned Arabic so she was excited to come to Morocco. 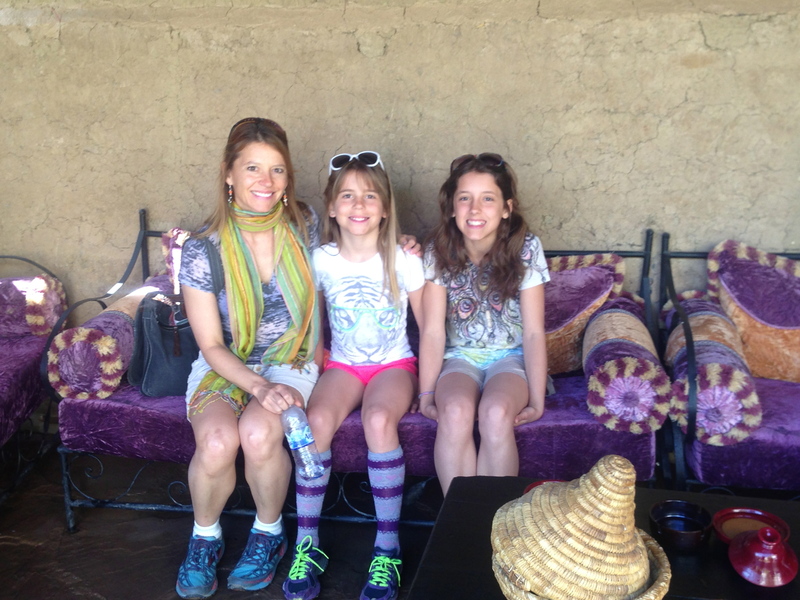 Sky and Savvy were fast friends with our new visitors and the little band of girls quickly disappeared together to explore the riad. New buddies. 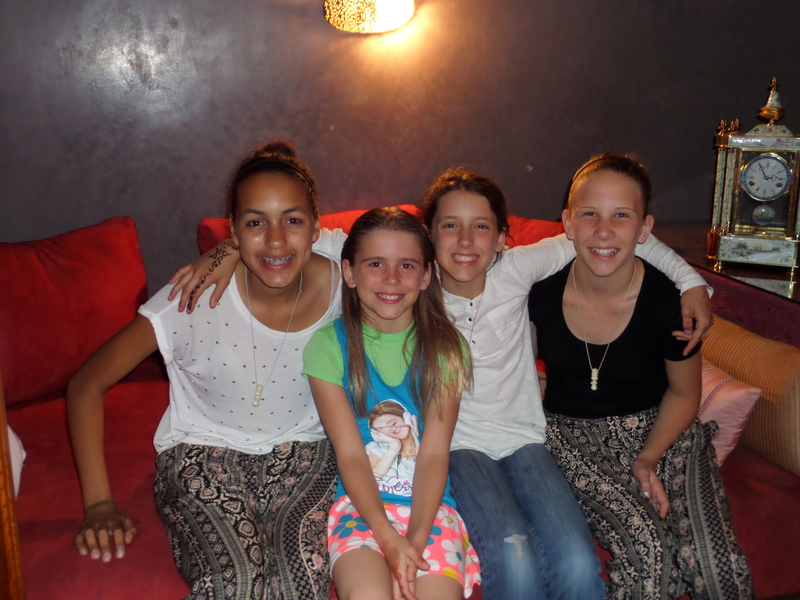 Jessica, Savannah, Sky and Catherine. 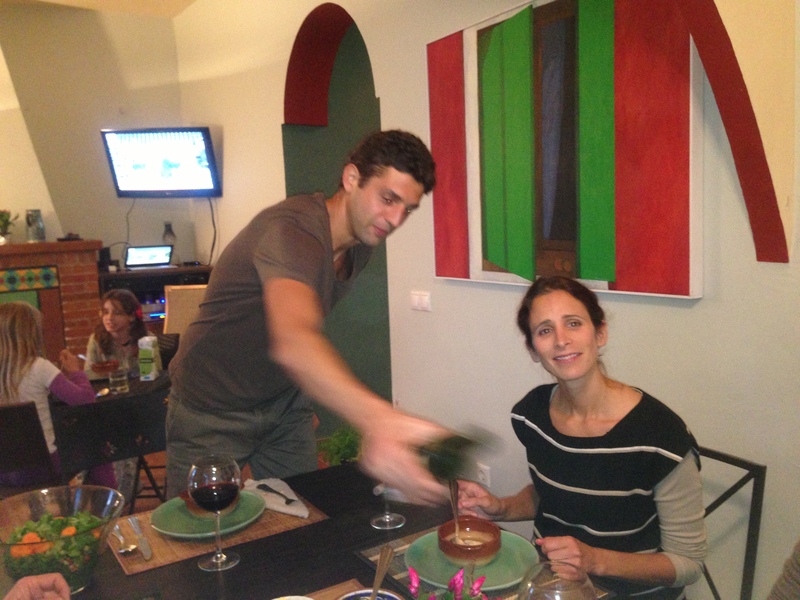 That night we asked our hosts Melika and Youssef to recommend a restaurant. 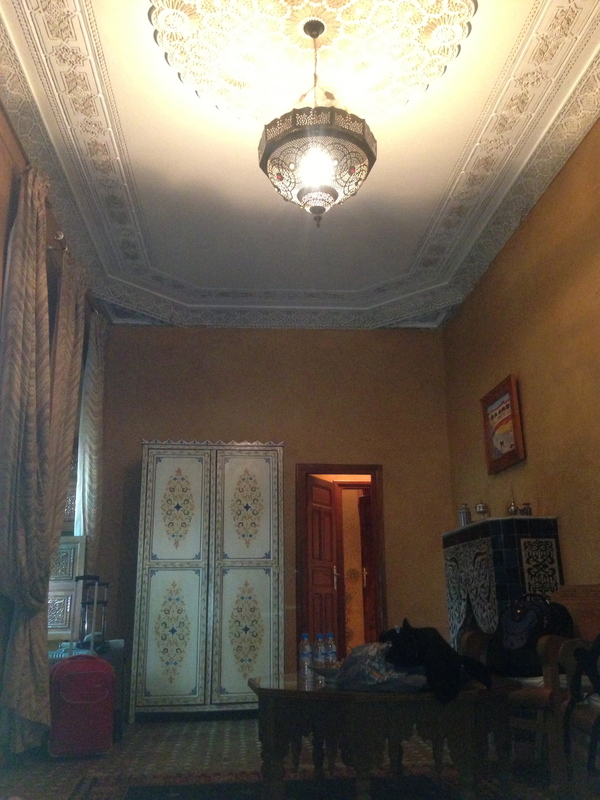 They recommended Riad Riaffa which promised good food and belly dancing. 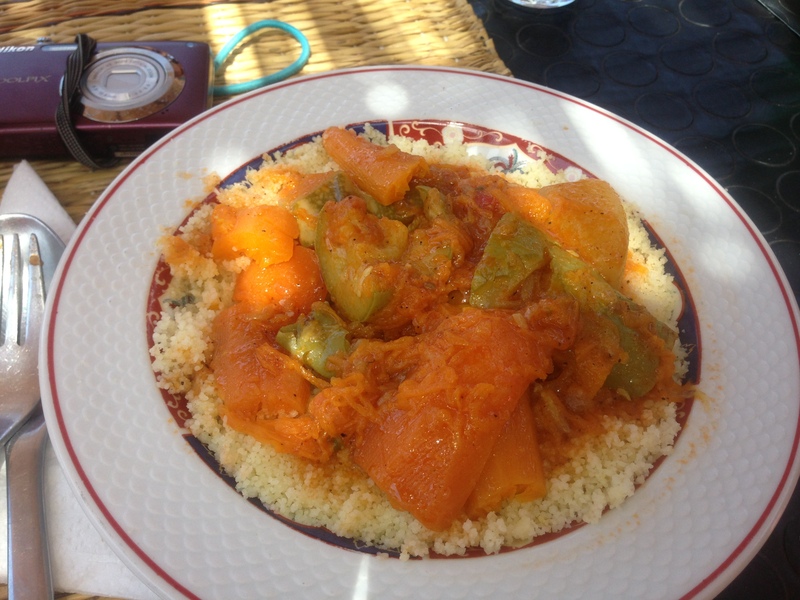 We ordered a variety of traditional Moroccan tagines and salads. 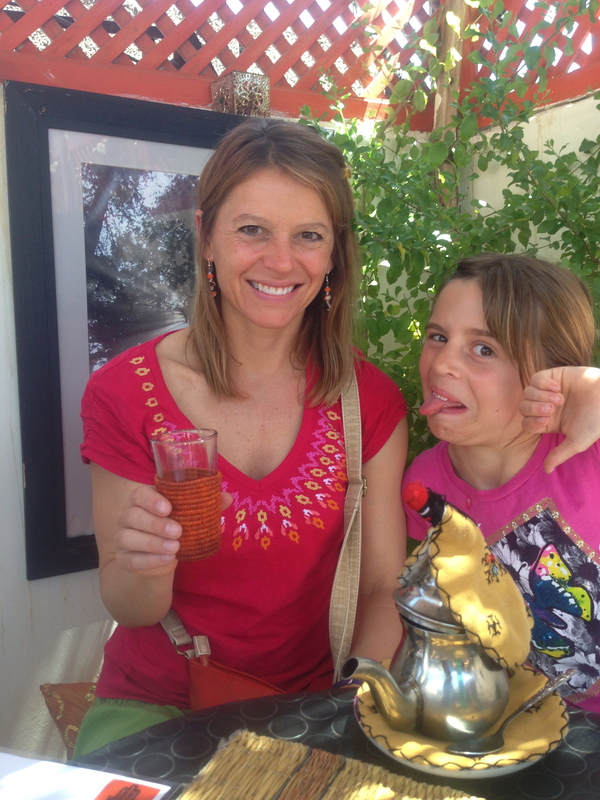 Although most Moroccans do not drink alcohol it is available to tourists. We had a bottle of Moroccan wine which was pale in comparison to the delicious Spanish wines that we were used to but still good. 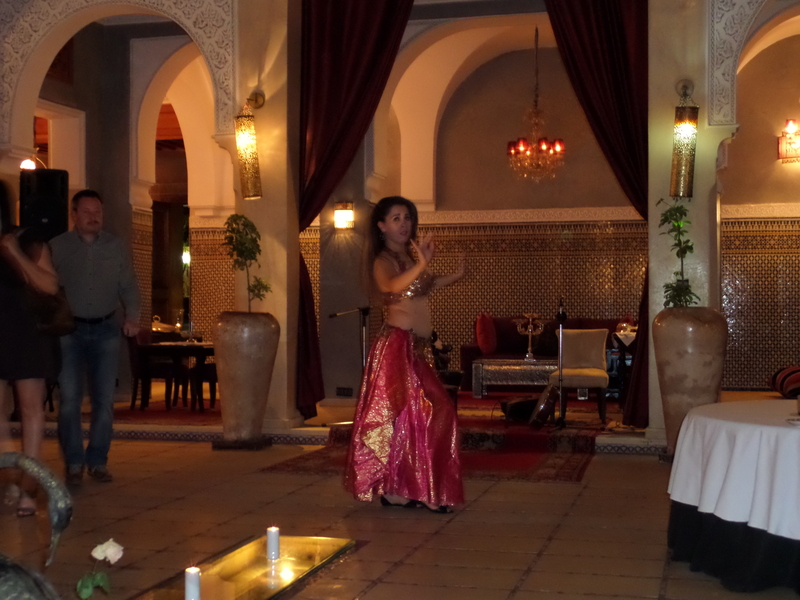 The highlight of our dinner was a belly dancing performance. I have a new appreciation for belly dancing after my time in Spain. Last September, just after school had started for the girls our friend Amparo approached me on the street with a clip board. She was collecting names to join her in a dance class at the sports pavilion. She told me that it would be danza del vientre. Humm, danza del vientre, I did not know what that meant but I was delighted to be asked to join any sort of exercise group so I signed right up. I thought maybe it would be Flamenco, maybe Zumba, maybe some sort of Spanish dancing. I arrived on the appointed day dressed to exercise. I was still too embarrassed to ask what sort of a class I had signed up for and by then I couldn’t even remember what she had called it. The instructor arrived, she was extremely fit. This must be Zumba, I thought. 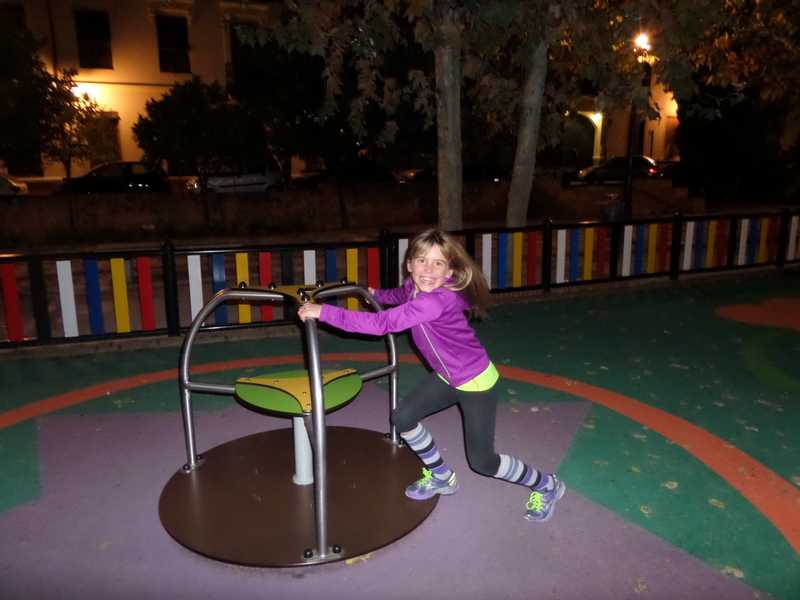 Marta shed her sweat pants and put on a tiny skirt over her tights. The skirt had little metal coins that jingled when she moved. “OH NO”, belly dancing! Belly dancing is probably the last type of dance that I am built for. It did cross my mind to get out of there right away but I stayed and gave it a whirl. 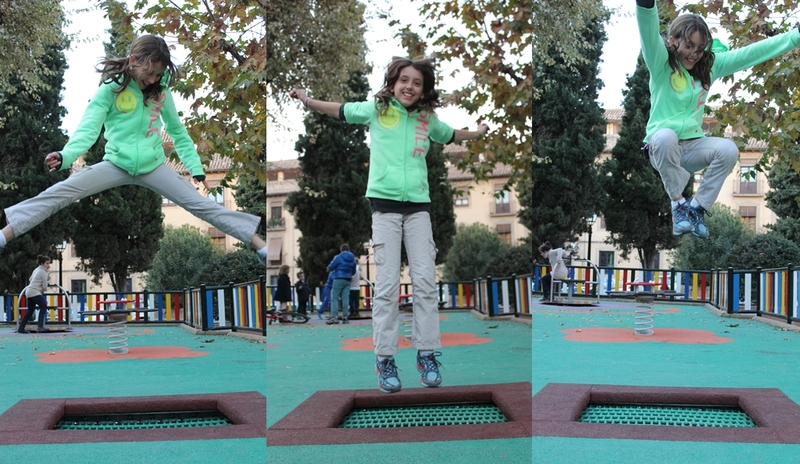 Marta instructed us to practice what we had learned at home. I went home and demonstrated some of my new moves to the team. We laughed and laughed, I looked more like a robot than a belly dancer. Walking home from my second class another student, Laura, explained to me that it wasn’t my fault, “Es que no eres Latina (It’s just that you aren’t Latina)”. So, no hope for me… I did continue the classes until February when it dwindled from 20 students to 4 and our instructor told us that we were just too few students to make the class worth it for her. 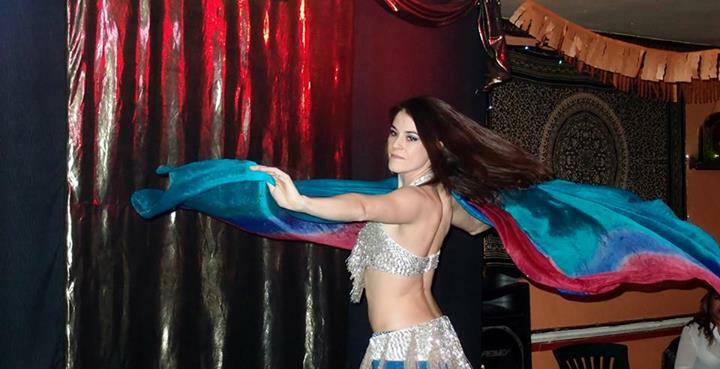 So my own, largely unsuccessful attempts to learn belly dancing definitely gave me a new appreciation for the sport. The belly dancer who entertained us while we ate was talented and I think I enjoyed the show more than anyone. Mike is not sure if he should look! 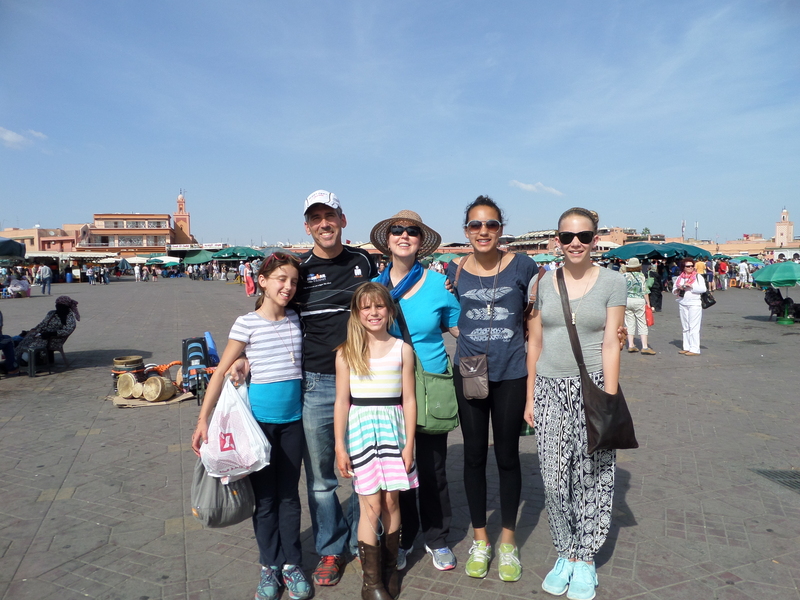 In the morning we went back to Djemaa el Fna (see Marrakech part 1) with Cathy and the girls. Cathy had promised Jessica a carriage ride around the city. We negotiated a price for 2 carriages and the 4 kids hopped in one while Cathy, Mike and I took up the rear. 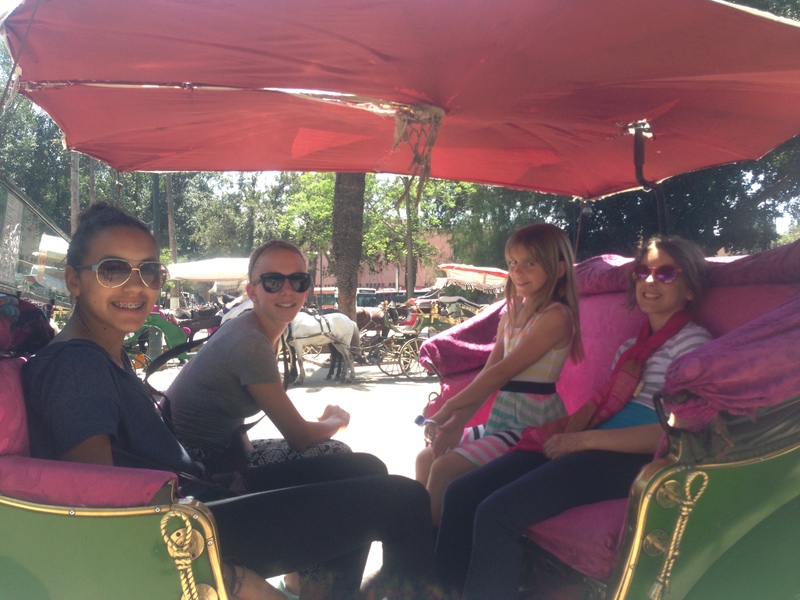 California girls on a carriage ride in Marrakech! 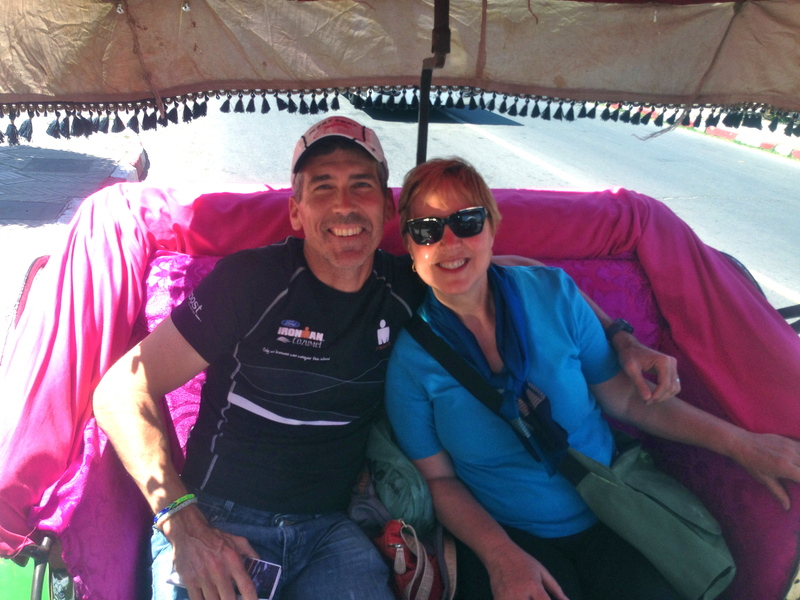 Our driver Ali spoke English and Spanish in addition to French and Arabic. He pointed out the sights as we passed and answered my questions. 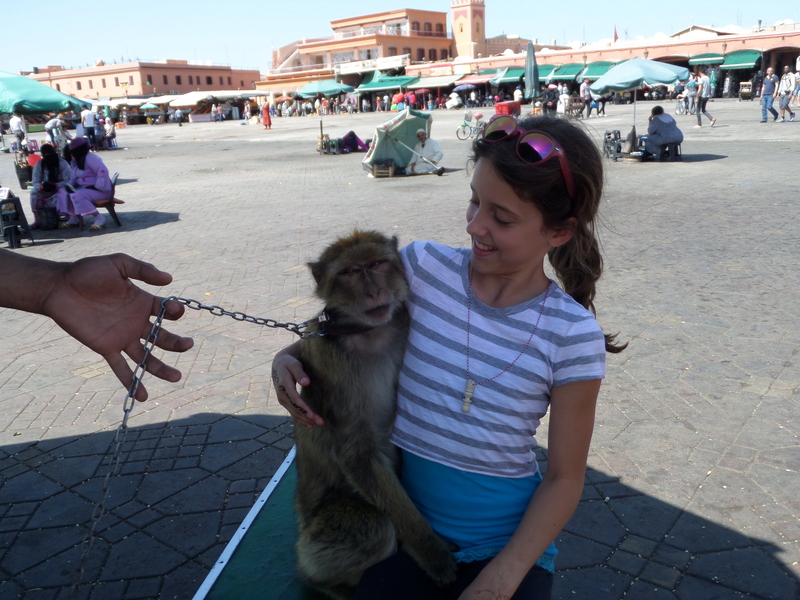 He was proud to tell me that Marrakech is a city that is open to visitors and that, in his opinion, people of all races were welcome. As we drove past the Royal palace he explained that King Mohammed is a popular and good monarch. 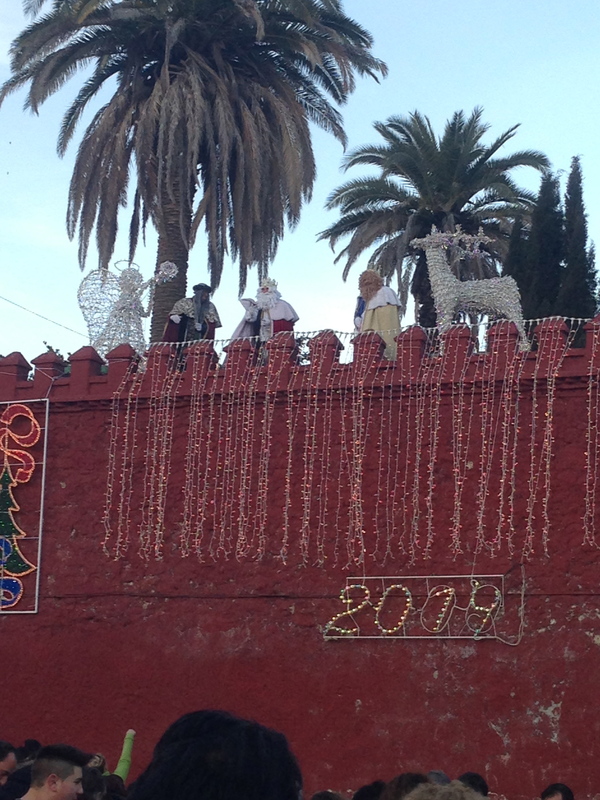 He pointed out storks that nest on the rampart wall to the 3 obstetricians in his carriage. See the stork nesting on the rampart wall? 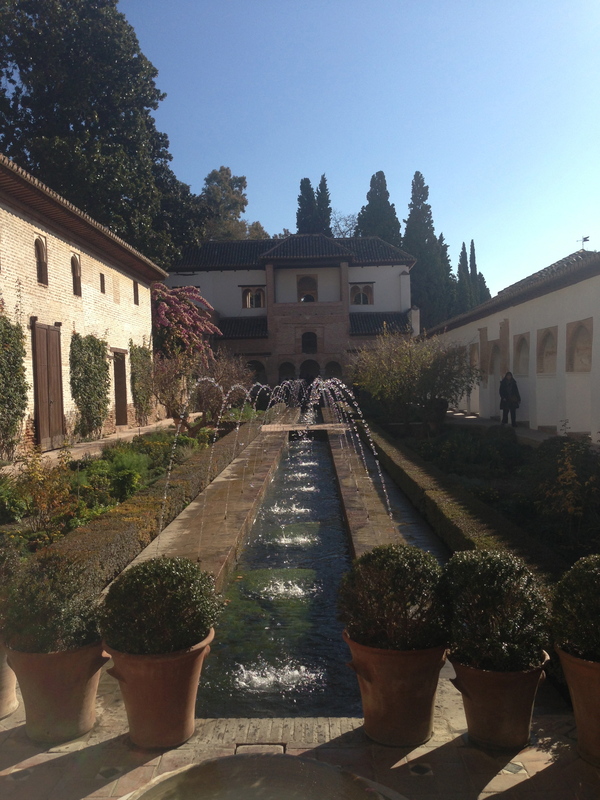 We trotted out of the medina and into an area of luxury hotels and upscale stores such as Louis Vuitton. 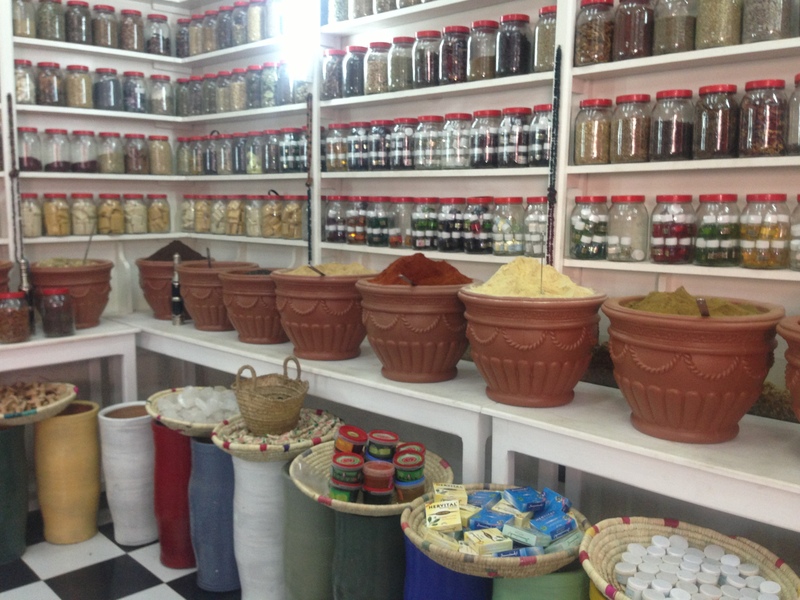 Once back in the medina we stopped at a spice store where we were given a tour of the wonderful herbs. 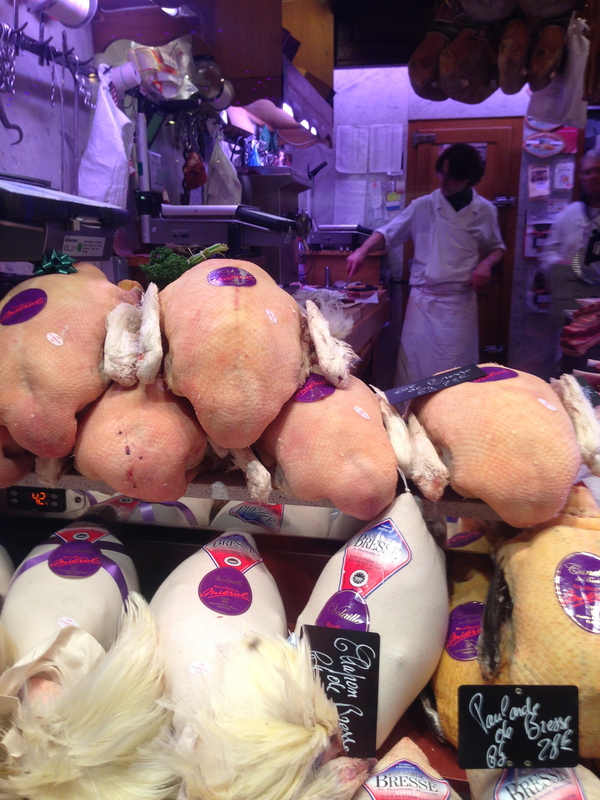 The smells in the store were divine. 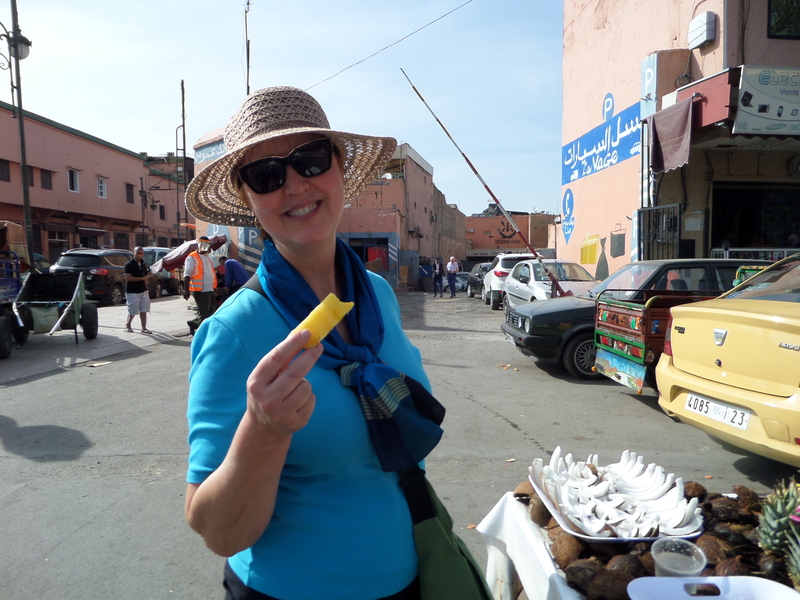 I bought a sac of spices that our guide promised was a mixture of 45 spices, “the secret to Moroccan cooking”. I have enough spice to flavor our cooking for years. (If anyone wants a bit please let me know!). 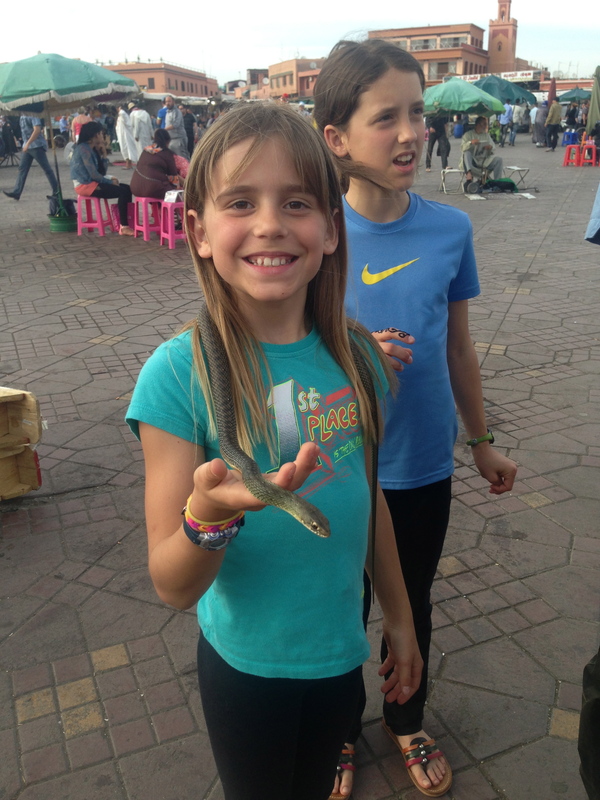 When our carriage tour of Marrakech was completed we plunged back into the chaos of Djemaa el Fna. I passed a wrinkled man sitting at a little table. As we approached he quickly covered his display with a large piece of cardboard. How odd, all of the other vendors called to us as we passed. He was quite obviously not interested in our little band of Americans. This piqued my curiosity. I stood apart from our group and watched him from a distance until he uncovered his table. TEETH! It was a gruesome display of molars and other various teeth. 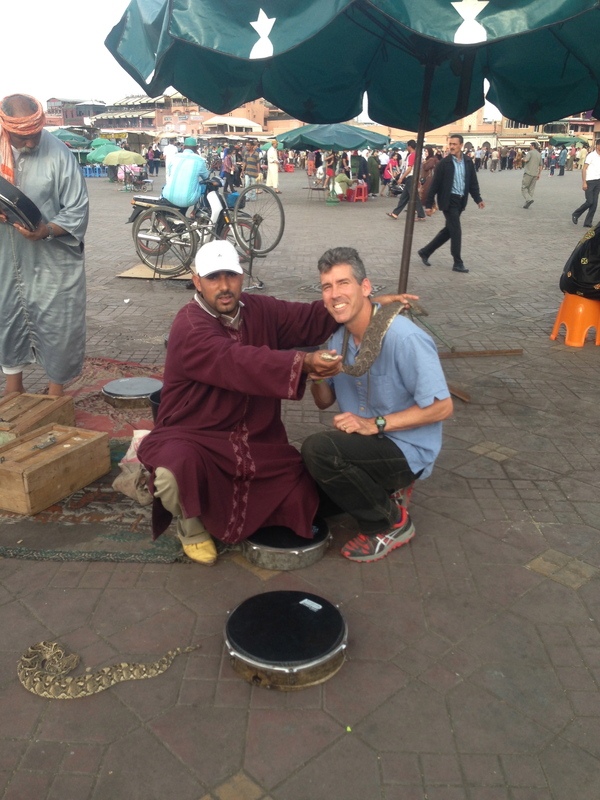 He was a Berber dentist! I later read that these “dentists” will extract a tooth for you right there at their card table! We spent the afternoon exploring and shopping. 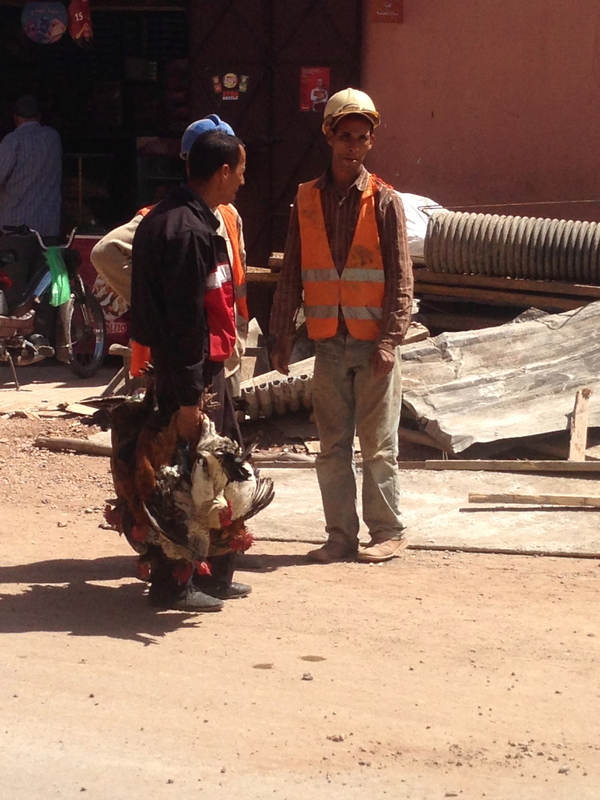 This guy is carrying a bundle of live, squawking chickens. 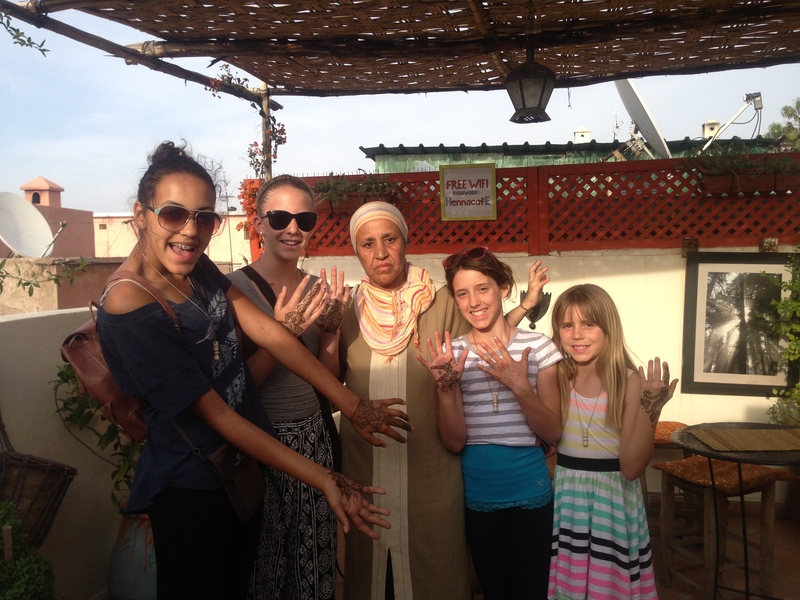 Jessica and Catherine were keen to get some henna as well so we went back to the Henna Cafe. 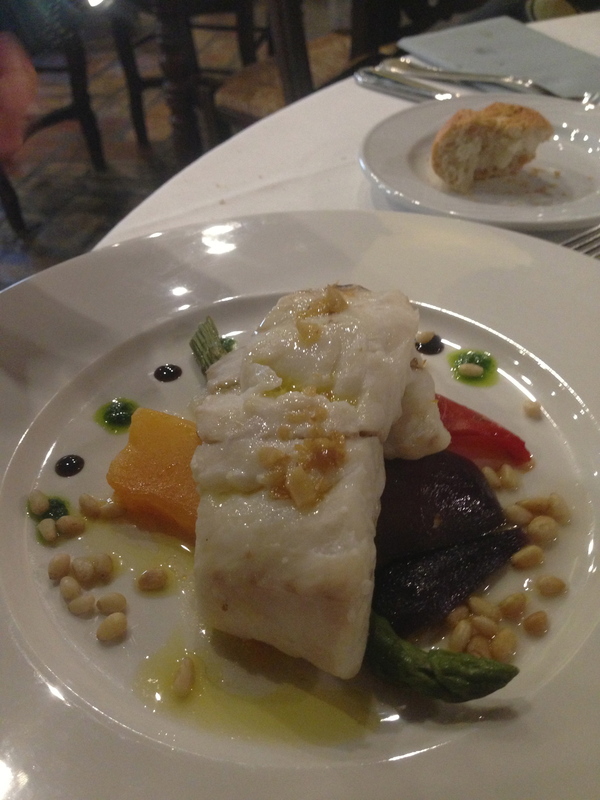 For dinner that night we enjoyed our best restaurant meal of the year at Le Comptoir du Pacha. 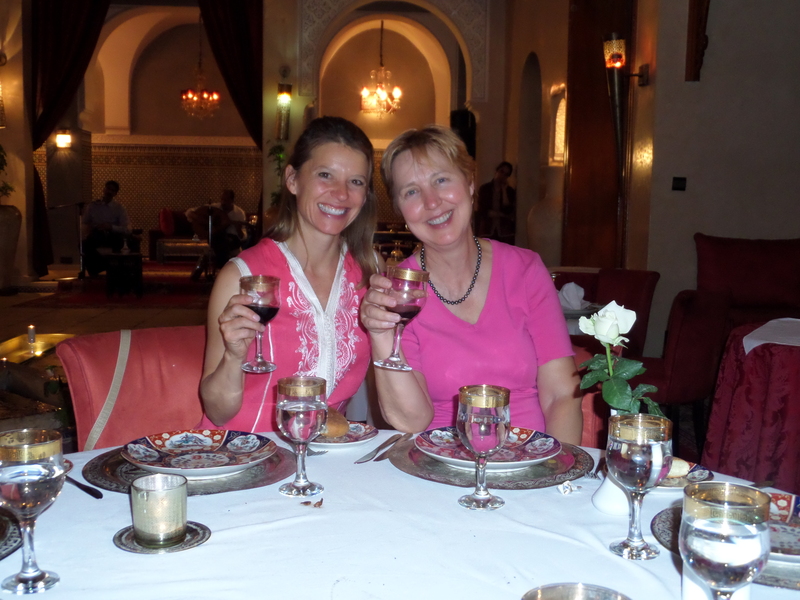 The restaurant was around the corner from our riad and was owned by an enthusiastic Frenchman. 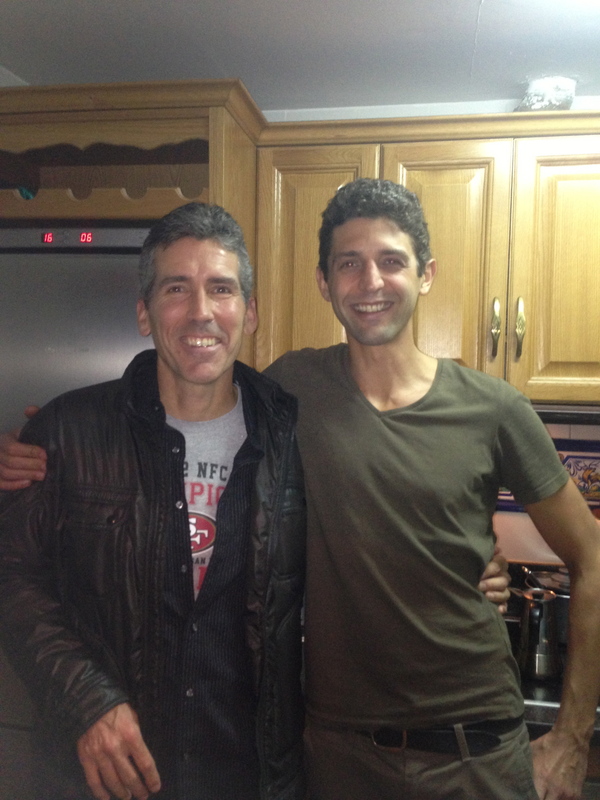 He seemed genuinely happy to meet us and gave us a tour around his place. 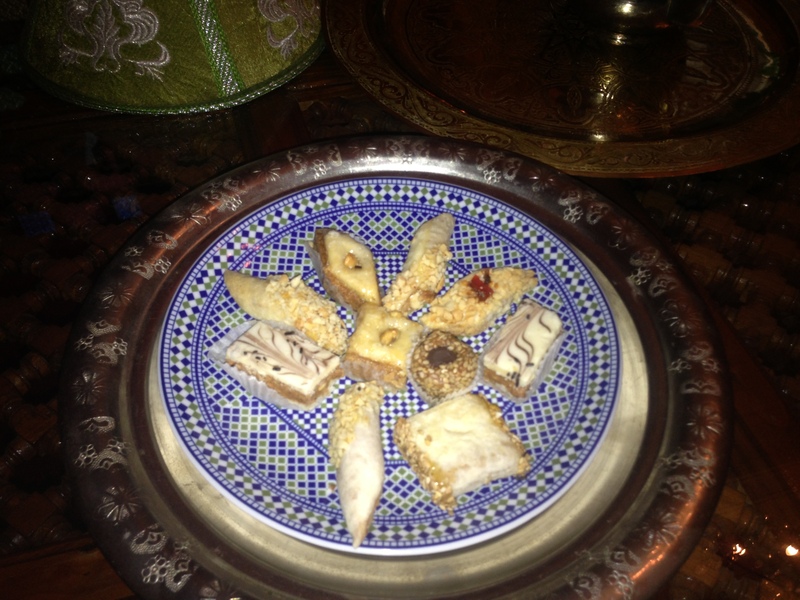 The food was an incredible mix of French and Moroccan styles. 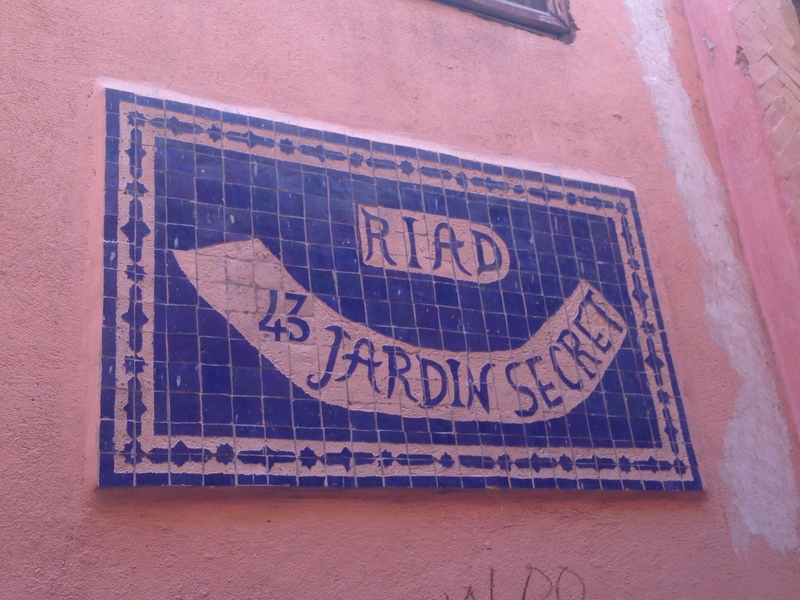 If you make it to Marrakech I’d highly recommend his place. 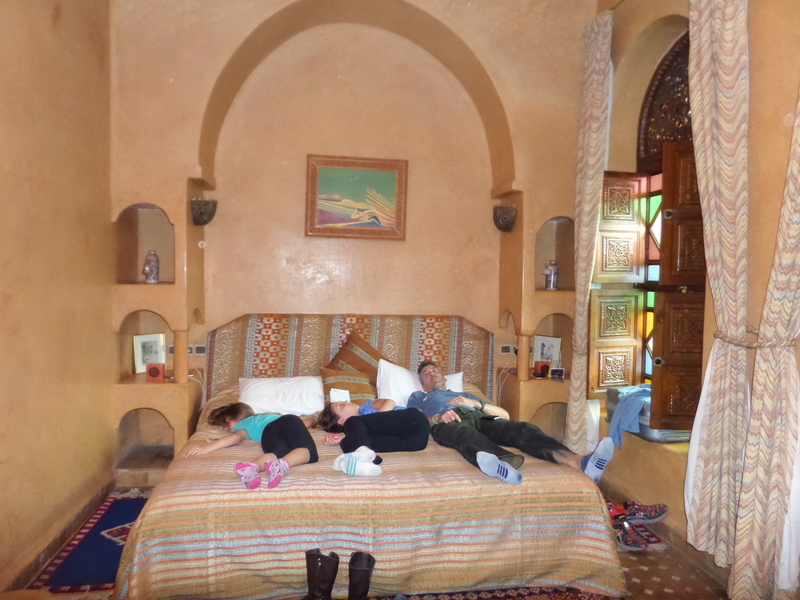 On our first morning in the medina we were jarred awake at 4:30am. The Muslim call to prayer is a shock if you are not ready for it. 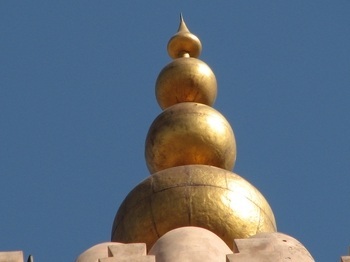 The Adhan is recited from the top of all of the mosques 5 times a day by a Muezzin and it goes on for several minutes. 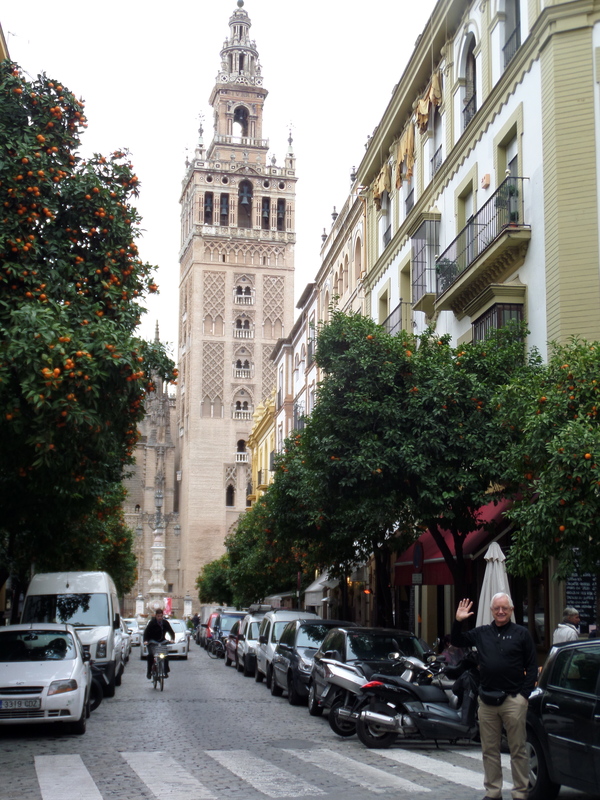 The Muezzin is a special person in each mosque that is chosen for his ability to recite both beautifully and loudly. 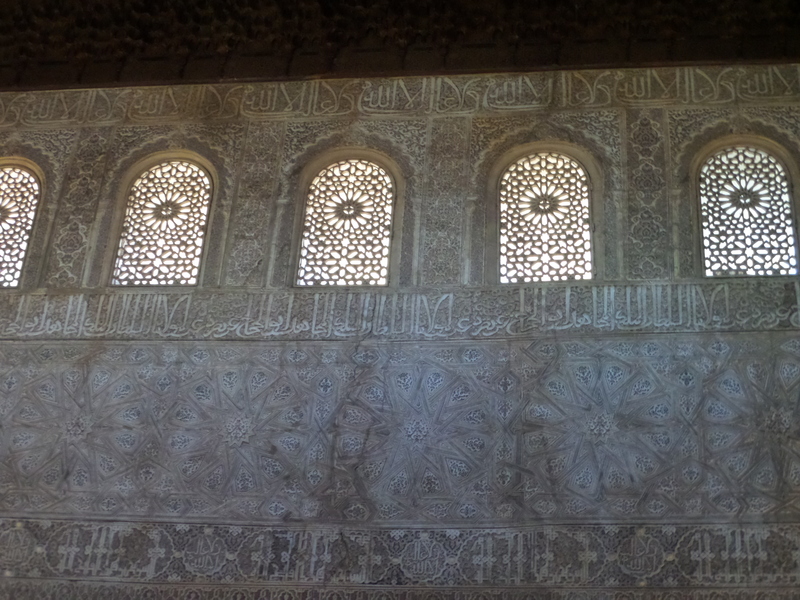 This was once done just by reciting the prayer from the minaret in a big voice. 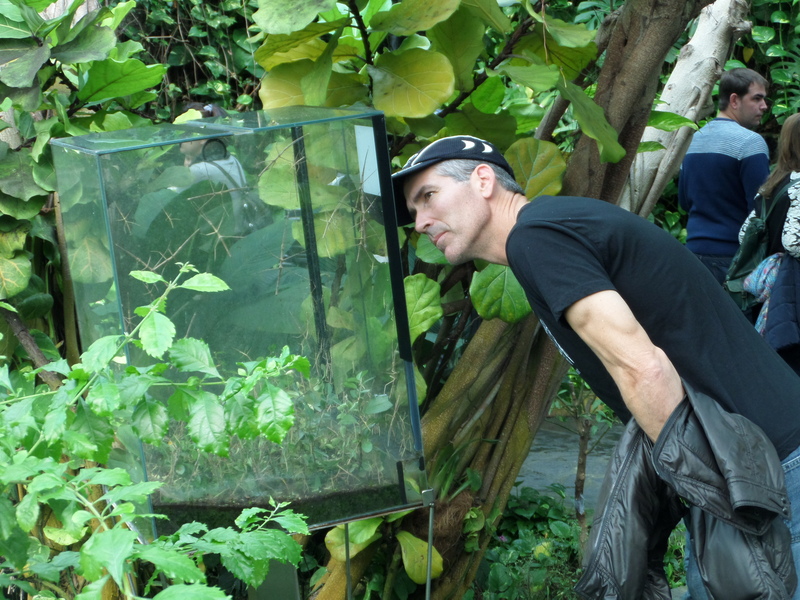 Now, thanks to modern technology, a loud-speaker broadcasts it so that everyone can hear. When it is heard it is time to stop what one is doing and get ready for prayer. In most cases at 4:30am this means to stop sleeping. 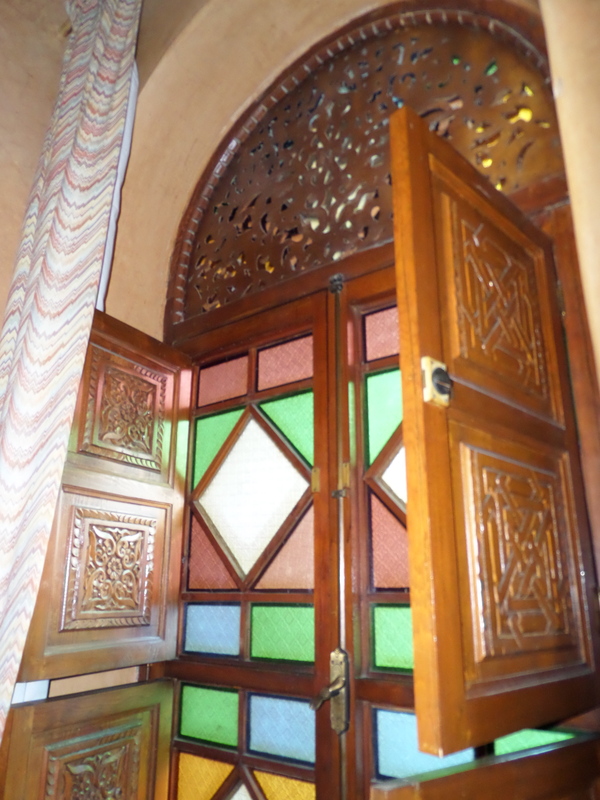 The mosque, (that may have been right outside our window), made a second call to prayer, the Iqama, at 5:30am as well. So, once my heart had stopped pounding and I had drifted back to sleep, it started all over again. Now I don’t mean to be culturally insensitive. I do understand that this is very important for muslims; it was just a bit of a shock the first day. Once I knew what the sound was, it was far less startling the next morning. 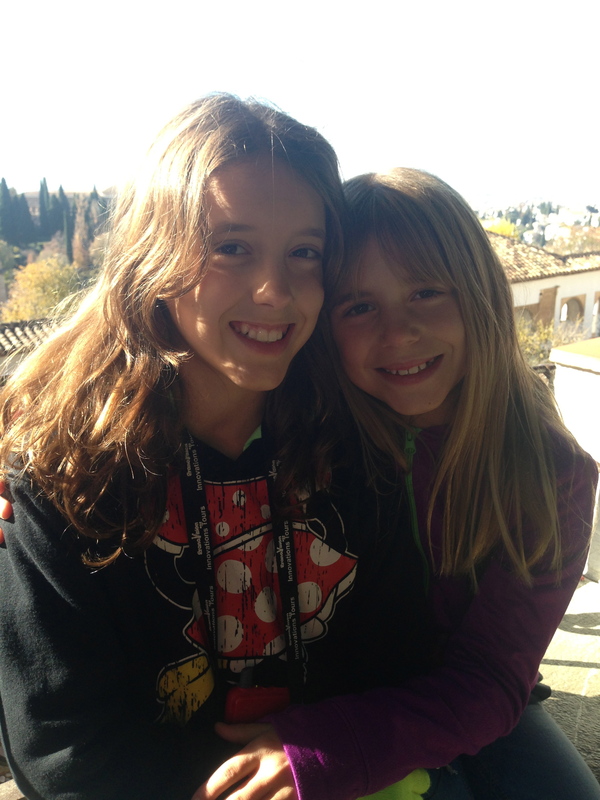 It is lovely to be on vacation and not need to get the girls ready for school in the morning. 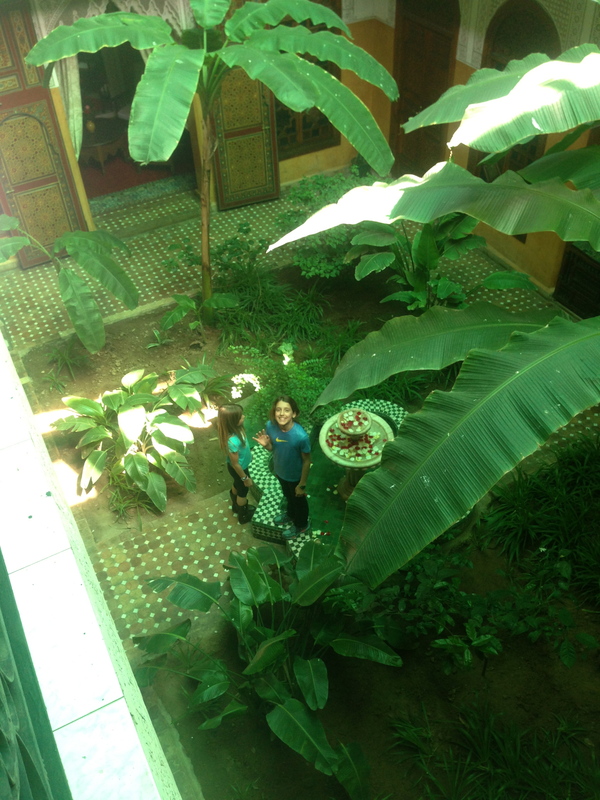 We wandered downstairs for breakfast after 9am and Youssef was waiting for us . 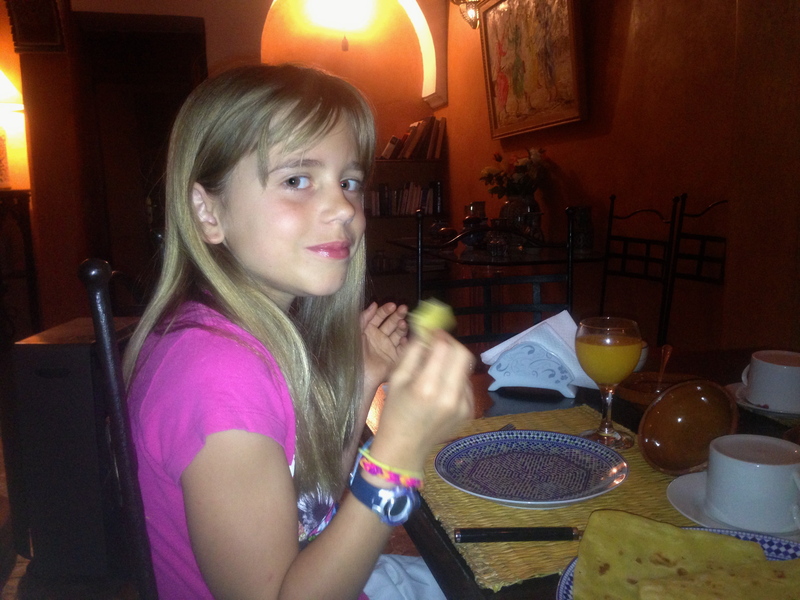 We had rghaif which is a rich Moroccan dough that is pan-fried and served with honey. 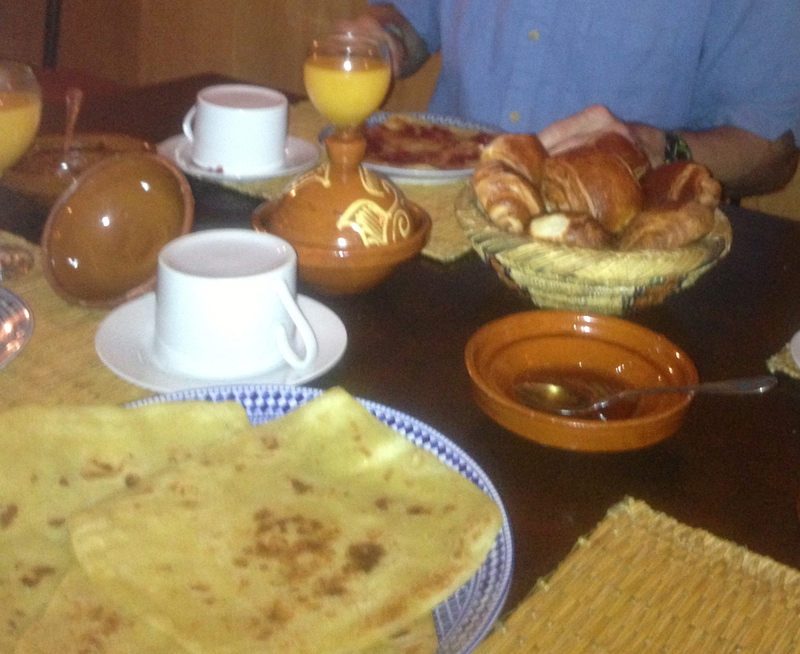 We also had delicious coffee, hot milk, yogurt, pastries and fresh-squeezed orange juice. 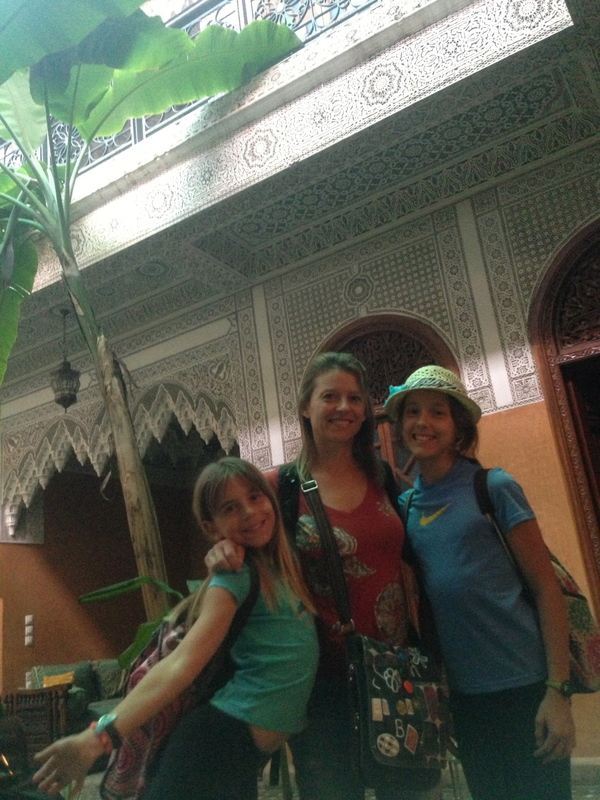 The girls and I had noticed that there was a spa next door to our riad. After breakfast we decided we could use a bit of pampering and we scheduled pedicures. At the Heritage Spa we were welcomed with warm tea and led to a sitting room where we waited for our attendants. 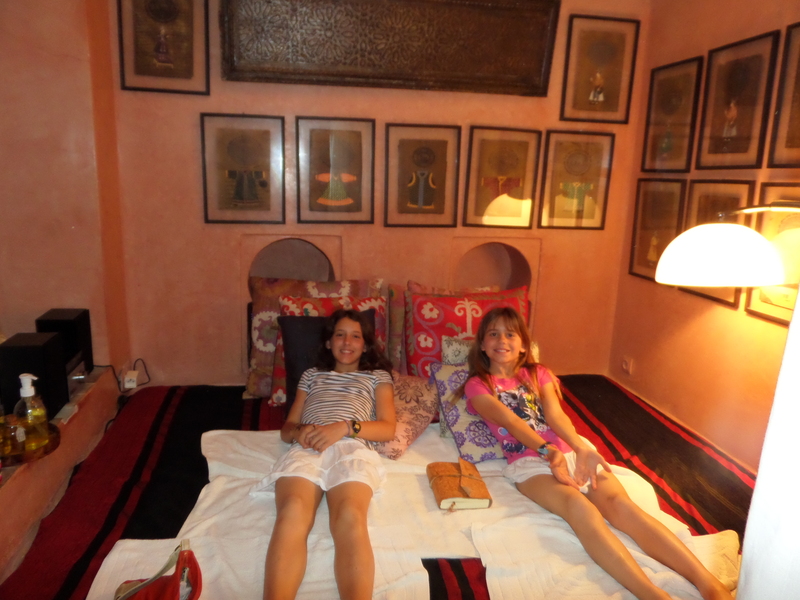 Sky and Savannah were taken to a lovely little room where they reclined on a colorful bed of pillows. 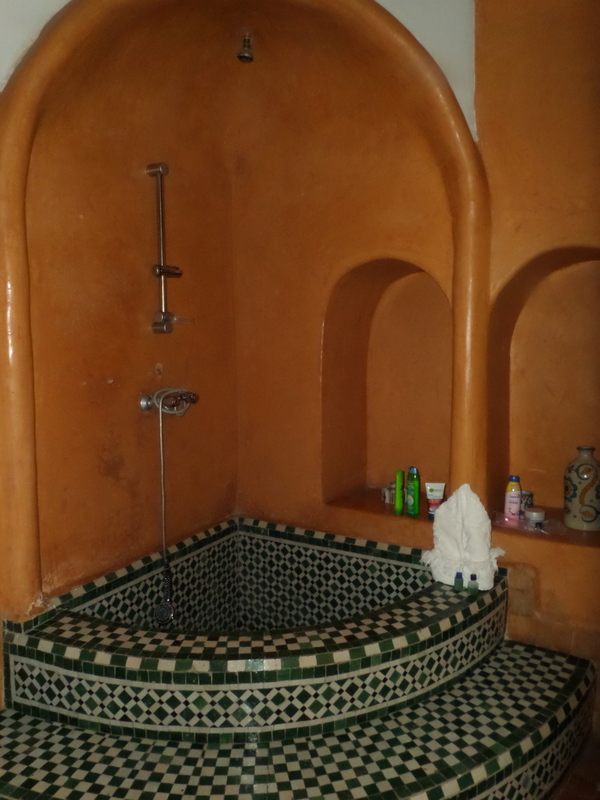 A fountain bubbled and whispered soothingly and soft Moroccan music played in the background. I had also scheduled some waxing in addition to my pedicure so my attendant, Banan, led me down some stairs, then up more stairs to a separate, more private area. I lay on a massage table while she focused a bright light on me. She had an old-looking can of wax with thick honey-colored drips down the side. It sat on a grubby base that she gingerly carried over and placed next to me. She carefully pulled some used-looking gloves out of her pocket and covered her hands. She used a popsicle stick to dip into the rusty can and blew on the wax to cool it a bit before she painted my hair. There was a lot of double dipping involved and I tried not to wonder how many other people’s sticks had been in that bucket of wax. I really did want to get rid of all that hair so I convinced myself that nothing could survive in boiling wax however unsanitary the set up was. I thought that surely I would get to go to the lovely room for a pedicure and a leg massage when the procedure was over. Nope, still on the flat table she had me bend my knees to put my feet in a bucket of warm water, weird. It was my first lie down pedicure. Once my toes were done she left me alone without a word in my little room. 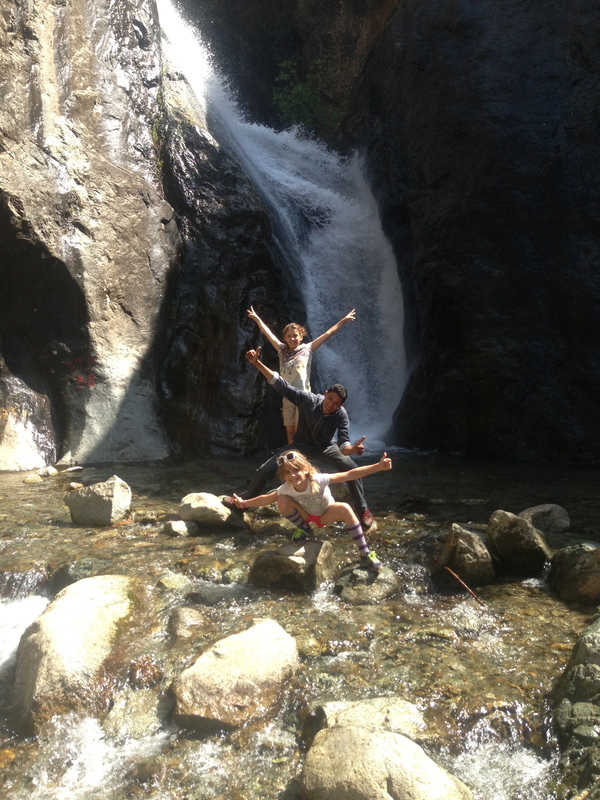 I put on a robe and wandered out to find my clothes and my children. I found Sky and Savvy lounging on their bed of pillows while their toes dried. 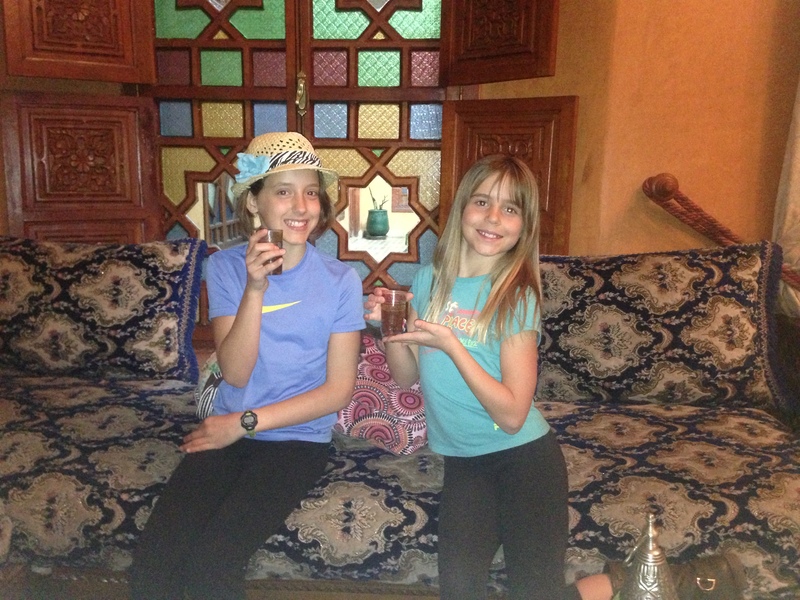 Two little sultanas. I joined them and we compared colors. No one offered to paint a flower on our toes and we all felt that the foot massage was little more than a couple of slaps on the bottom of our feet but all in all it was a pleasant experience and I did get a very complete, albeit somewhat scary waxing. 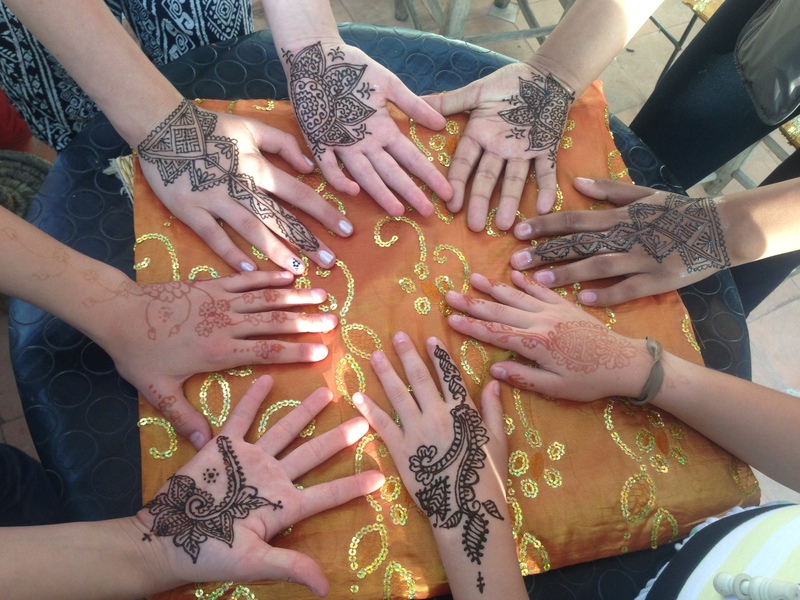 Next stop, the Henna Cafe. After the odd experience with our henna attack in the big square the day before we thought we should find a calmer venue for some “temporary tattoos”. 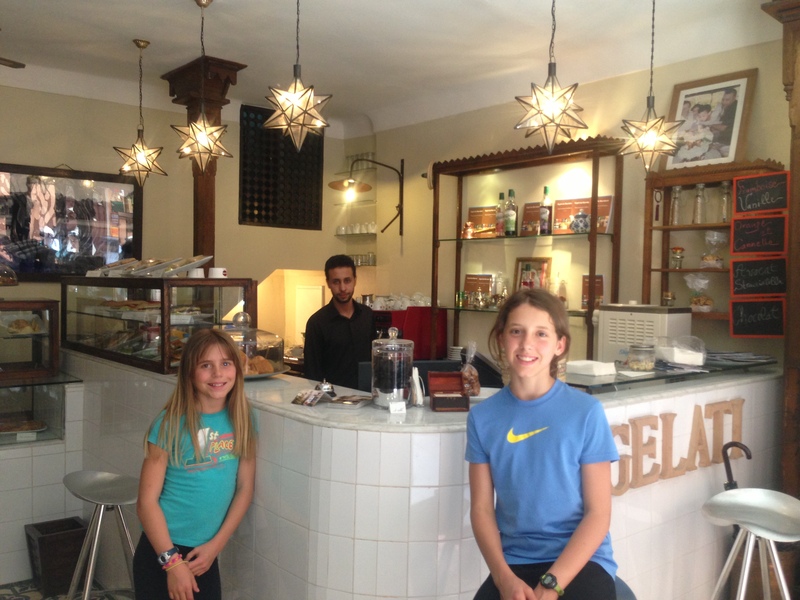 We noticed the Henna Cafe the day before on our explore about town. 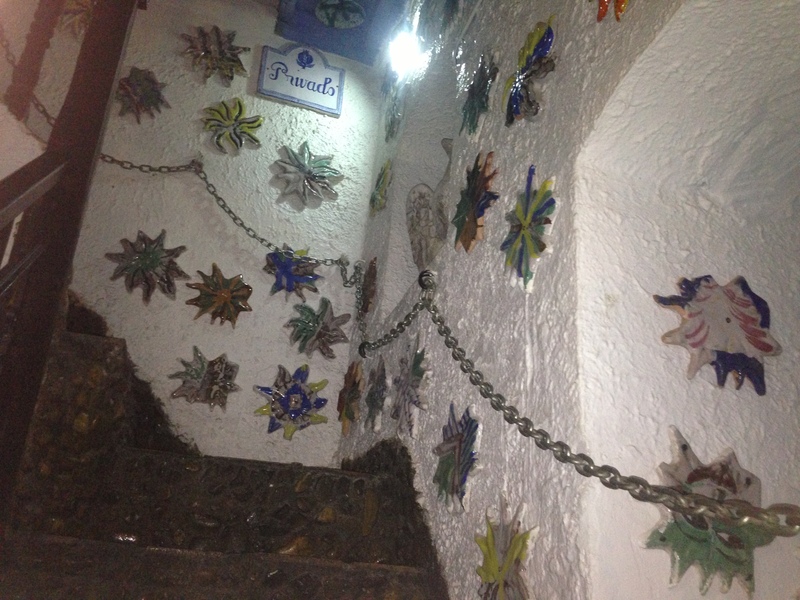 We climbed a narrow staircase decorated with paintings and photographs from local artists. We passed a tiny kitchen on our way to the rooftop terrace. 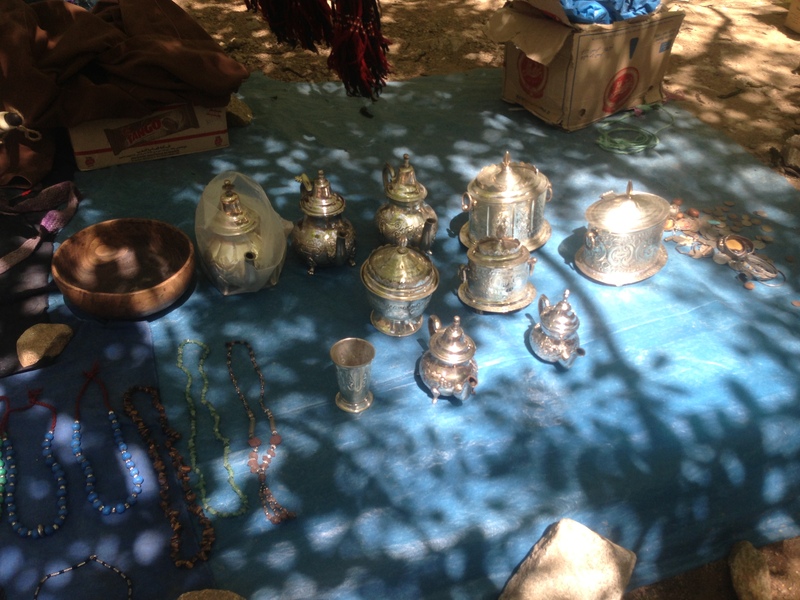 We sat in the shade and sipped tea and ate delicious food from tagines. 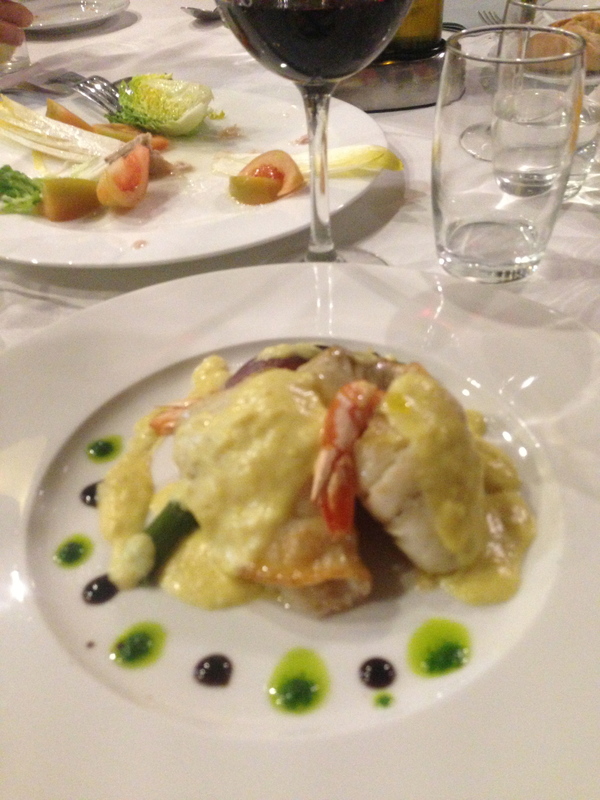 The food was fabulous! Definitely my favorite lunch of the trip. 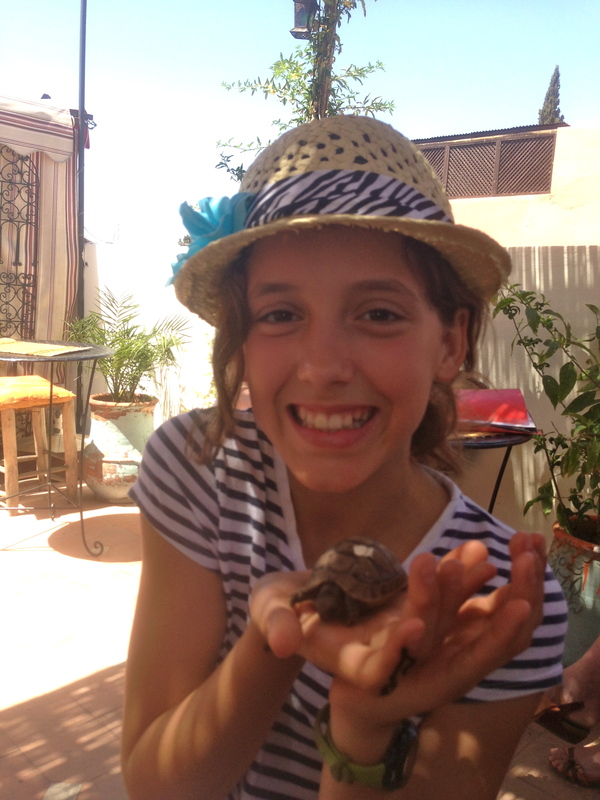 Sky and Savannah found small turtles roaming about the tiles. The turtles were tame and ate table scraps. It was good entertainment while we waited for our food. 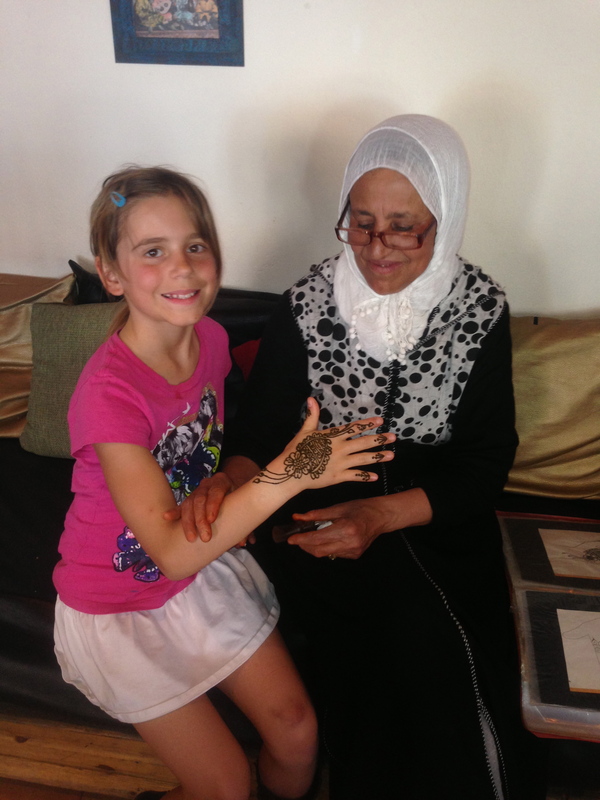 The girls chose their designs from a book and gentle Fatima skillfully painted them with her “homemade organic henna”. 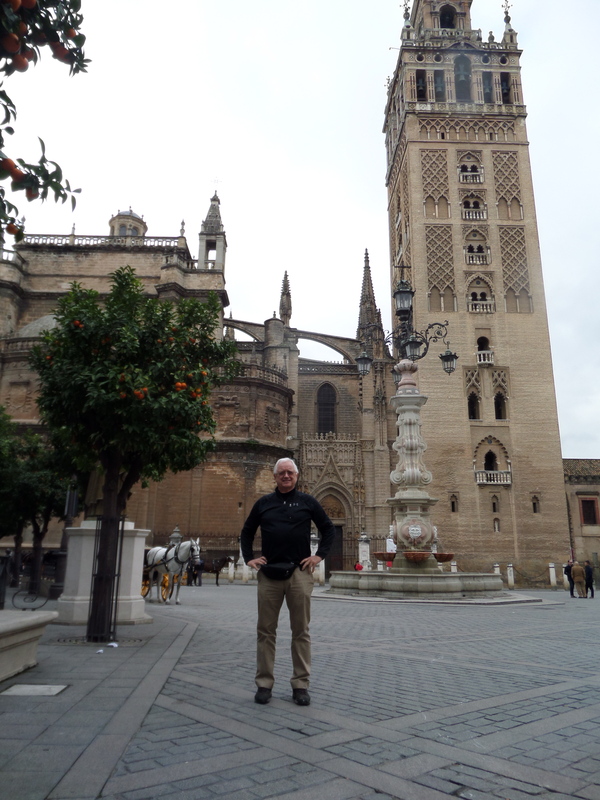 After getting lost in the labyrinthine medina Mike was keen to check out the “modern” city, Gueliz. 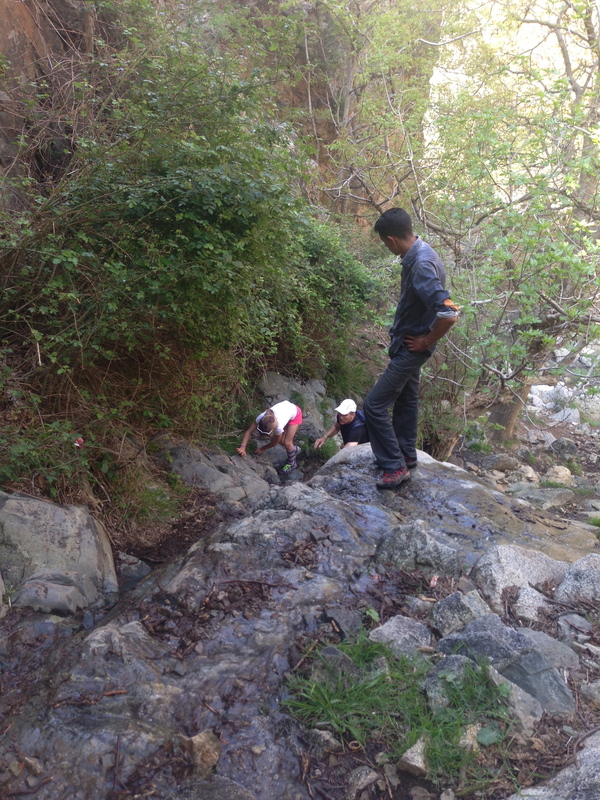 Youssef pointed us in the right direction and this time I downloaded a map. 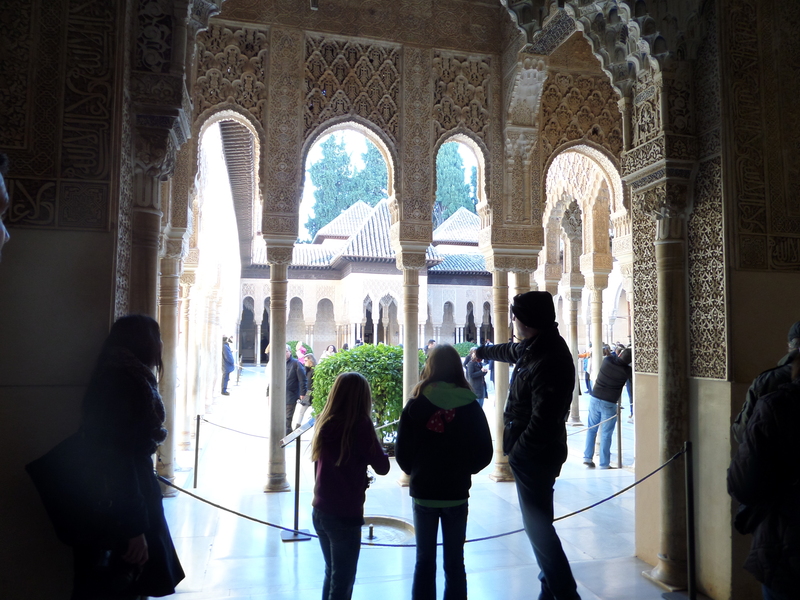 We were very careful to memorize landmarks and I promised Savannah that we would come home the same way we went out so that we wouldn’t get lost. 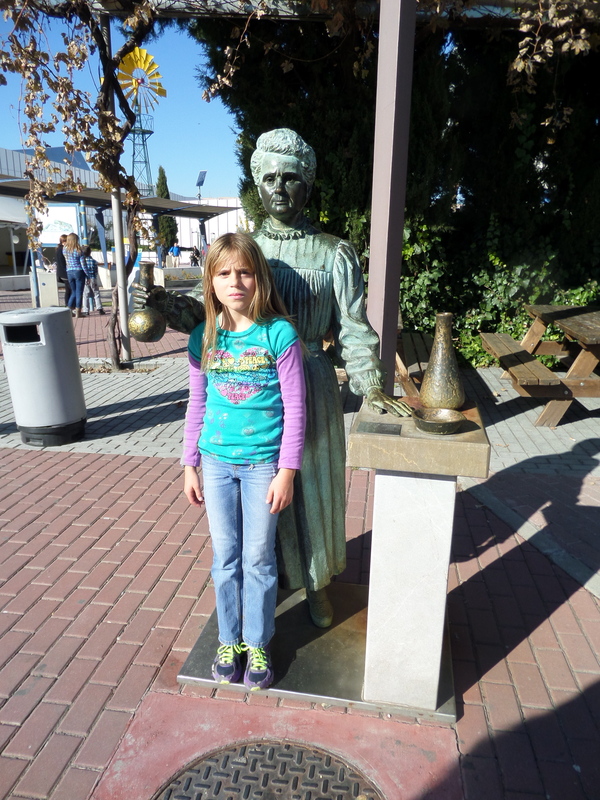 She was skeptical but agreed to go. I did wonder what the draw was to this part of town. 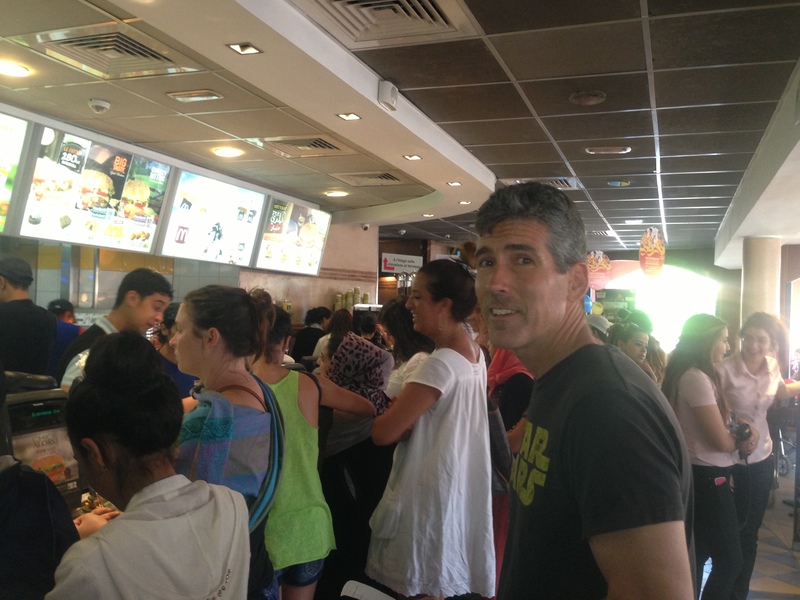 I wondered just until I saw the McDonald’s, which of course Mike already knew about from his Africa McDonald’s App. 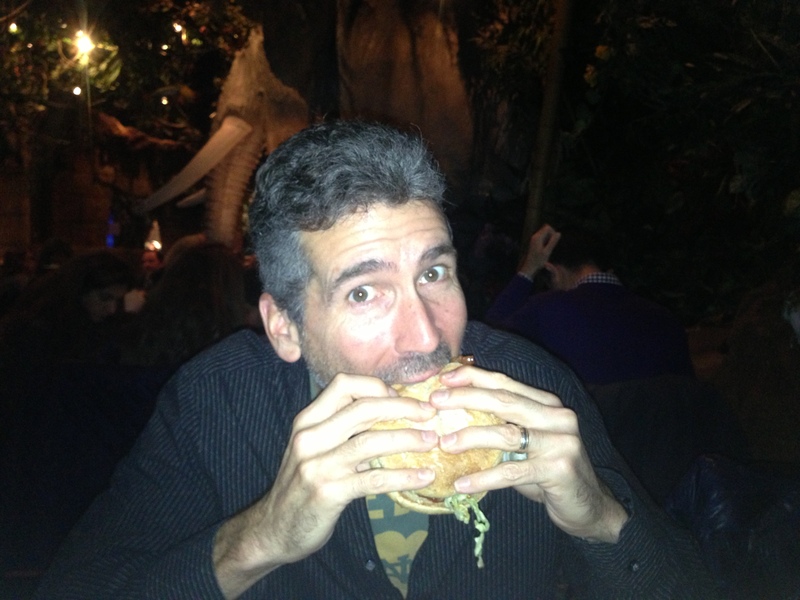 As a vegetarian, it is embarrassing to admit that my husband has a deep-seated love for Mickey D’s. 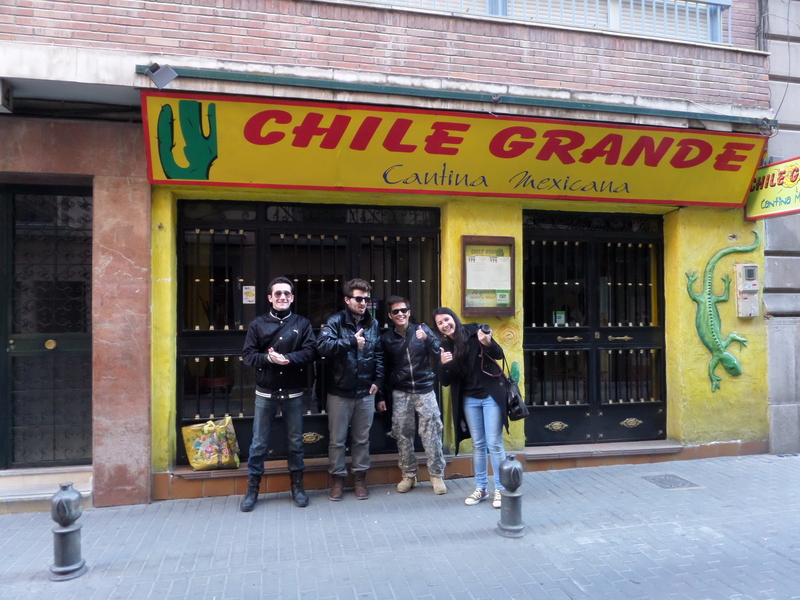 So against my better judgement, it has become our tradition to visit one in every country. It is amazing how we just happen to “stumble” upon them. Mike was in beef heaven and was so happy that it was worth it. 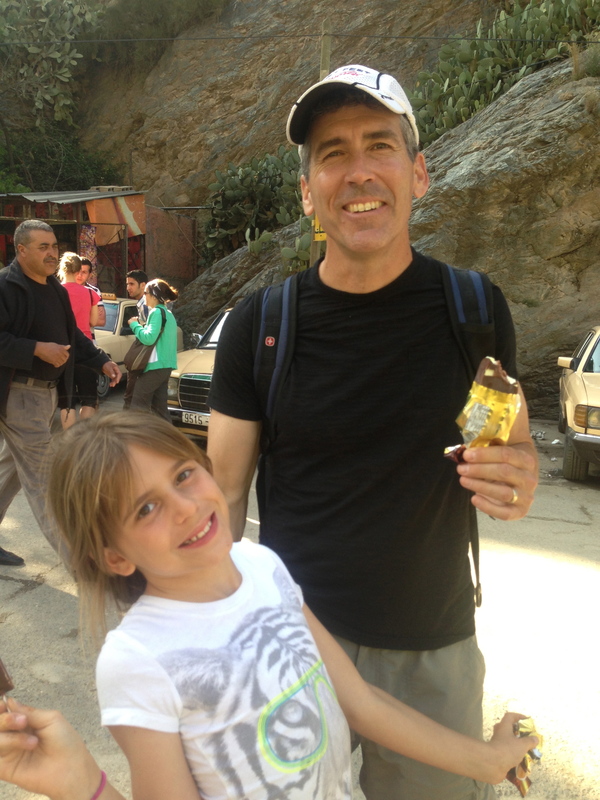 Mike had a Hamburger Royal and Savvy had a cheeseburger. Sky and I sipped vegetarian milkshakes. 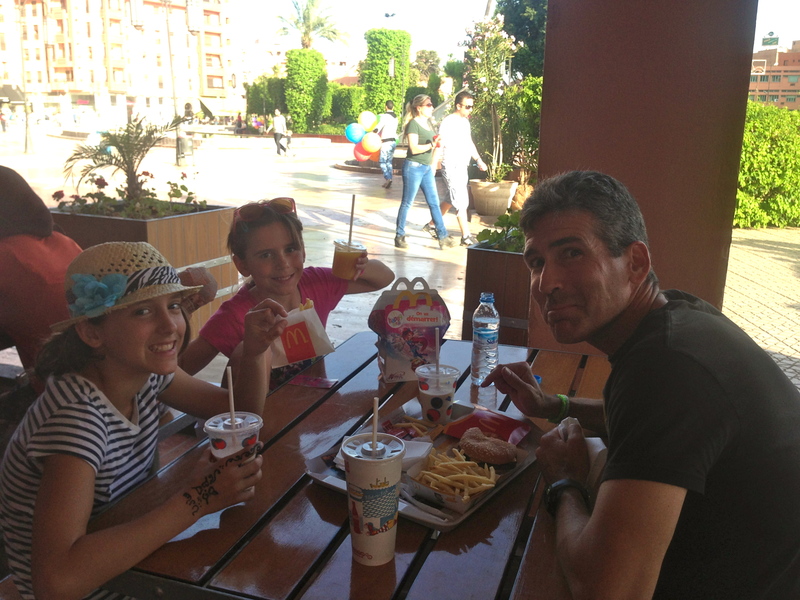 McDonald’s in Marrakech is wildly successful. 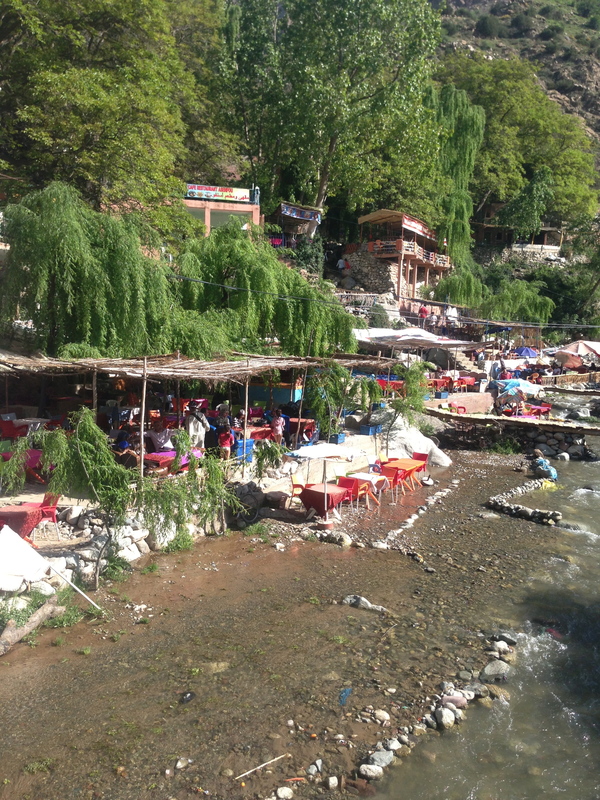 It was packed with people, lovely girls met us at the door and took our order on handheld computers. 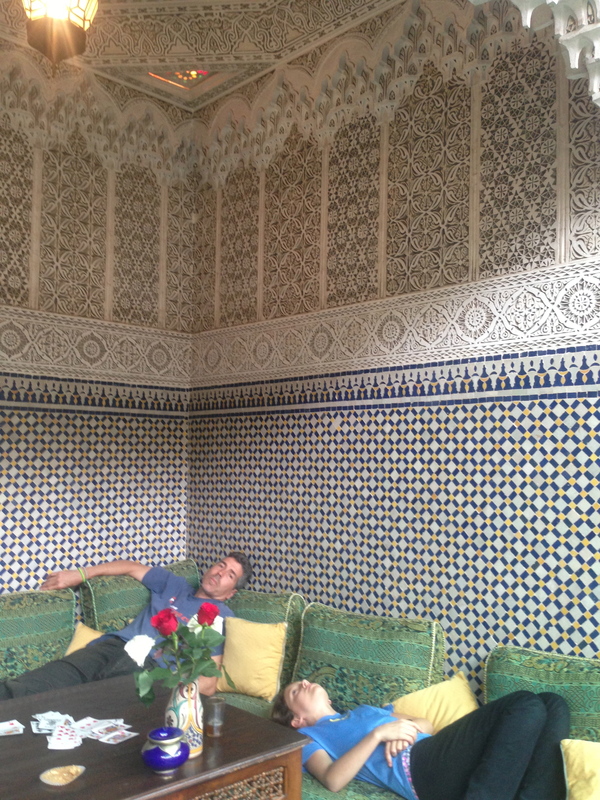 We had to search for a place to sit amongst the local Moroccans. 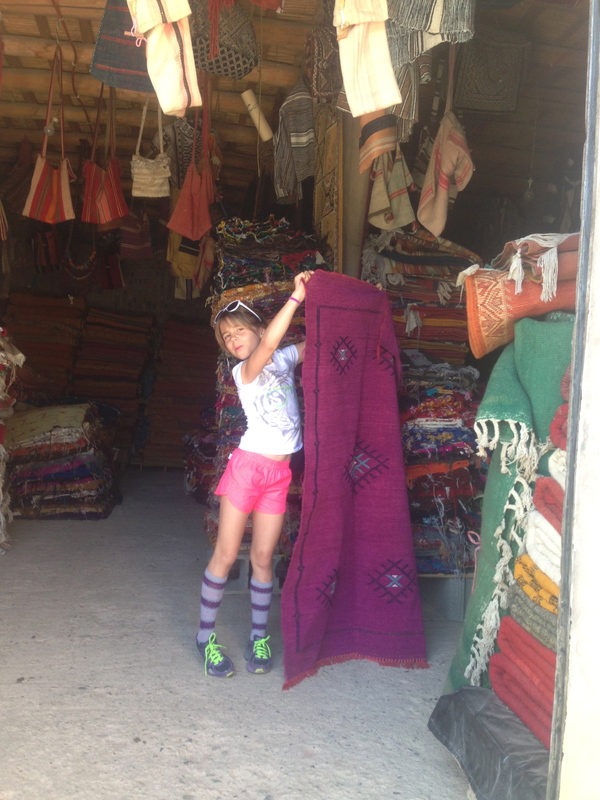 We had definitely come across the modern Morocco. Beautiful, fashionable women in head scarves strolled next to friends in tube tops and high heels (I wish I had a photo of that!). Many women passed with their heads conspicuously uncovered, with long, flowing dark hair exposed. The west has obviously affected this Arab country but it seems that it has been a peaceful transition. 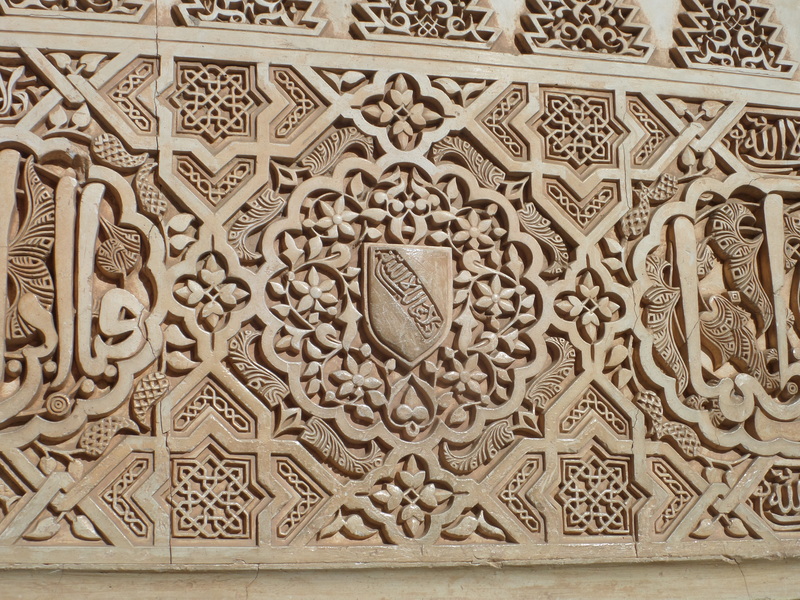 Morocco was our first exposure to the Arab world. 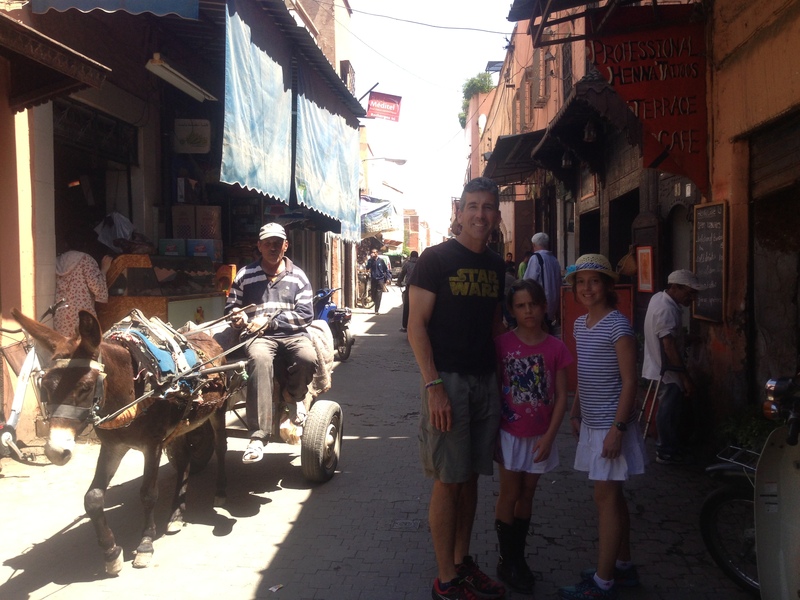 We learned from the locals that we met, that in their opinion, Marrakech is a progressive city that welcomes the Western changes. 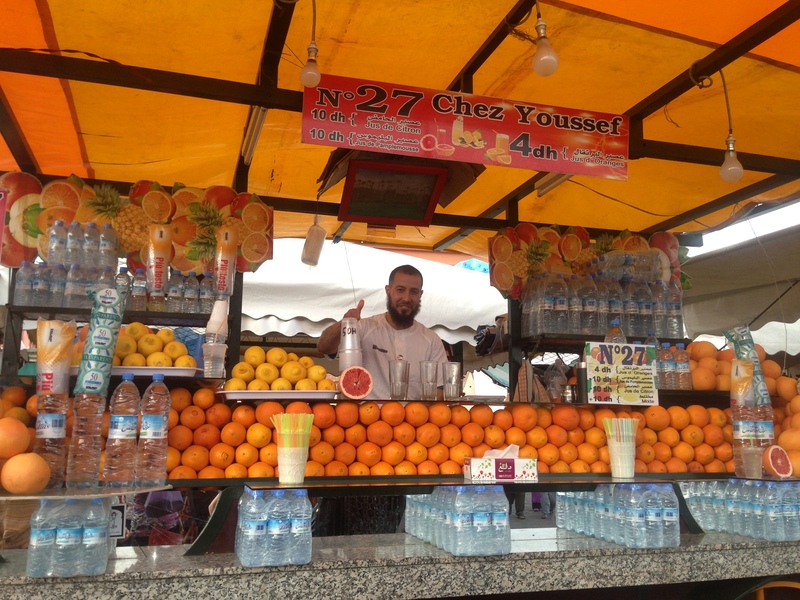 There are many immigrants from other parts of Africa who on their way to Europe stop in Morocco. Many find it so agreeable and peaceful that they decide to stay. 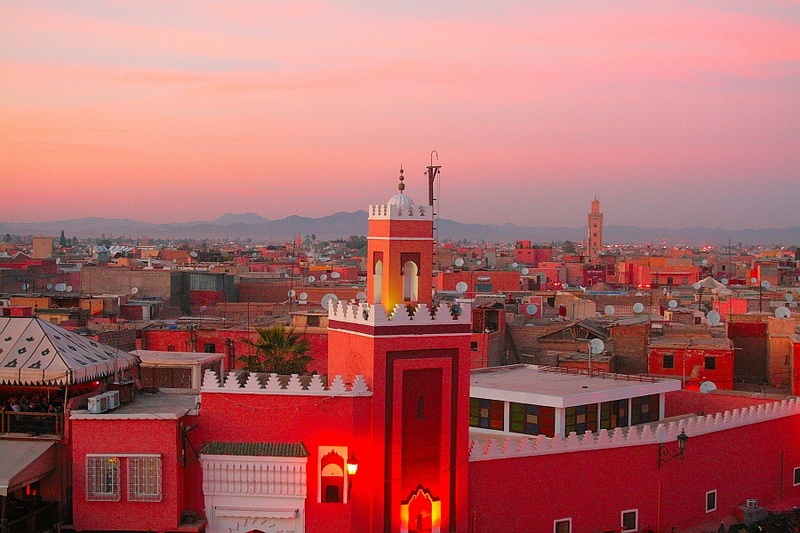 Over the centuries, Moroccans have endured invasions by Arab, French and Spanish civilizations. 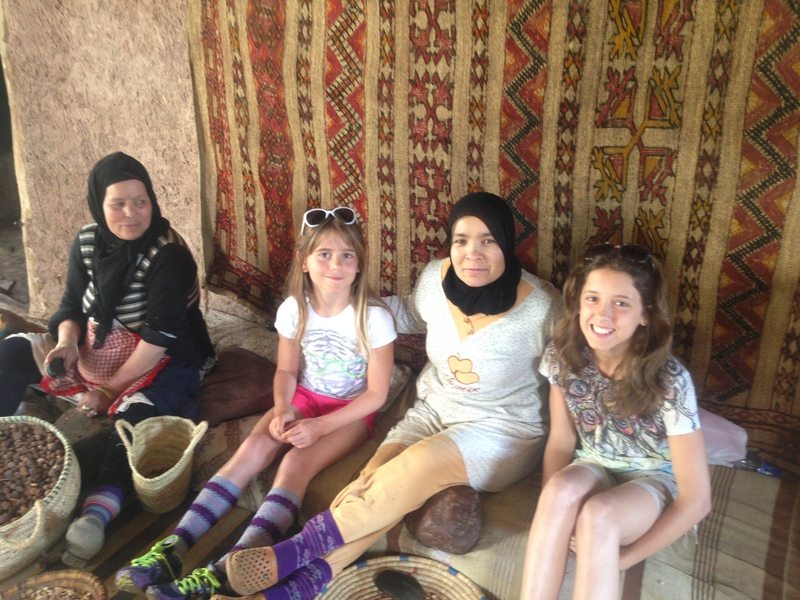 The indigenous Berbers have been in Morocco for over 5000 years. 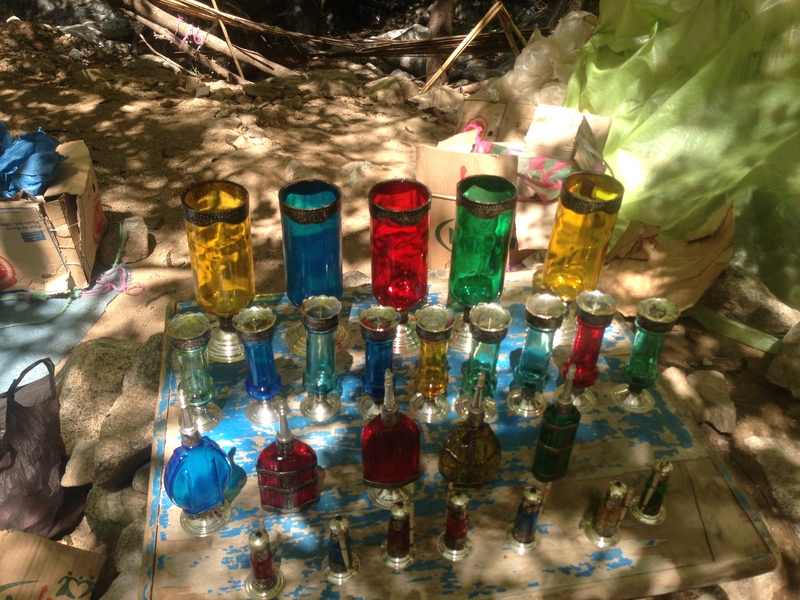 They have survived and today live throughout Morocco composing more than 40% of the population. 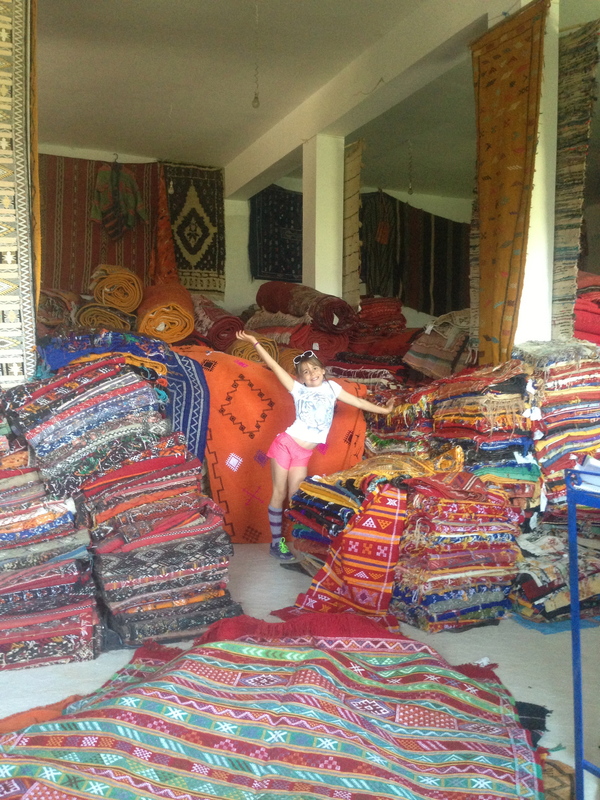 There are 35 million people in Morocco and the overwhelming majority are of mixed Arab and Berber descent so it is not surprising that Arabic and Berber are the two official languages of Morocco. 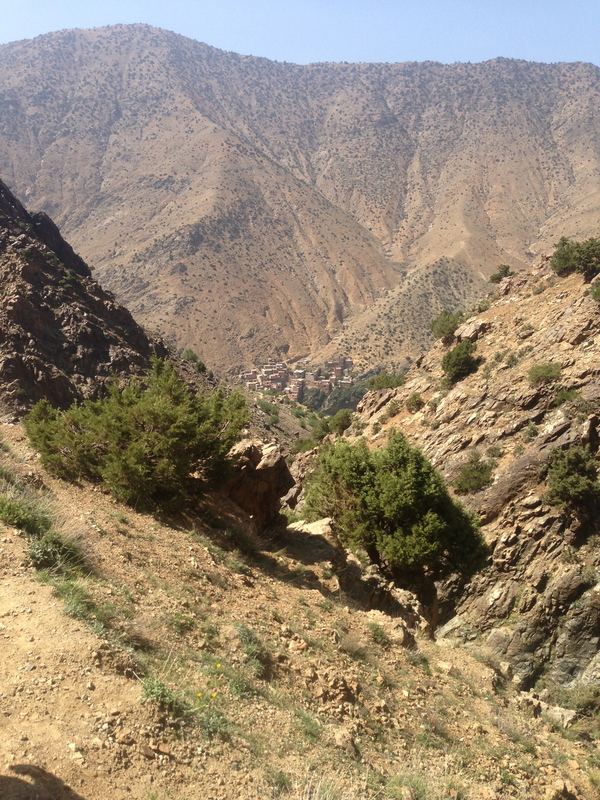 What is surprising is that Berber was not recognized as an official language until 2011. The third, unofficial, language is French which is the language that is widely spoken in government and business. 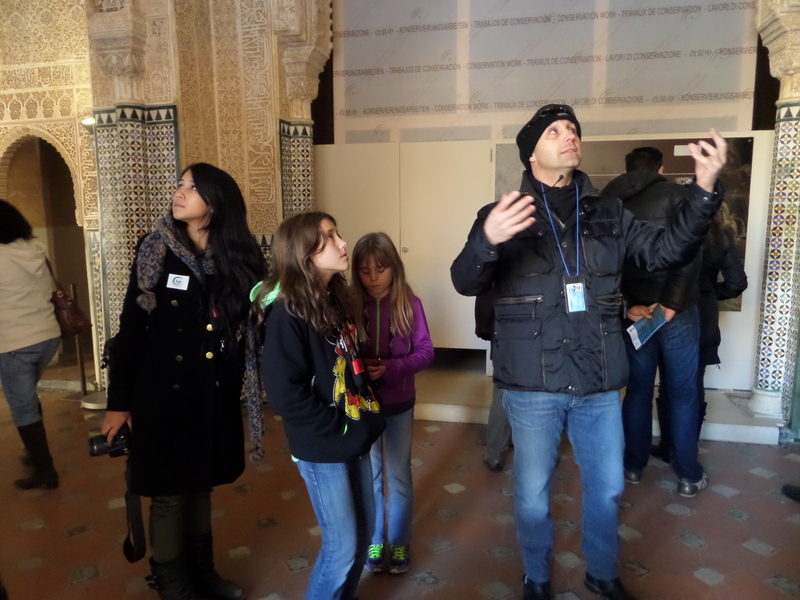 Moroccans easily switch between French and Arabic and we noticed that they frequently speak a combination of the two languages. 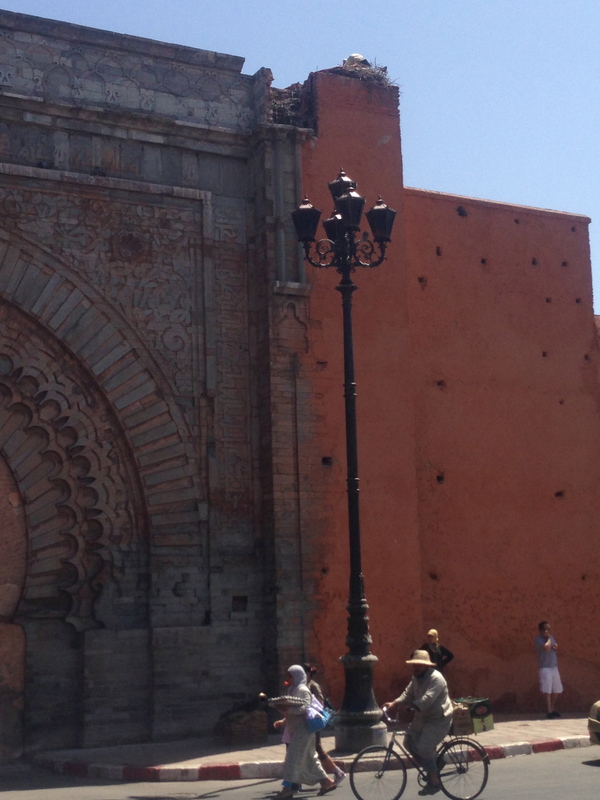 The recent history is that Morocco was occupied by the French and Spanish as a protectorate from 1912-1956. The French occupied most of the country while Spain occupied the northernmost region. Mohammed V negotiated a peaceful transition in 1956 that restored Moroccan independence from both Spain and France. The sultan agreed to transform his country into a constitutional monarchy where the sultan would continue to have an active political role. 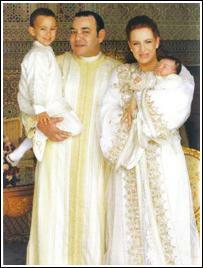 His son, Mohammed VI, is the reigning king today. In 1999 at the age of 36 he became king when his father died. Today he seems to be a popular and powerful king, not to mention fabulously wealthy. 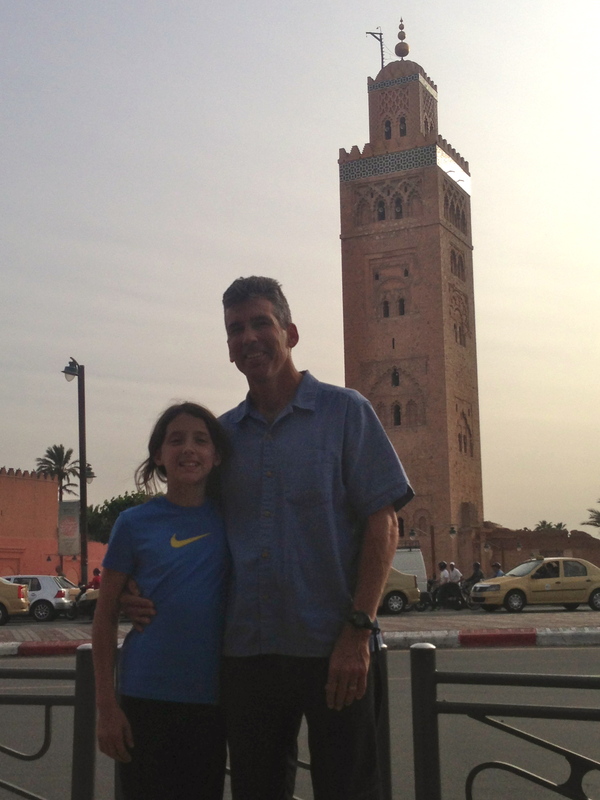 In 2009 Forbes magazine estimated that the Moroccan Royal Family had one of the largest fortunes in the world. 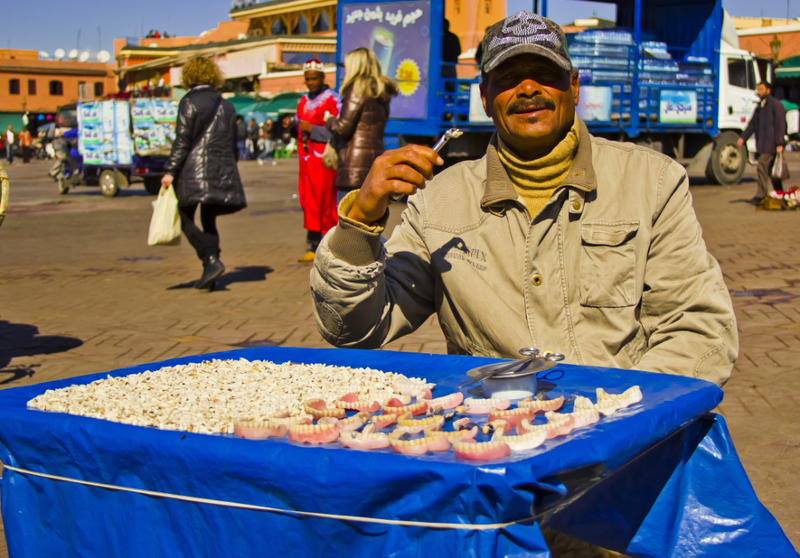 He is ever-present in Marrakech from his face on the Dirham, the local currency, to his ubiquitous portrait. In 2002 he married to the most beautiful computer engineer in the world, Princess Lalla Salma. They share a son and daughter. He is also known for creating a new Mudawana which is family law based on Islamic principles that grants more rights to women regarding marriage, divorce and property ownership. I like to think that his lovely, well-educated wife had some influence on the new rights for women in recent years. I got a bit carried away, but I do find the whole idea of royalty quite interesting. 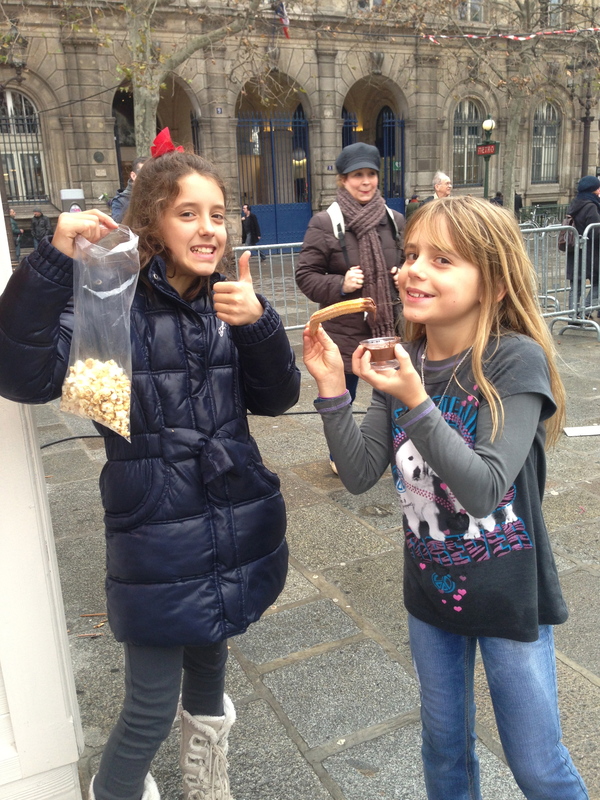 After lunch we shopped in the modern shops where everyone spoke French and many spoke English. 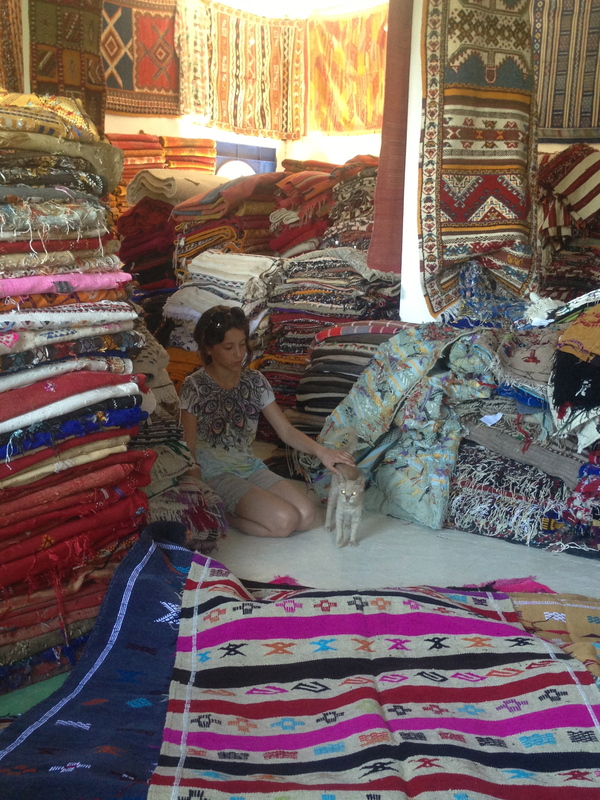 It was relaxing not haggling over prices. 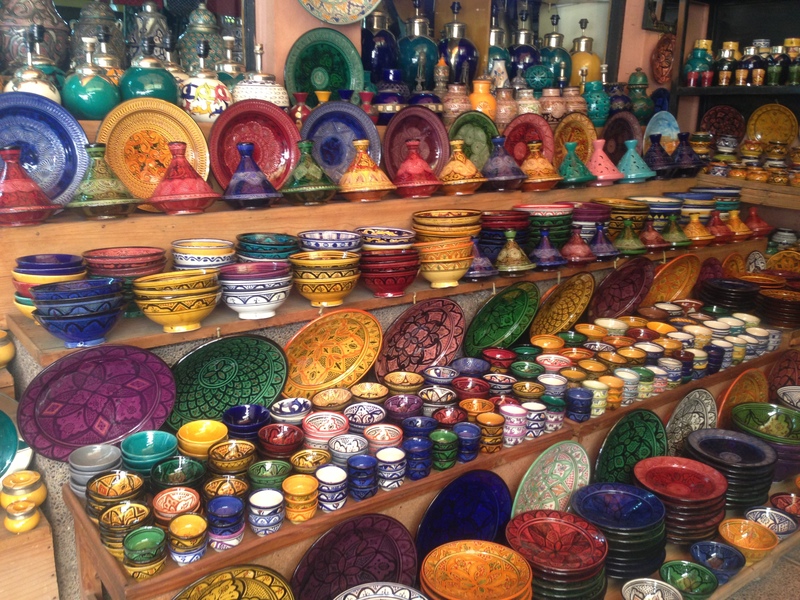 We were surprised that in the stores that sold typical Moroccan clothing and ceramics that the prices were actually better in Gueliz than they were in the medina. 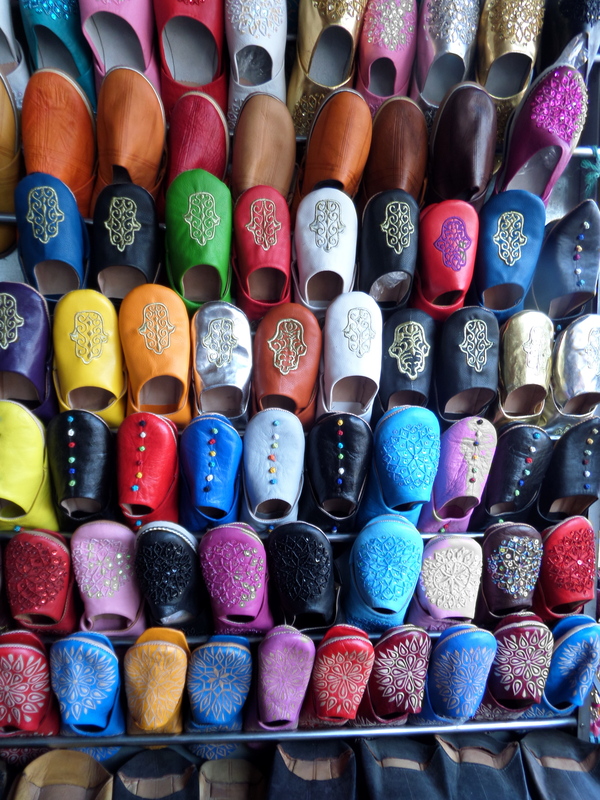 Obviously in the medina the local merchants are accustomed to asking outrageous prices of the tourists. Sky chose a beautiful blue outfit that was one long piece of fabric. For the outfit and some golden shoes it cost the equivalent of about 40$. 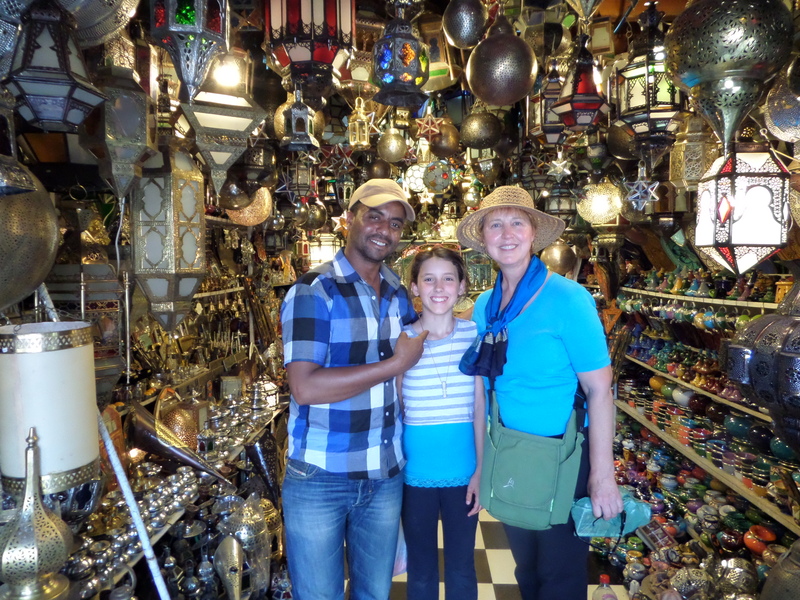 In addition, there weren’t the pressured sales pitches that we experienced in the souks. 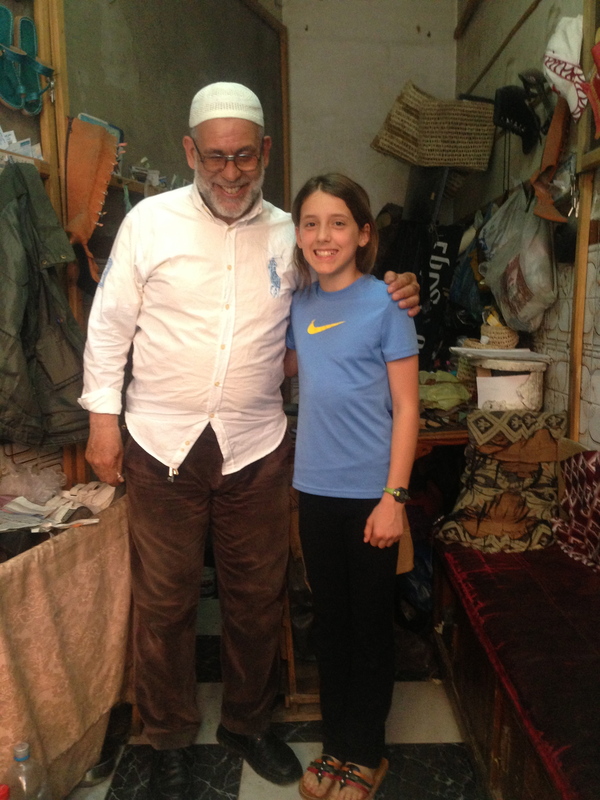 Savvy found some sandals that she was happy with and we successfully found our way back to the riad. Sky put on her new outfit and we had a fashion show. We sipped mint tea and played cards until we collapsed. 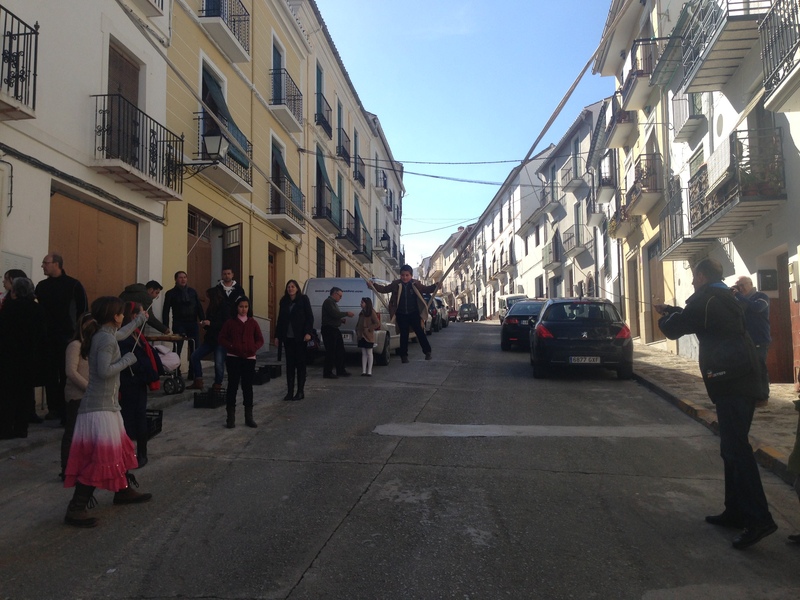 Another full day in the Red City! 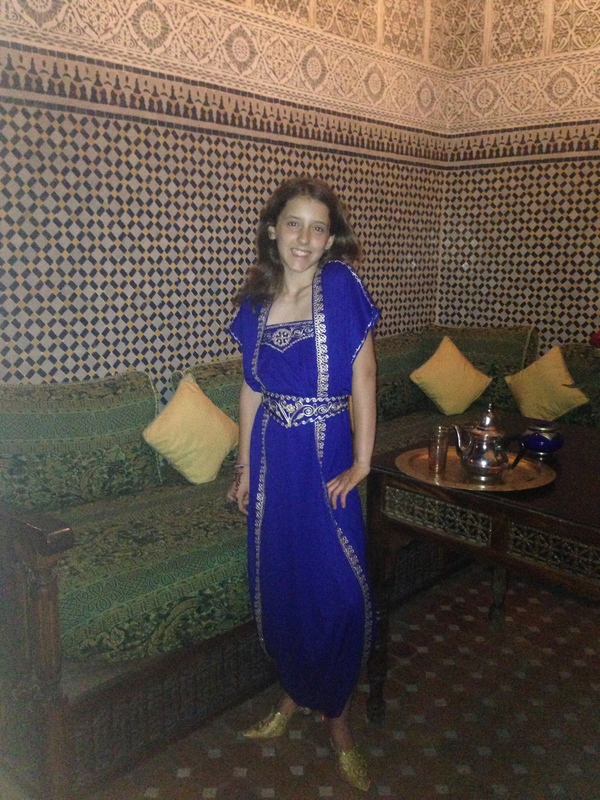 Sky in her new Moroccan duds. For the past 3 months I have been watching a ganglion cyst on my left wrist grow. As a gynecologist the wrist is pretty far from my specialty but I recognized the cyst and knew it was nothing dangerous. Nevertheless, a growth on the body is a bit disconcerting. It started the size of a small pea on my inner wrist and grew into a large lump that got in the way of my watch. It also hurt. A Ganglion Cyst that looks just like mine (from google images) I didn’t think of taking a picture of mine until it was gone! I had initially intended to just leave it alone until we got back to California but in the end it became too bothersome to ignore. As I moaned and groaned more and more Mike finally said, “Do you want me to be your doctor or do you want me to just continue to be an empathetic husband?” I finally agreed that if he could come up with a solution I would agree to be a compliant patient. A ganglion cyst is a cyst of the tendon of the hand or foot. They are relatively common and when I showed it to 2 running friends in Spain they both told me that they each had also had one but in both cases the cysts had eventually gone away spontaneously. Doctors refer to ganglion cysts jokingly as “Bible cysts”. Years ago people would just smack them with the biggest book that they had around. Presumably they also said a little prayer and wham, the cyst was history. Mike had been offering to whack my cyst for months. We do have private medical insurance here so I could go to a Spanish doctor but I was willing to let Dr. Mike come up with a plan first. Like most patients of the 21st century we looked to Google for our ideas. 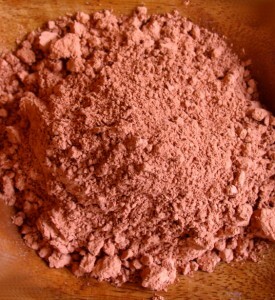 First we found a hysterical website called “imperfectlyhealthy.com” that recommends that one eat red clay to dissolve the cysts. No joke, I cut and pasted this from their website! Is there a refund / guarantee if my cyst does not dissolve? 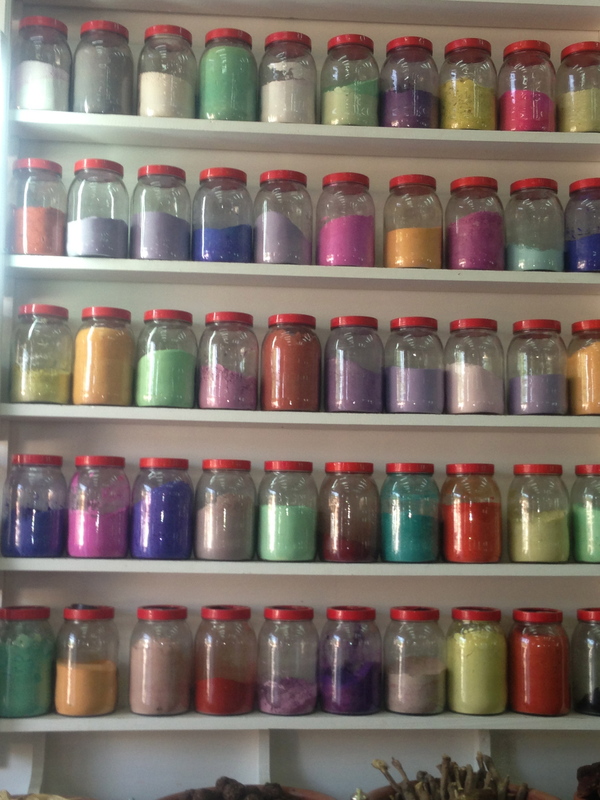 The clay is beautiful for all that it does for the body – and we are always hopeful that you will have the same results as many others – and be able to avoid surgery. We are unable to refund open containers and there is no guarantee your ganglion cyst will dissolve. Red clay. Encyclopedias are beautiful too! We then found one guy who cured himself with an Ace Bandage and an eraser (or a “rubber” as our English friends say). He placed an eraser (roughly the size of the cyst) over the cyst and then wrapped an Ace Bandage around his wrist. He was able to sleep with this contraption on his wrist and voila, in the morning his cyst was gone. I wasn’t interested in eating any beautiful red clay so I borrowed an eraser from the girls and bought a wrist wrap from the local farmacia. Last night I placed the eraser over my growth and wrapped it as tightly as I could. I am not sure what the guy on the internet drugged himself with, but an eraser pressing on a tender cyst is hard to ignore. I probably tolerated it for an hour before I took it off. In the morning Mike said he was disappointed that I couldn’t be more compliant and I agreed to move to plan B. Surgery, of course was also an option. eww! Are surgeons allowed to say that? Yes, if they are on a year long vacation! So what if Mike had never operated on the wrist before and we didn’t have a scalpel? We did have some non-sterile stuff and we could buy some betadine and steri strips! How hard could it be? The Bible was looking better and better! I pressed on my bump all day hoping that I could just make it disappear with some gentle pressure but I only managed to make it more sore. By evening I was ready to be done. Strangely, our apartment came with a set of Spanish Encyclopedias but no Bible. Mike selected “N” which was good sized. We bent my wrist over the edge of an armchair. Savvy held my fingers down and I looked away. One quick smack and wow! It deflated. 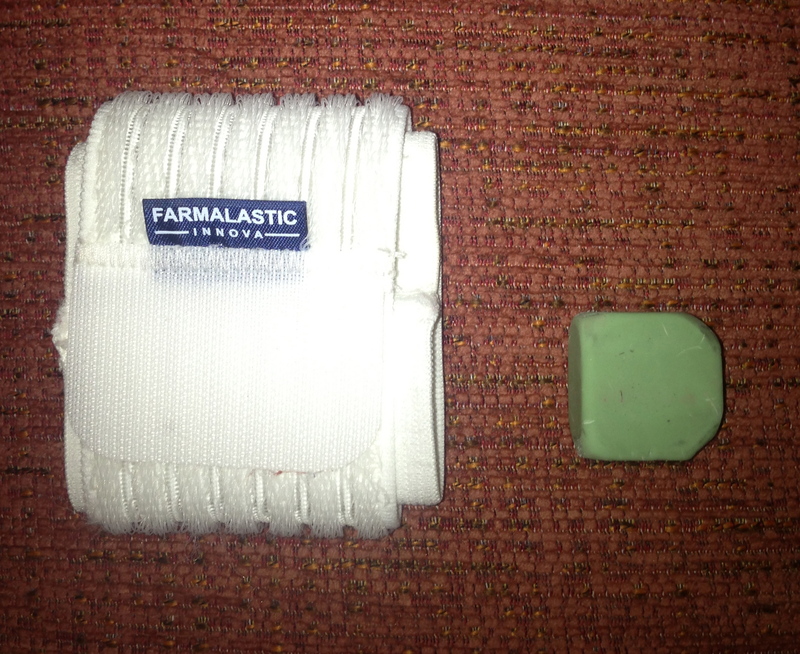 I wrapped it back in the Ace Bandage and as I type this blog it seems to be gone. Thanks to my dear husband, the gynecologist with an encyclopedia, I am now cyst free. And now since I paid to upgrade my blog to include videos here is a random Savvy video for your entertainment! 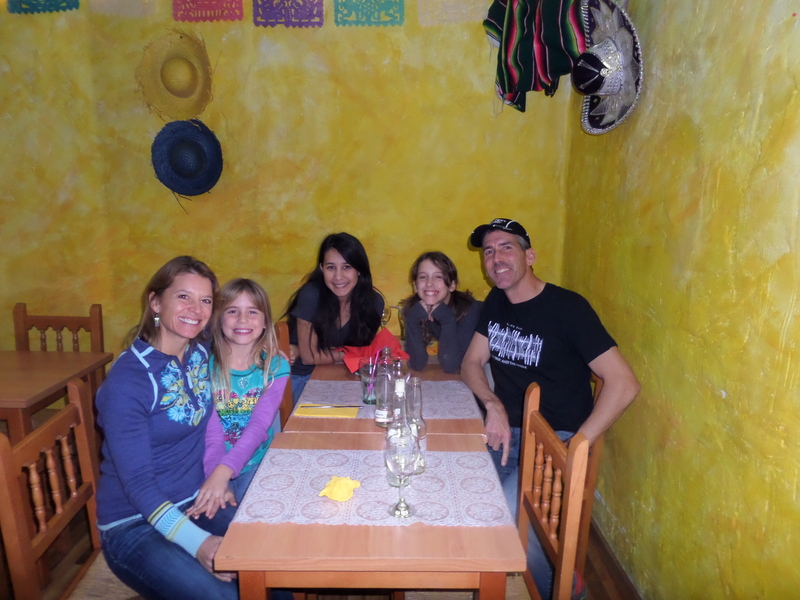 La Fiesta de la Candelaria is a holiday celebrated around the world on February 2. It also known as: One of the 12 Great Feasts, Candlemas, the Purification of the Virgin, the Festival of Lights or the Presentation of Jesus at the Temple. 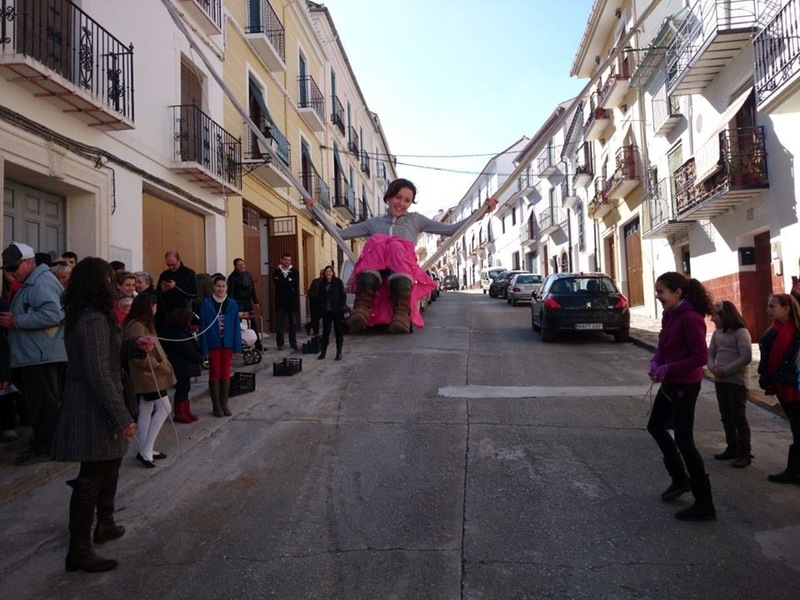 Here in Alhama the “Jameños” have their own traditions which I am pretty sure are unique. 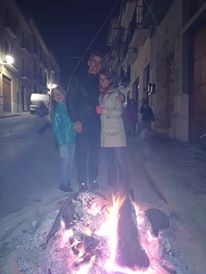 From my observations, Candelaria in Alhama is less of a religious holiday and more of a good excuse to throw a party in the streets that involves eating food with your neighbors, building big bonfires and constructing “merceores” (actually the proper word in Spanish is mecedor, but here in Alhama they are “merceores” or huge swings). It was a new festival for Team Kezmoh and I like to understand the origins of these sorts of things so I did a little research on the significance of Candelaria. 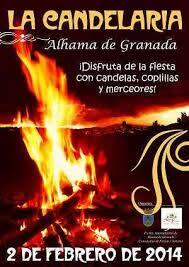 This is it in a nutshell: Candelaria occurs on February 2 which is 40 days after the birth of Jesus. Mary and Joseph took the baby Jesus to the temple in Jerusalem forty days after his birth to complete Mary’s ritual purification after childbirth and to present the child to the temple. 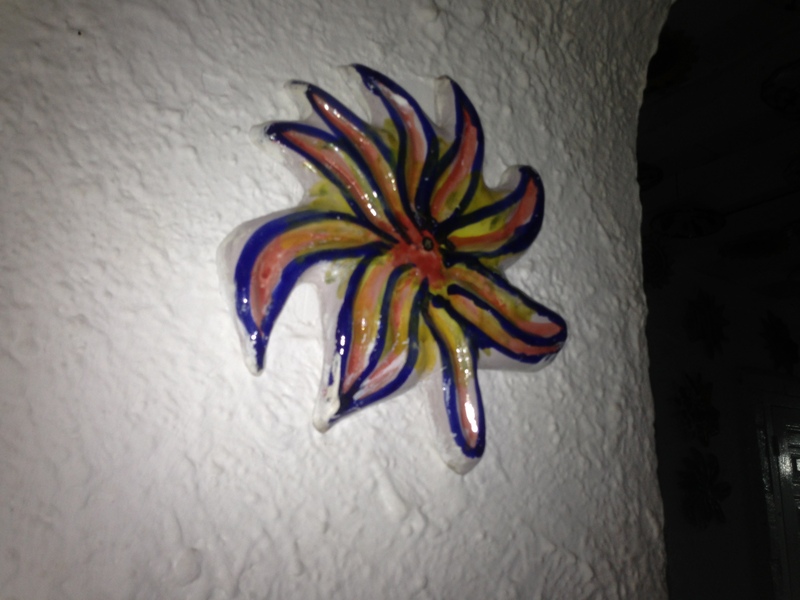 This was associated with the lighting of candles by the faithful. 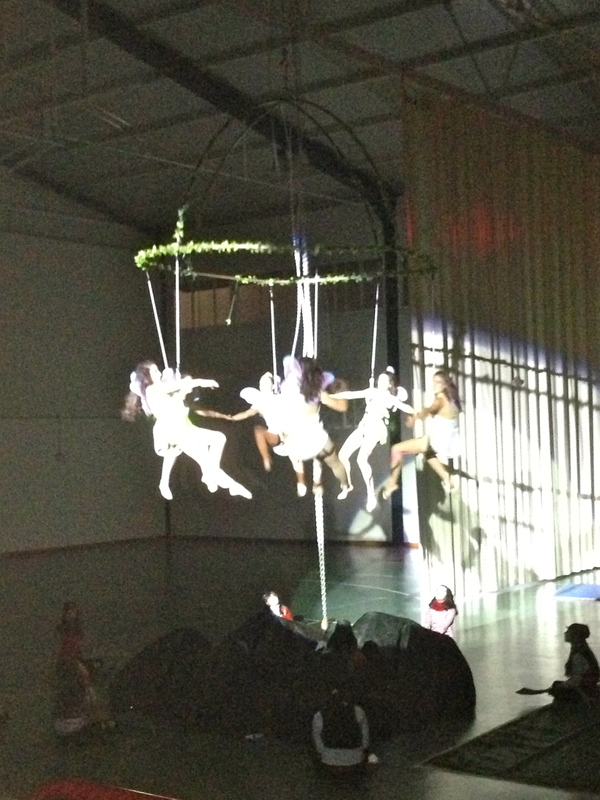 Different cultures have come up with various celebrations around the world. 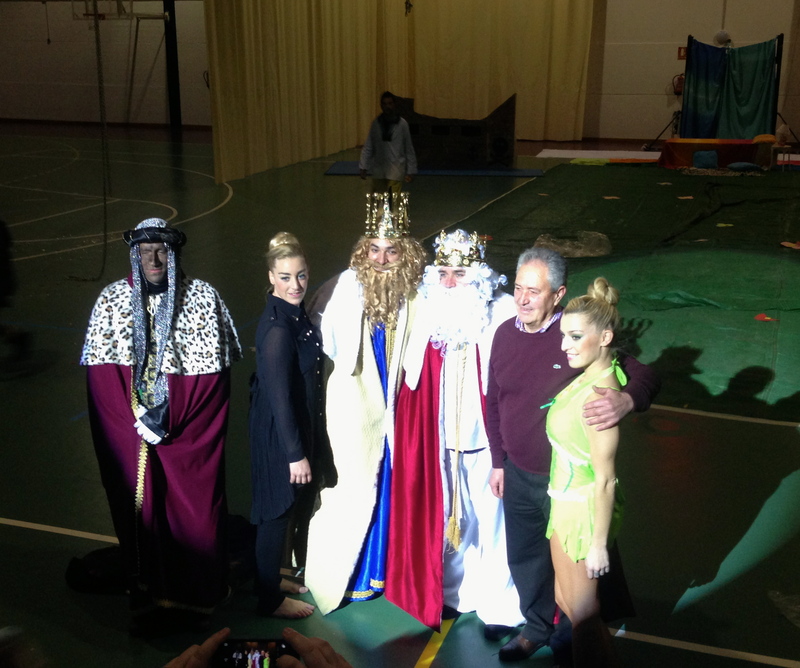 I have to say that the celebration in Alhama is very lovely and enjoyable. 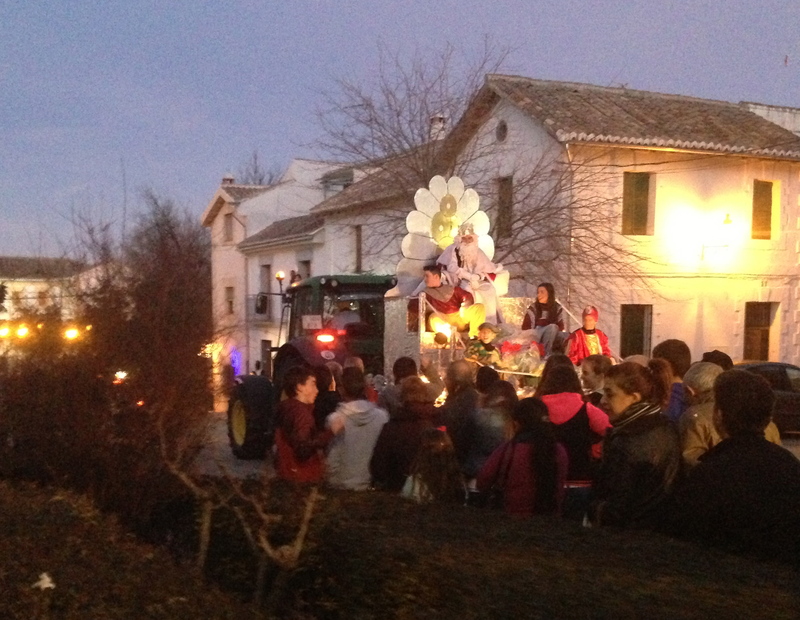 February 2 this year fell on a Sunday but the festivities at school began on Friday. 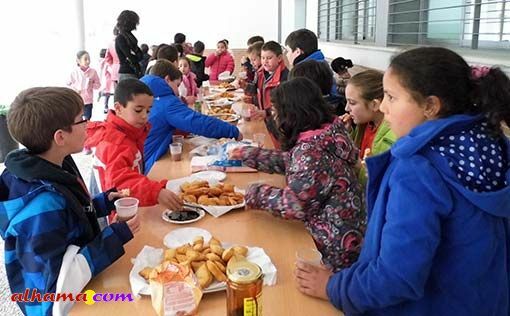 We were delighted that we were asked to join a group of parents who would be making tortitas (fried dough) and chocolate (hot chocolate) for the children. We set up tables behind the school and got to work as soon as the kids started class. We had 30 kilograms of bread dough from the panaderia. That is a lot of dough! We rolled out the dough into thin sheets and then cut it into little squares. The other mothers and fathers set up 2 gas burners. One to make hot chocolate and another to fry the dough. 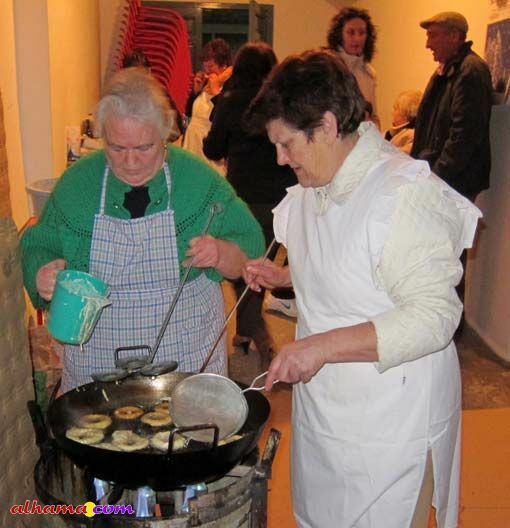 We must have made 1000 tortitas which were delicious little pockets of fried dough that can be dipped in sugar or miel de caña (a local favorite that tastes like molasses). 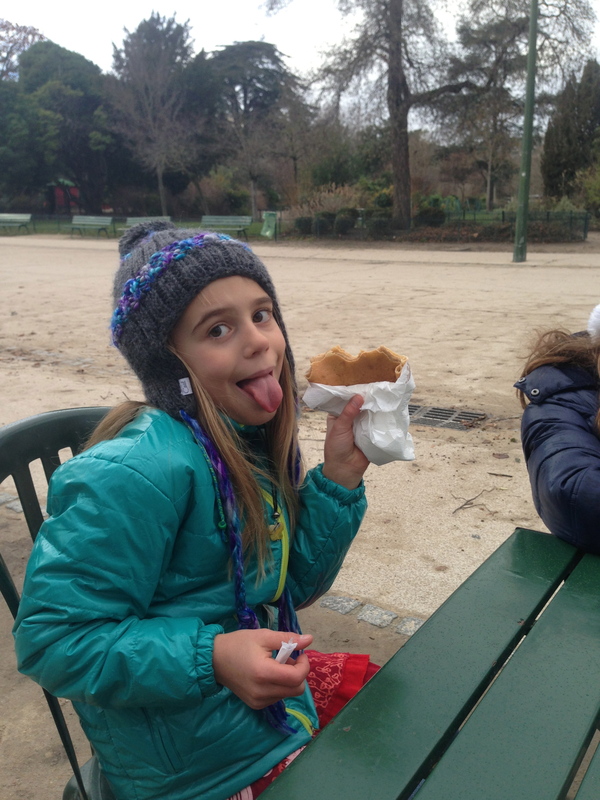 Savannah told me that the aroma of the sizzling dough and the hot chocolate traveled to her classroom. The children paraded through our mini donut factory class by class starting with the 3 year olds. 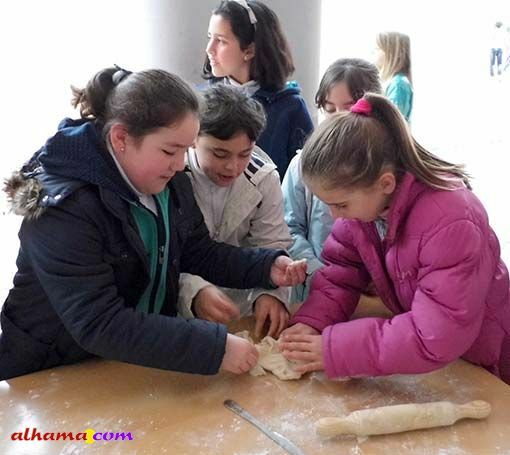 We demonstrated how we made the tortitas and the kids had fun playing with the left-over dough. 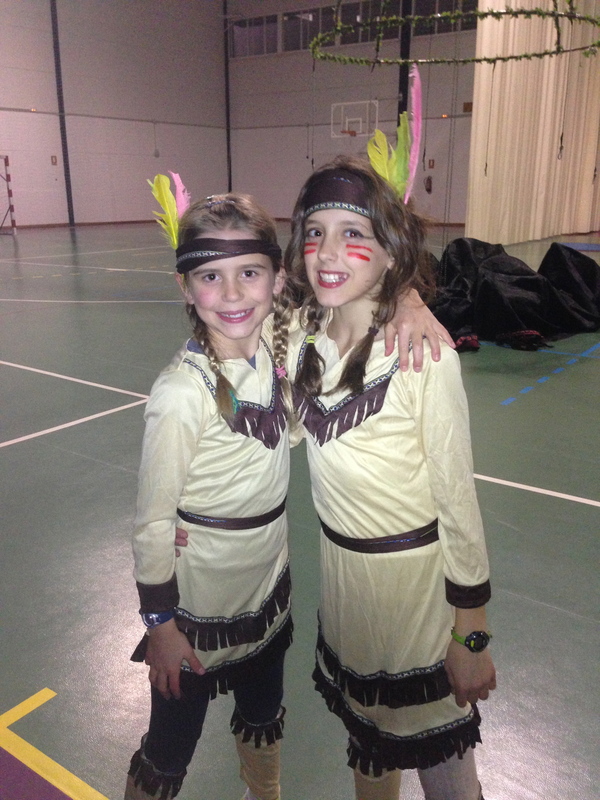 As each group came through, the parents sang traditional songs that all the Jameños know by heart. One of the teachers took the time to write out some of the most popular songs so we were able to join in. 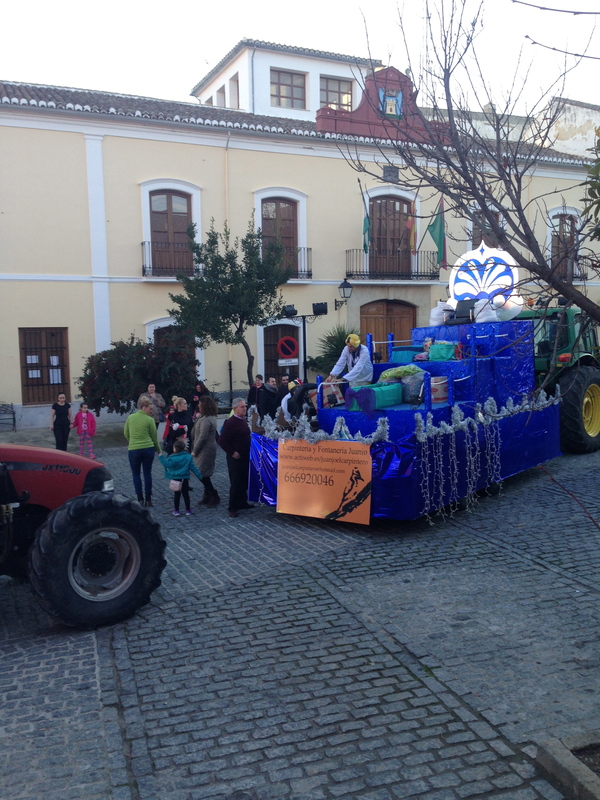 Angela, Natalia, Paula, Silvia and Eva C.
On Sunday the real Candelaria festival began. 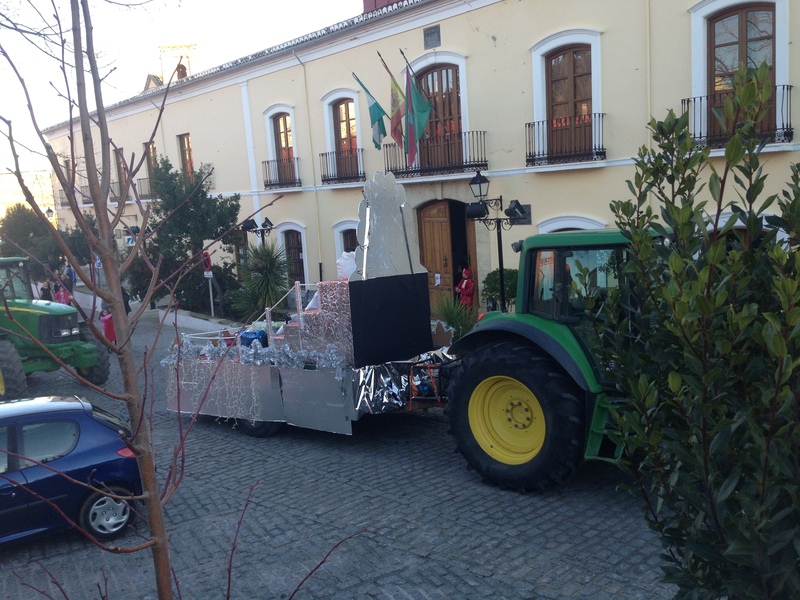 In the morning we stood on our balcony and watched our neighbors on Calle Enciso set up one of the biggest merceores in town. Sky excitedly ran up the hill because this swing was at her friend Ana’s grandmother’s house and her friends would all be there. 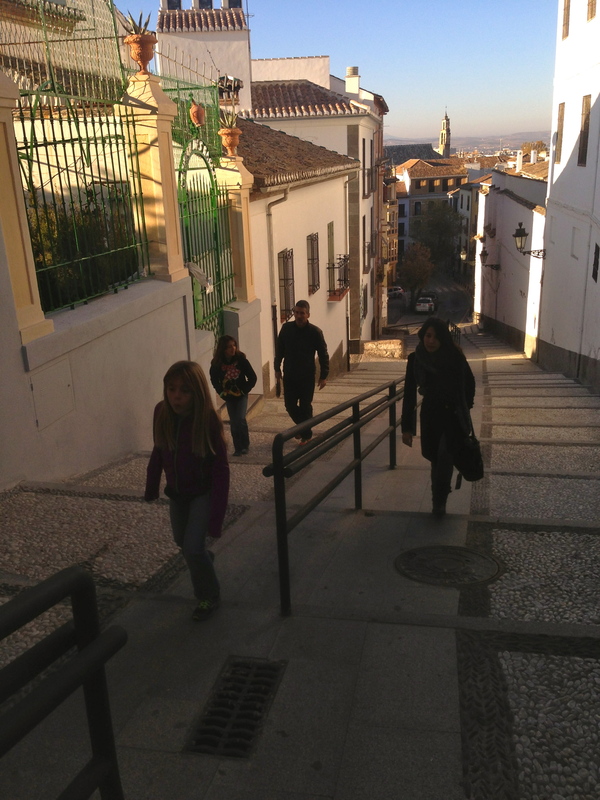 Calle Enciso is a steep, narrow street. The swing was set up between balconies with 2 strong ropes with a cloth seat rigged around the 2 thick cords. I watched the men test it and was glad to see that it held their weight. 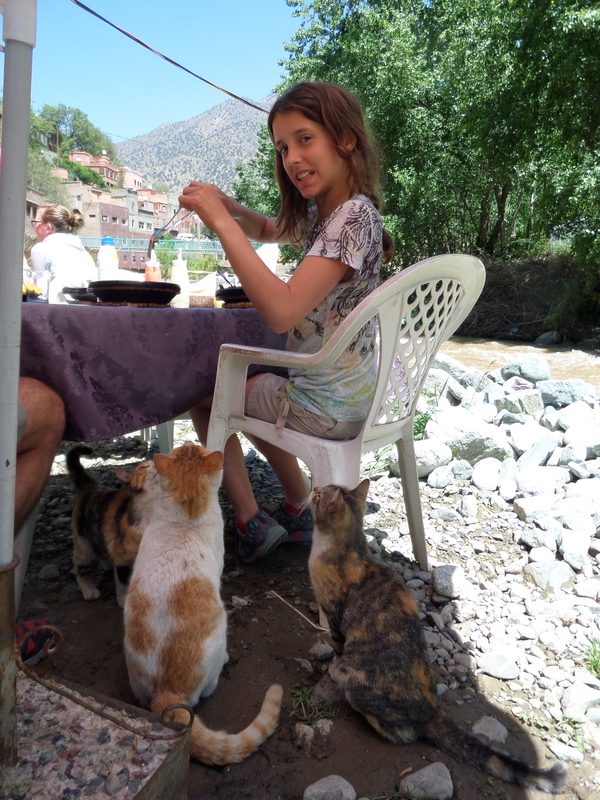 At lunchtime, next to the merceor, Ana’s grandmother and her neighbors gave away free vino del terreno (homemade wine, moonshine Mike says) and sold steaming bowls of garbanzos with potatoes and chicken. 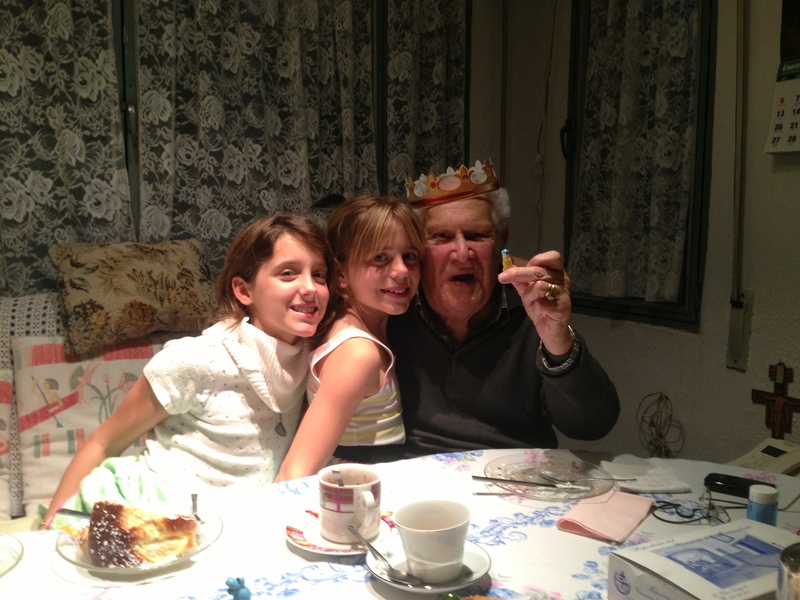 For dessert one could buy pastries and muffins made by the grandmothers of the neighborhood. All of the proceeds went to charity. 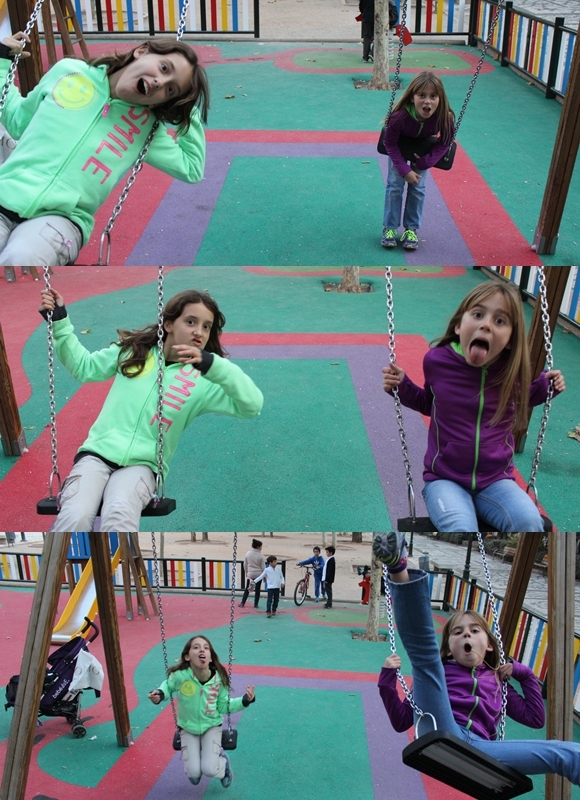 Sky, Savannah and their friends took turns on the swings. 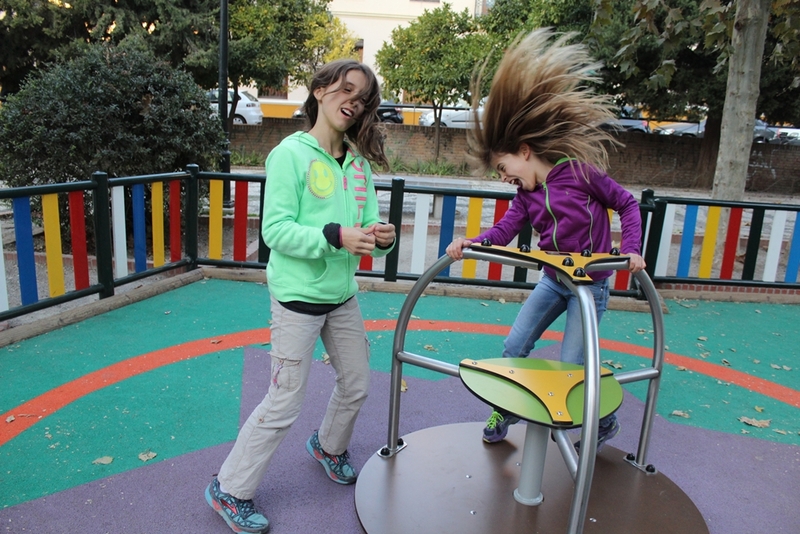 Their laughter and smiles made me warm on the cool day. I sent a video to my brother, Peter in the US. 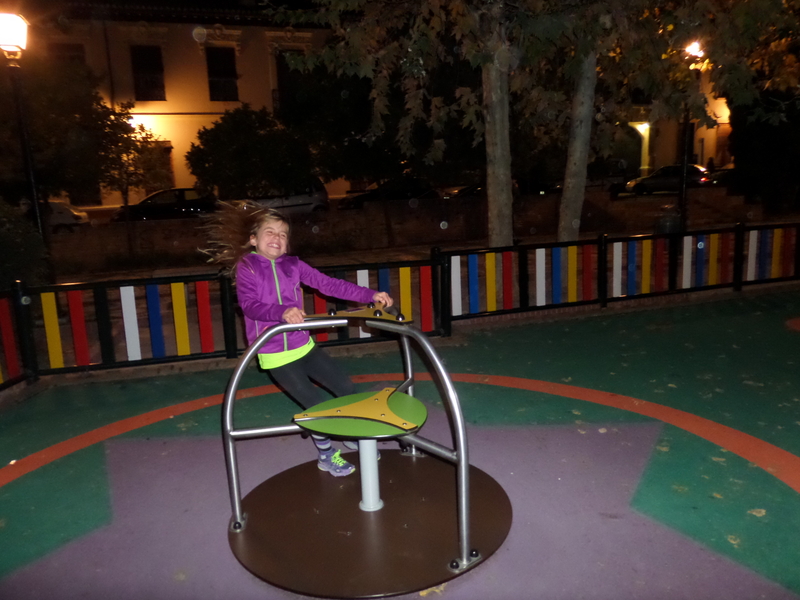 He commented that back home the children would need a parental consent form, a helmet and a safety belt to climb on board the homemade swings. So true, I’m glad that there are still places in the world that worry less and live more. 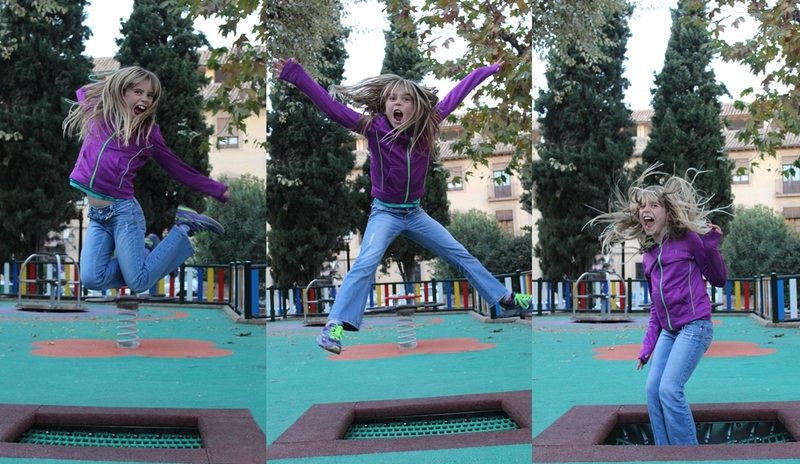 Savvy swinging. Sky pulling the rope. 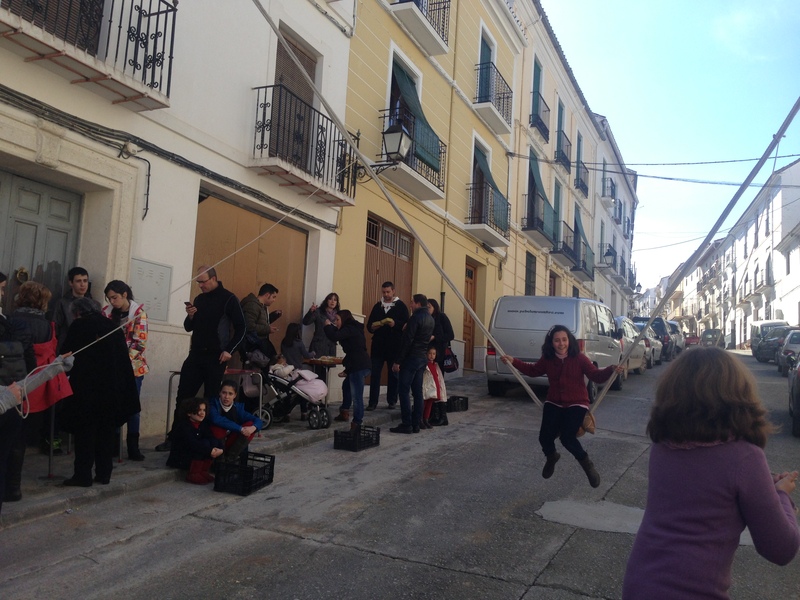 Our neighbors in Alhama de Granada singing. 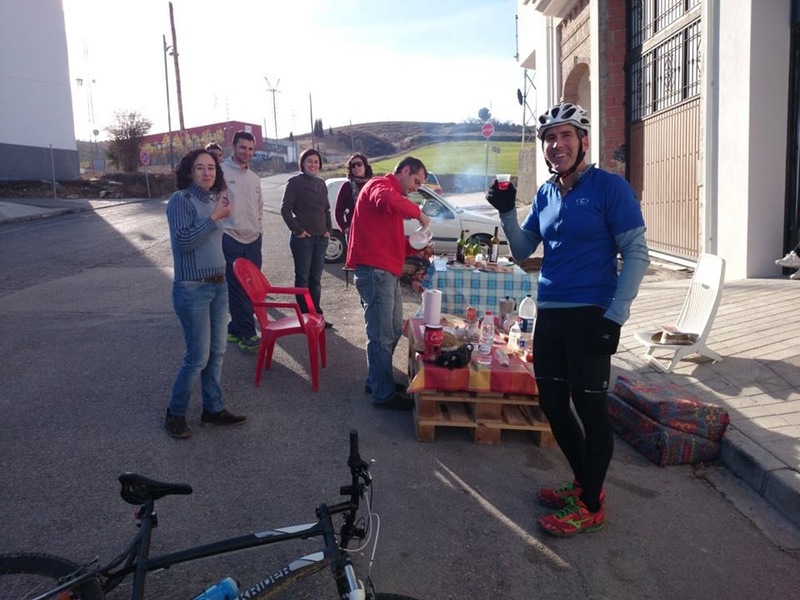 Mike and Francisco had a midday bike ride and on their way back into town stopped at Maria José’s house for some vino del terreno. 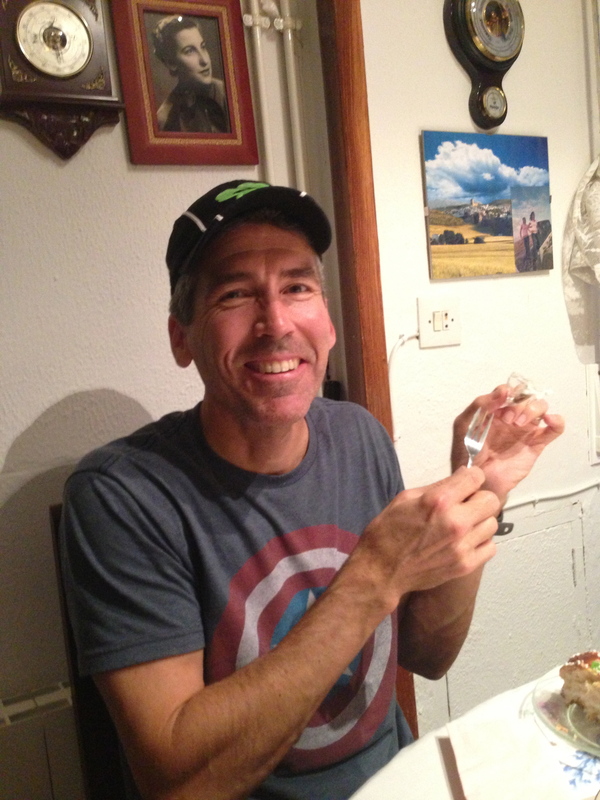 Mike coming home from his bike ride enjoying some moonshine! 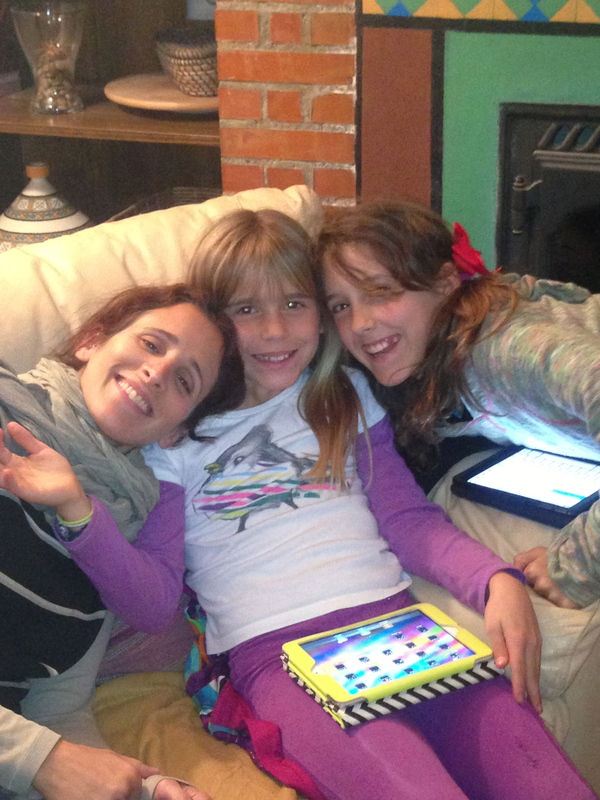 On the far left is Mari Carmen, Sky and Savvy’s lovely Spanish tutor. 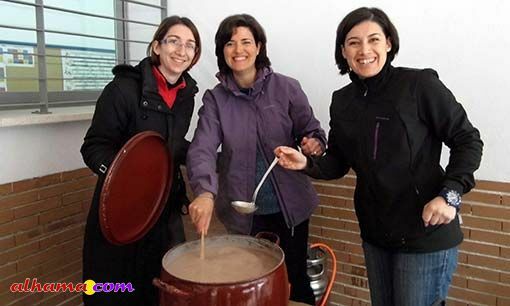 After nightfall Ana’s grandmother and her friends served hot chocolate and buñuelos. 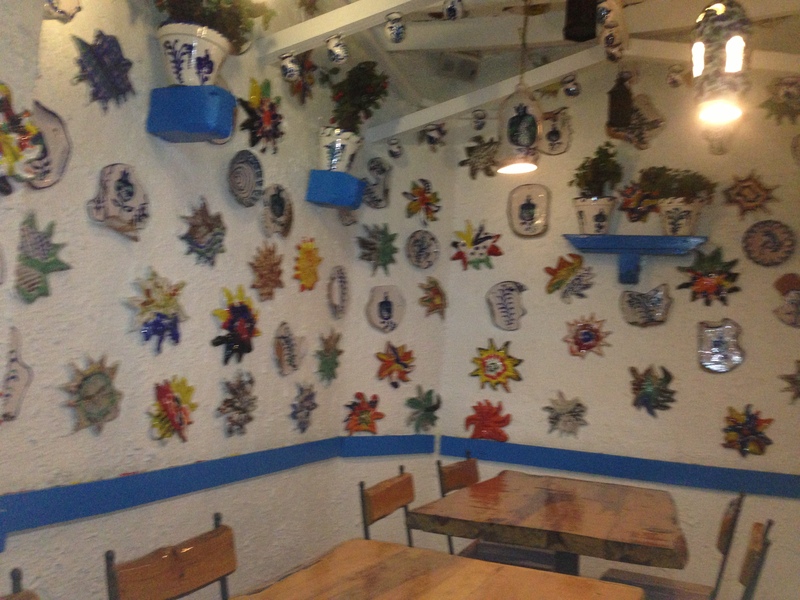 We ordered buñuelos for 4 people which was more than enough for everyone in our group. 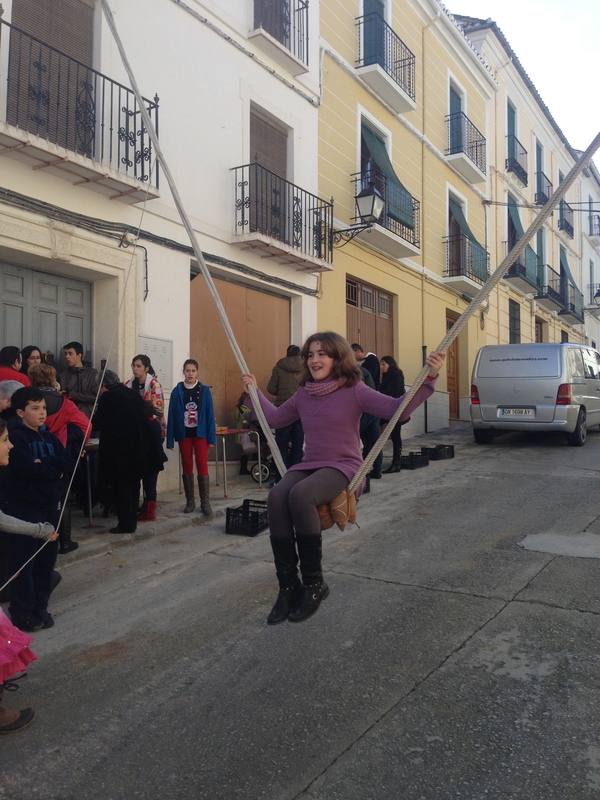 The buñuelos came tied on strings called espartos which are made from thin reeds. We kept warm by the lumbre, dipped our steaming buñuelos (donuts actually) in hot chocolate and visited with friends and neighbors. Late into the night the lumbres glowed on every street corner. It was a village-wide block party. 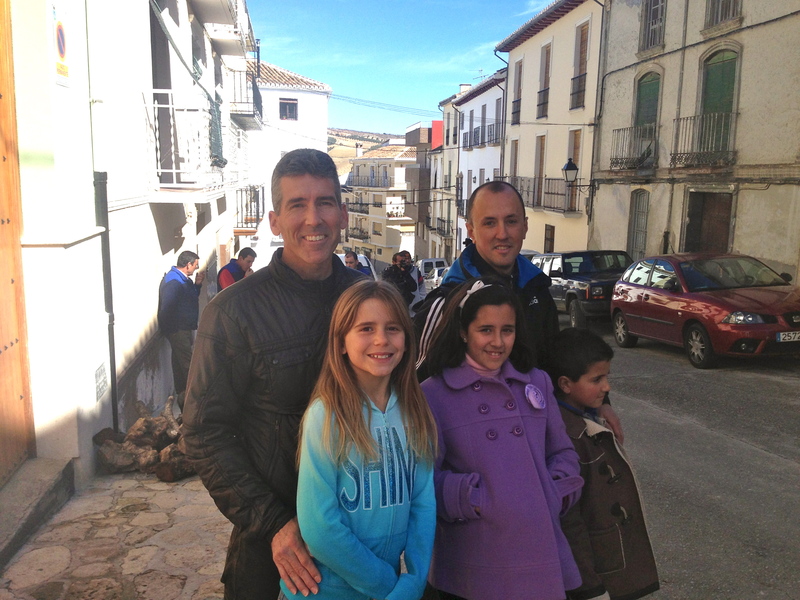 We spent most of our time near our local merceor with Team Aguilar, our good friends. 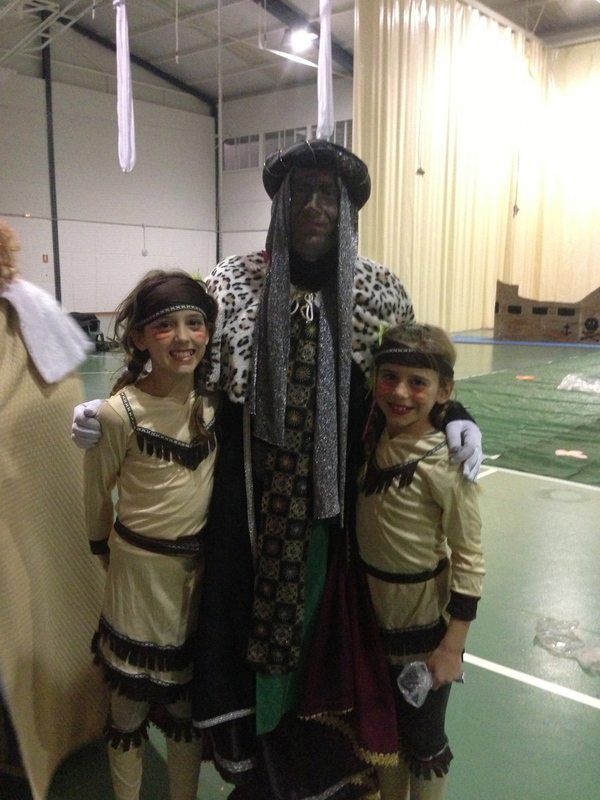 After La Fiesta de la Candelaria we felt a little bit more Jameño and we went to bed feeling happy to be in Alhama. 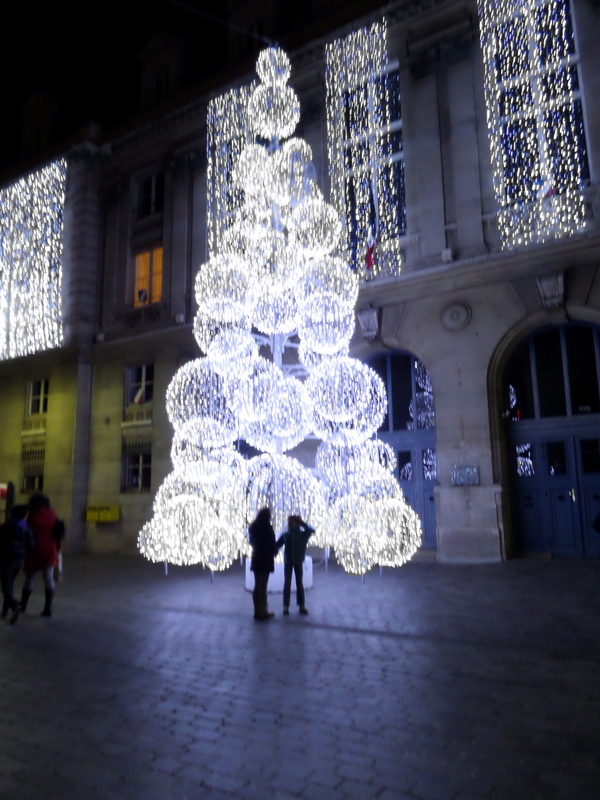 Christmas in the City of Light! 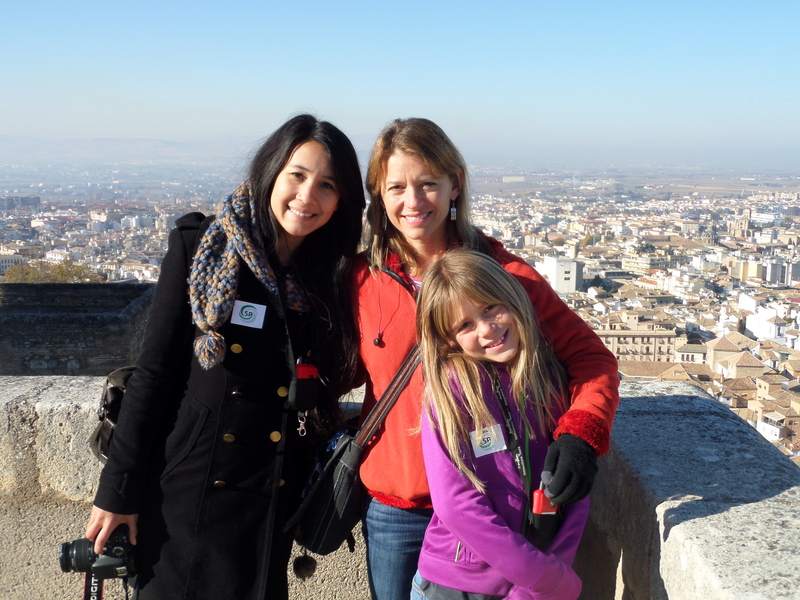 Our family, Team Kezmoh, had been planning a trip to Spain since before Sky and Savannah were born. We have been talking about the adventure for many years. 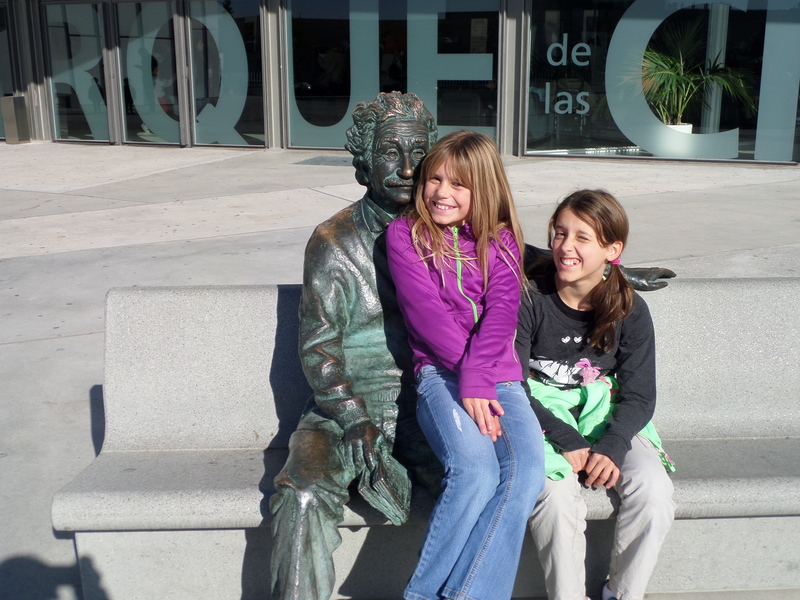 Although spending a year in Spain had been a dream for Mike and me, it was not really Savannah and Sky’s first choice for 4th and 6th grade. With that in mind, we thought that if there was anything that they really wanted to do in Europe we were going to do our best to make it happen. 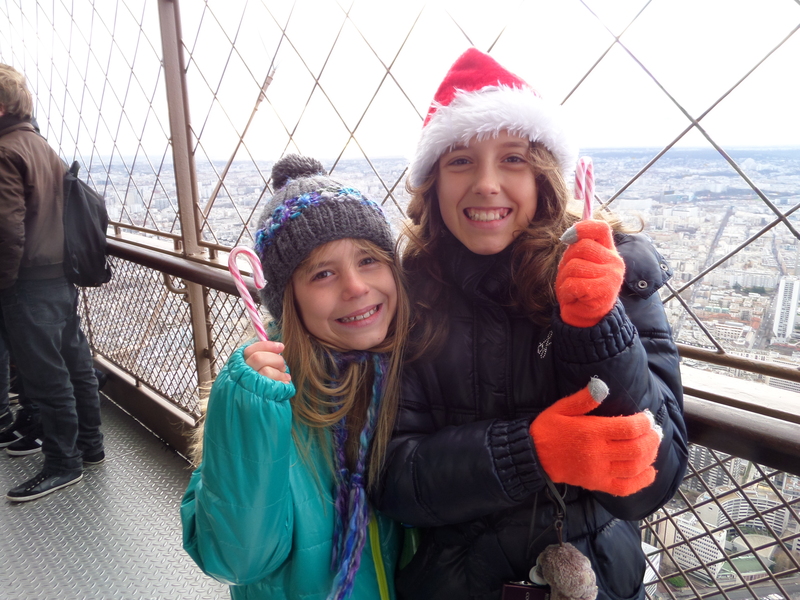 I am not sure what first inspired Savannah, but she has been talking about spending Christmas in Paris for as long as I can recall. 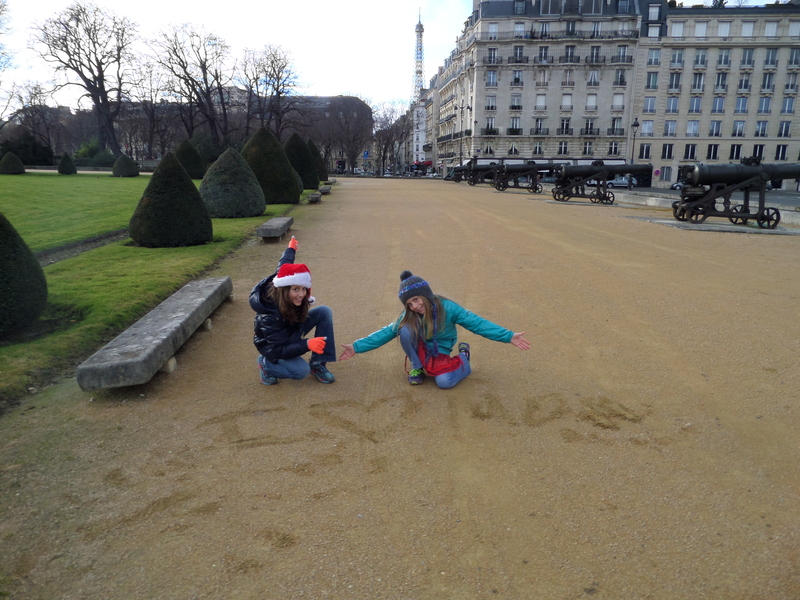 Therefore, we had to make a trip to the City of Light! 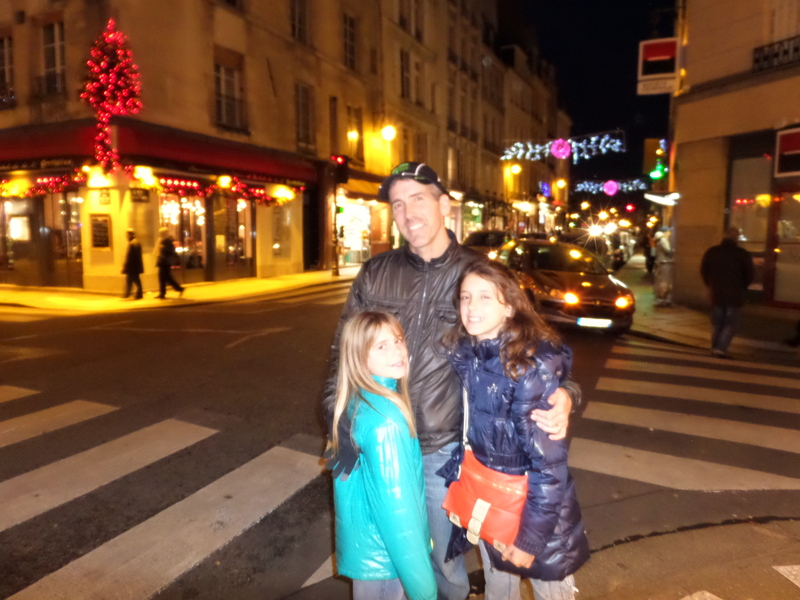 In this post I plan to tell the story about our visit to Paris for family and friends. However, to make it a little more interesting I will include fun facts about the places we visit and hopefully some will learn from our experiences and/or mistakes for their own voyage to this lovely city! 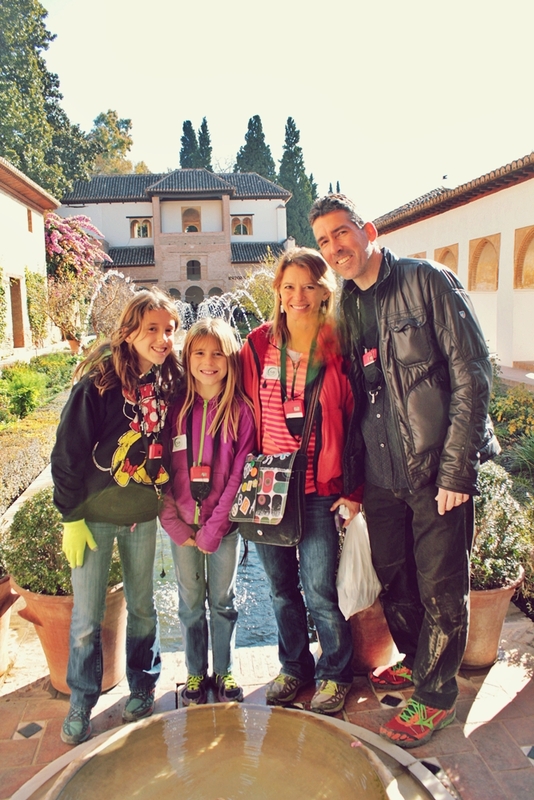 Getting There: We flew from Malaga, Spain and found a flight which was surprisingly inexpensive. One thing I’ve learned is that if something is unusually cheap there is often a reason. We flew on Ryan Air which has an excellent safety record and a reputation for their low prices. 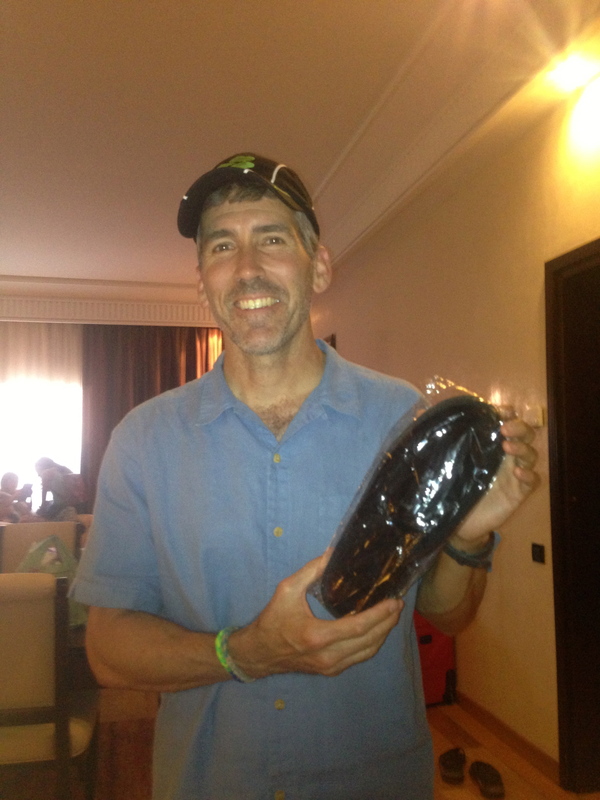 We were informed that there was a strict baggage allowance so we were careful to only pack small carry-on bags. 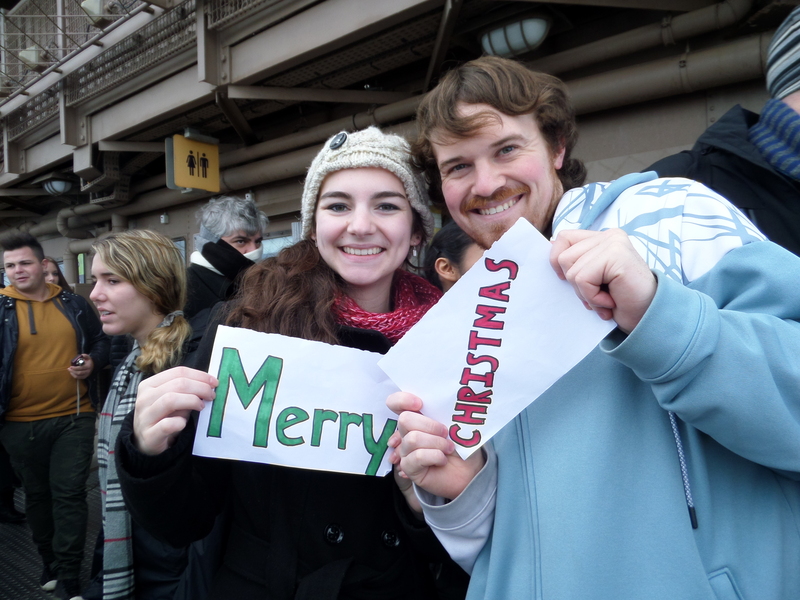 We also, luckily, learned that one must arrive early to cue up to get on the plane in order to get seats together. We paid a fee to have seats pre-assigned which was really worth it as the plane was completely full and the seats were smaller than usual. There are 3 airports that serve Paris. Charles de Gaulle (CGD), Orly (ORY) and Beauvais Tille (BVA). We flew into BVA which, after I made the reservation, Mike pointed out was actually closer to Brussels than Paris! I then later read on tripadvisor.com that one should never fly to BVA unless there is no other choice. No wonder it was cheap! A coke can with Miguel on the side! 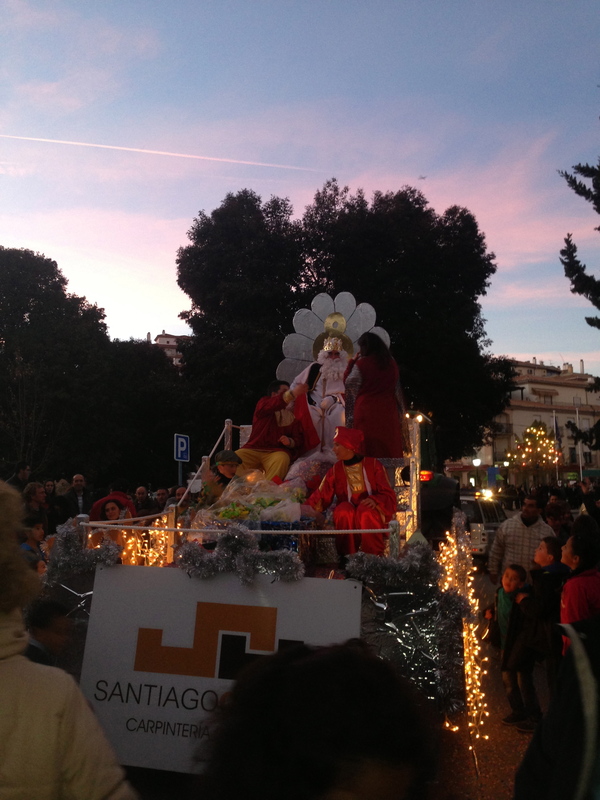 Security in Malaga was interesting. Savannah wrote about it in her journal so this memory is thanks to her. 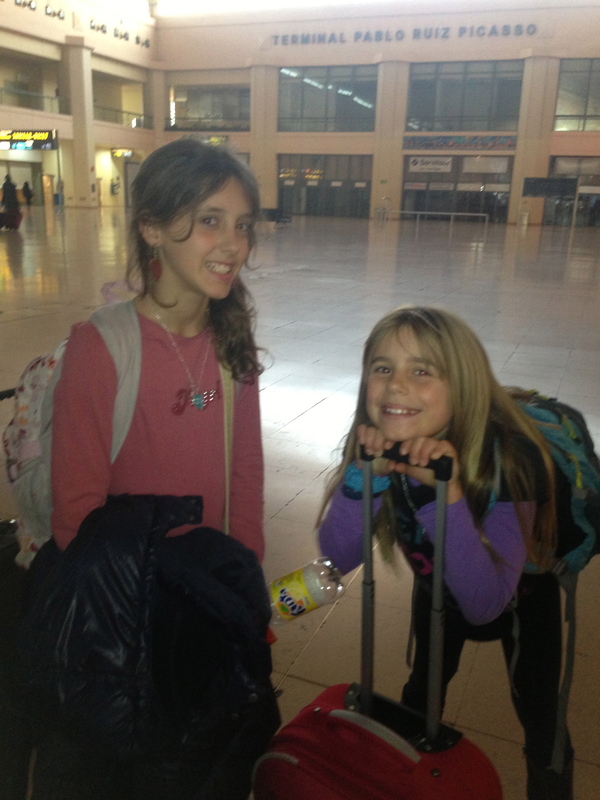 Sky and Savannah are expert travelers. They know not to bring liquids or sharp objects and are quick to remove their iPads from their backpacks and their boots from their feet. 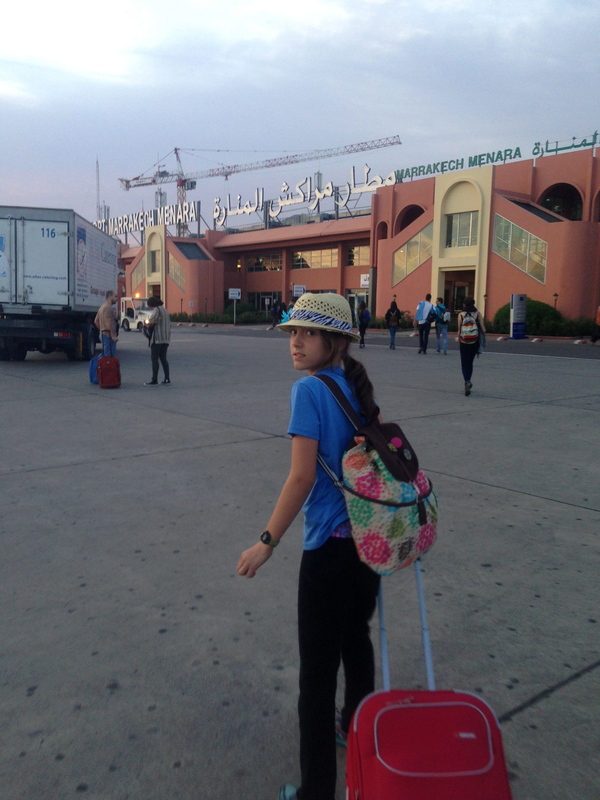 Savannah watched as the security woman pulled her backpack off of the conveyor belt. She thoroughly checked it and found Savvy’s school pencil pouch. She opened it and found scissors that had been forgotten. We watched as she carefully, very seriously, inspected them and then zipped them back into the pouch and returned the backpack to us. Savannah also watched her pull a large bottle of lotion out of a woman’s bag, open it, rub some on her hands and return it to the owner. Sensible security, I say. No one is going to die from lotion or safety scissors (We did, however, lose the scissors at airport security on the way home from London). As I mentioned, we arrived to BVA late. Our shuttle driver met us outside of customs with a sign with our name on it. We introduced ourselves, he grabbed one of the bags and we had to scurry to keep up with him to the car. He informed us that he was from Sri Lanka but had lived in Paris for 20 years. 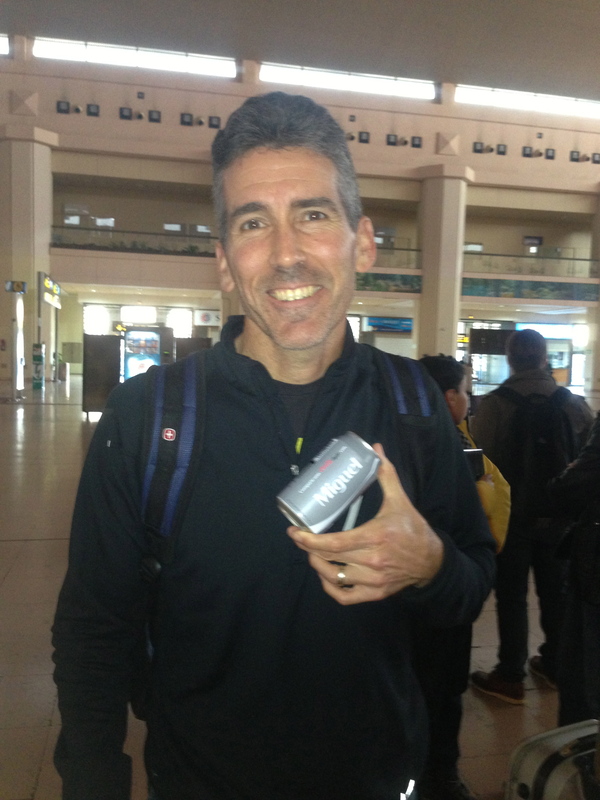 He seemed to speak English but could not respond to questions like “what is your name?”. Unfortunately for the family of motion sick travelers he had a nauseating style of driving. He constantly pumped the gas pedal giving the feeling that the car was constantly slowing or lurching forward. We asked him to stop doing it but he didn’t seem to understand. 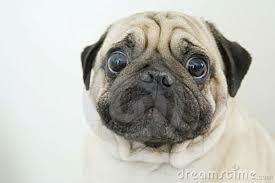 We also got the definite impression that he could not see well. Although the speed limit was 120km/hr, he drove along slowly in the right lane between 80-100km/hr. Cars sped past us as we rocked slowly along to Paris. When we got to Paris he turned on his portable GPS and placed it over the speedometer which did not inspire confidence. We finally reached the address according to the GPS. He pulled up to a corner and told us that we were at our destination and that we should get out. Near the corner there were young men milling about and the police were questioning them. I told him that we were not getting out of the car until I could see the entrance to the apartment complex. (Meanwhile Mike was preparing to vomit in the front seat if he had to endure any more of his terrible driving.) I called Monique, our apartment hostess, who told us that she would come outside to help us find our way. Our driver reversed his car down the one-way street. Just as I spotted Monique, the police became very interested in our taxi. We got out to unload the luggage, the police came over to us and started asking our driver for his registration and taxi license. I tried to pay the taxi driver but the police officer told me (in English) that the driver might not be legal and that we should not pay him. Our driver looked very upset. Although it was a terrible trip from the airport he did pick us up in the middle of the night and did drive us over an hour to Paris so I felt like I needed to pay him regardless. Thankfully, Monique appeared to rescue us. She was lovely and very fancy as we were soon to learn is a theme in Paris. Everything is fancy: the way they speak, the way they dress, the buildings, the parks, and even the entrances to the metro are fancy! Monique, in her fashionable clothes spoke to us in English with a lovely, fancy, French accent and offered to take the girls upstairs away from the group of young men leering at us and the police interrogation. The girls were exhausted and happy to follow her into the warm building. As soon as they disappeared I began to panic. 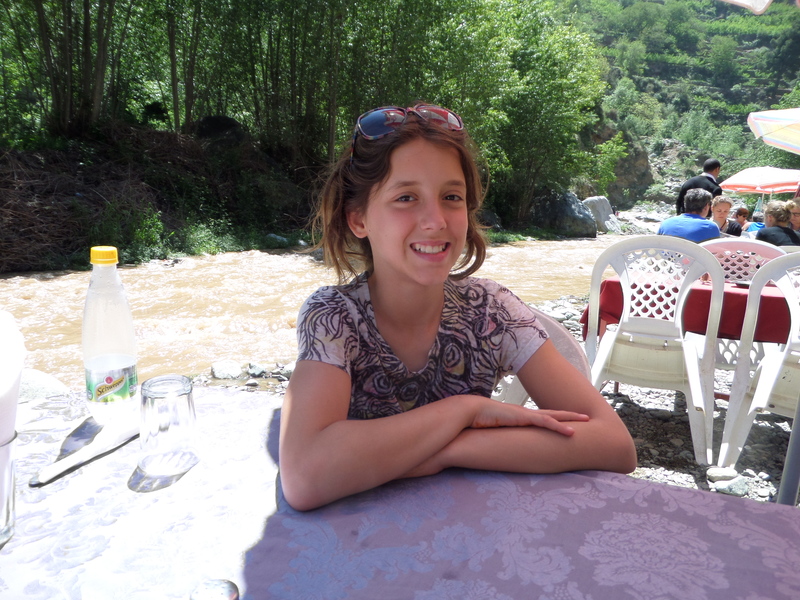 Who turns their children over to a complete stranger as soon as they arrive in a new city? The police, finally satisfied with what’s his name’s papers, allowed me to pay him and they both left. Mike and I stood outside for a long 2 minutes while we waited for Monique to reappear. She welcomed us with kisses and led us up to her apartment on the 27th floor. 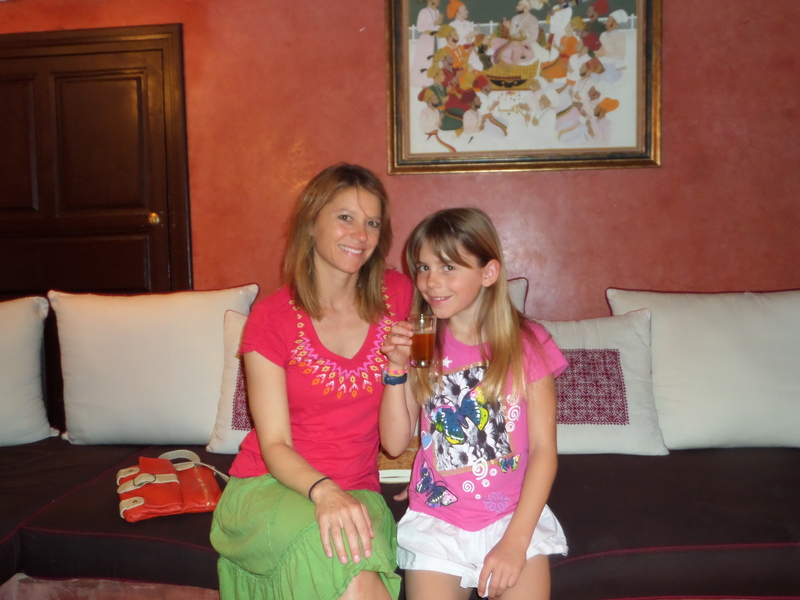 The girls were already relaxing on the sofa having a drink in the beautifully decorated apartment. Monique gave us a tour and showed us how everything worked. Monique could give lessons on the perfect holiday rental! She had truly thought of everything. 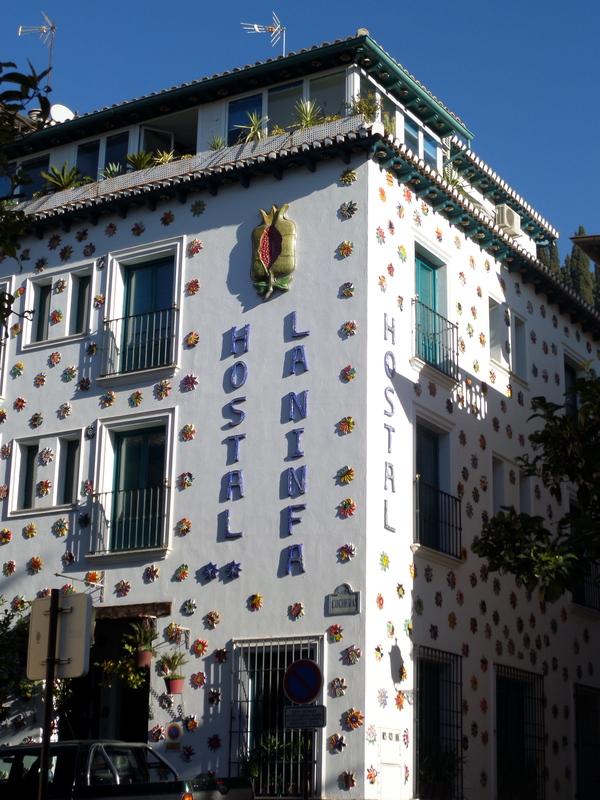 The apartment was well equipped with all of the normal appliances but she also had a milk steamer, an electric teapot, an automatic coffee maker, washing machine and dryer and an excellently stocked kitchen. She showed us the refrigerator that already had fresh milk, eggs, orange juice, butter, jam, macaroons (little cookies) and what else in France? Champagne! She showed us the bedrooms. 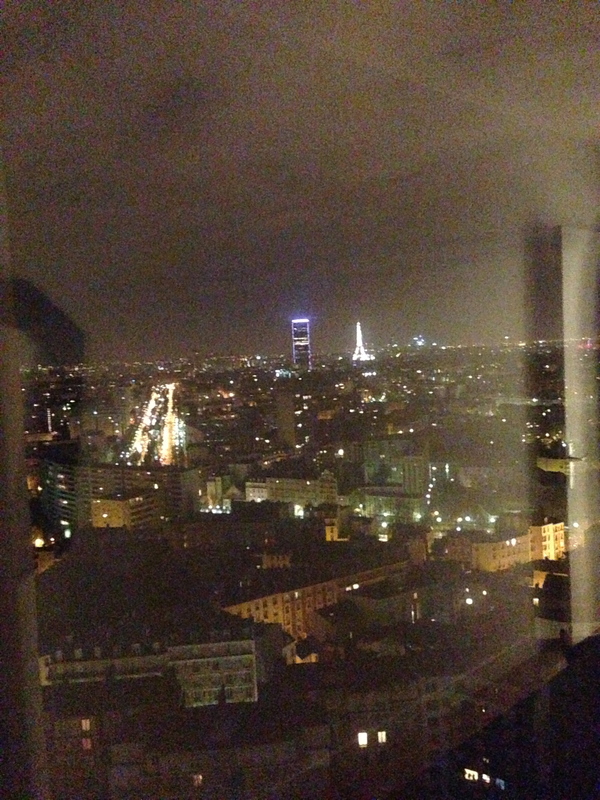 Both had views of the Eiffel Tower which was about 4 miles away. It was lit up for Christmas and sparkled in the distance. Savannah has been drawing pictures of the Eiffel tower for years and chose the side of the bed with the best view so she could go to sleep and wake up looking at the Tower. We were getting ready for bed and the girls called us into their room. It was midnight and the Tower was not only lit up, but the lights danced up and down the length of the magical structure. It was a perfect end to a very long day of traveling. Where to stay: The first thing I learned making reservations for accommodations was that Paris is divided into 20 districts or arrondissements. Paris is situated on the River Seine (pronounced “sane”, rhymes with chain). 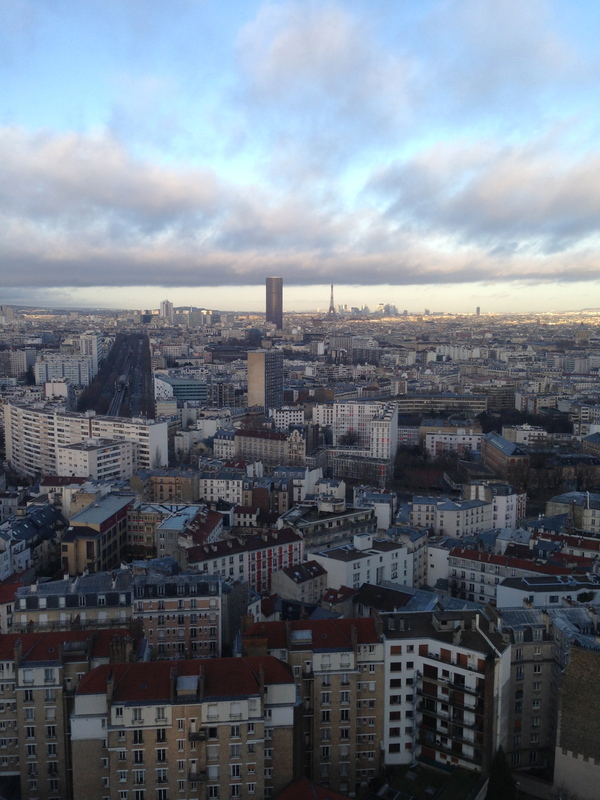 The arrondissements are arranged in a clockwise spiral starting at the middle of the city. The first is on the North bank of the Seine and this is where the Louvre is found. 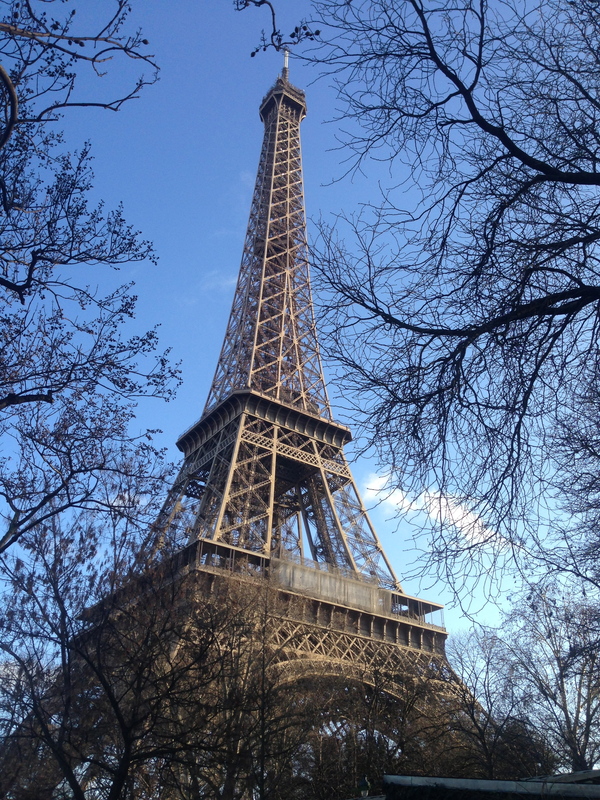 The Eiffel Tower is in the 7th arrondissement. Generally the lower the number, the more expensive the hotel will be. 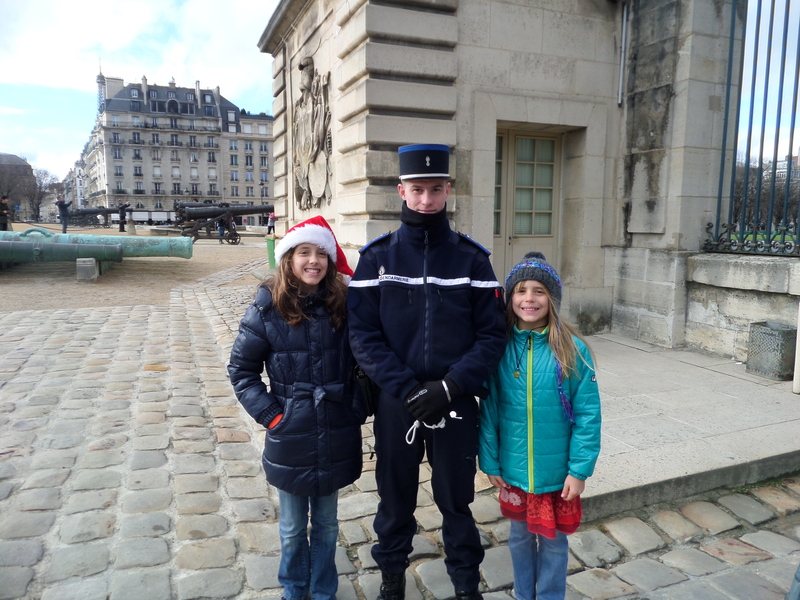 We stayed in an apartment in the 13th arrondissement and although we weren’t within walking distance to the major attractions there was a metro stop a very short walk away so we never felt far from anything, well, except the airport. 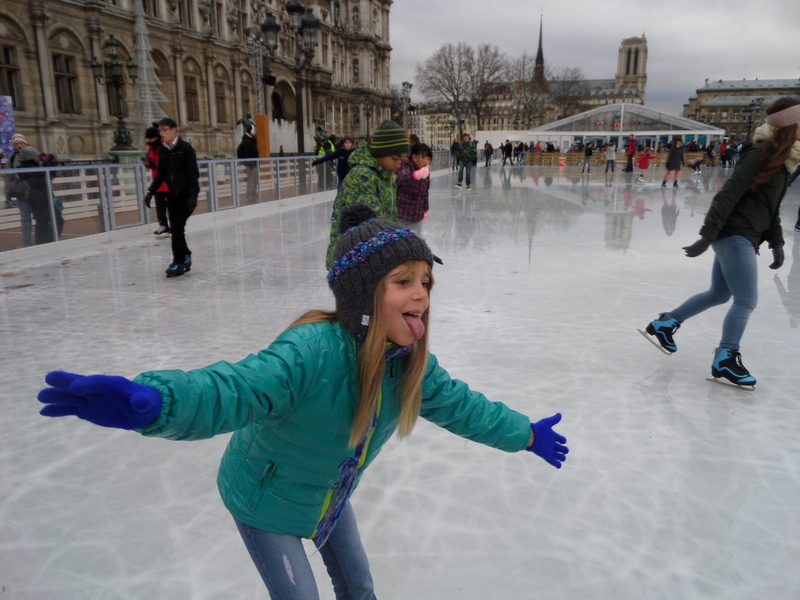 Getting around in Paris: If you stay near the Seine it is probably possible to walk to the majority of the sights but, for most people, especially those with children, the metro is the best option. There are two train lines, the metropolitan (metro) and the RER. The metro runs from 5am-12:30am. 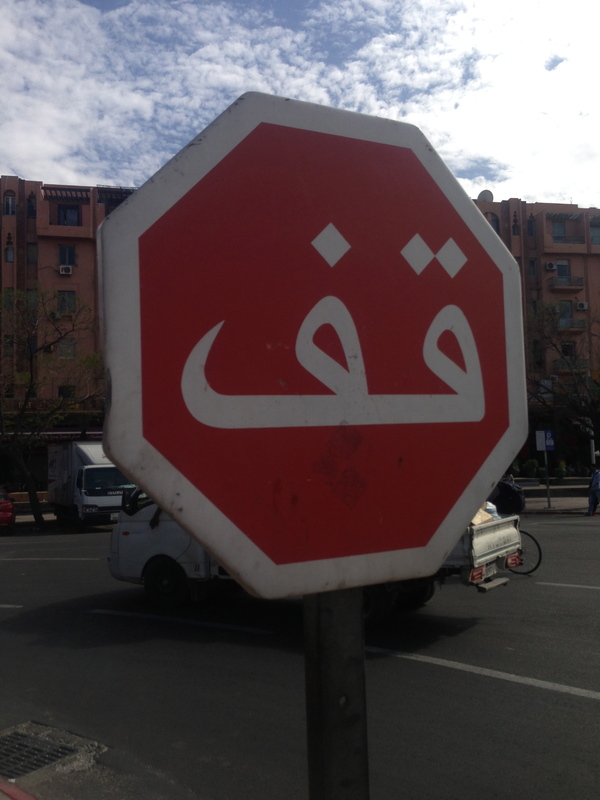 There are stops everywhere. 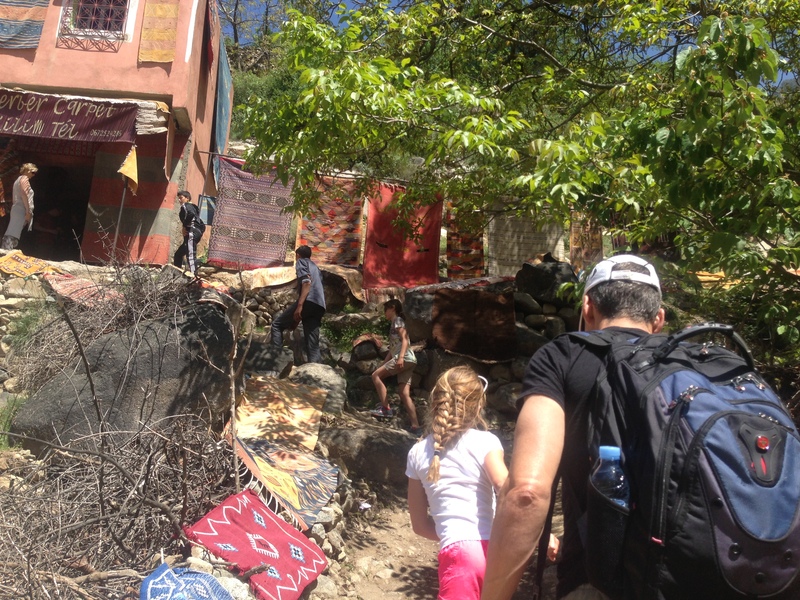 We found that wherever we were, we could walk in almost any direction, and within a couple of blocks we would bump into a stop. Tickets can be purchased singly, in books of 10, or as day passes that are unlimited 1,2,3 and 5 days. 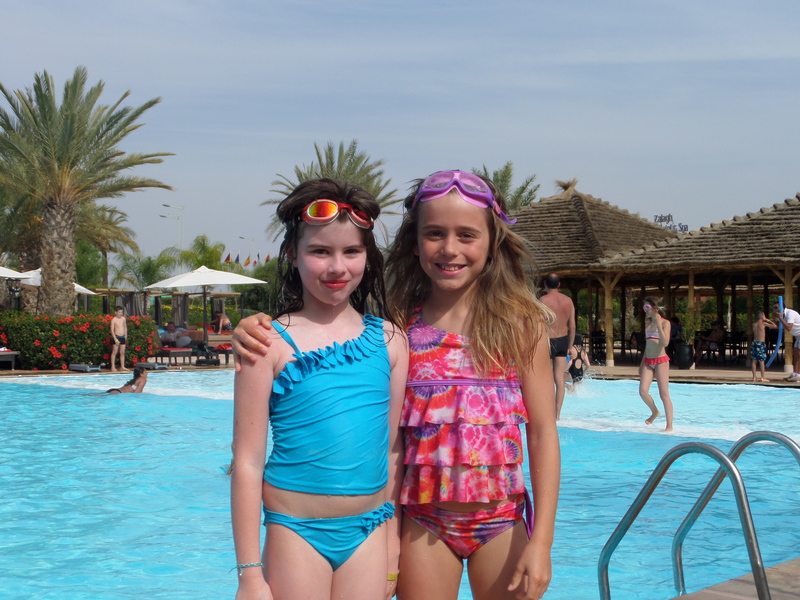 There is also Le Paris viste passes which offer unlimited travel in certain zones and discounts to some attractions. We didn’t want to be limited to zones and figured that we would probably only ride twice daily so we bought our tickets in 10 packs which for our purposes turned out to be cheaper. The RER line is faster and has fewer stops than the metro. It costs more if you leave zones 1 or 2. My best advice to navigate the subway system in Paris is the “Paris metro app” which can be downloaded to your phone. Our first morning we were excited to explore the city. Monique had a good supply of Paris guides on her bookshelf so I grabbed Rick Steves’ Paris and we were off. 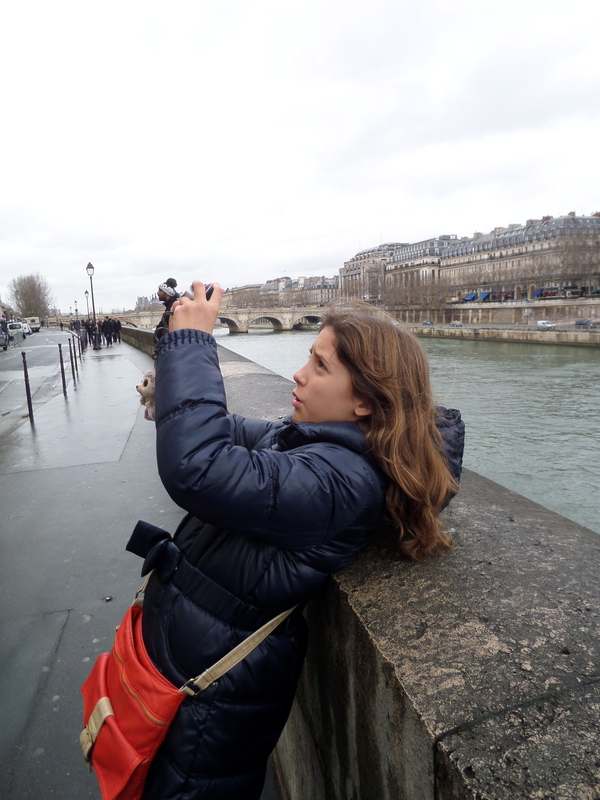 The book recommended that we start where the city began, on the River Seine. Mike is a University of Notre Dame alumnus so we could not miss the Notre-Dame Cathedral and we planned to make it our first stop. Our apartment building had an indoor shopping mall beneath it. We walked through the mall and found the Place ‘d Italie metro stop just outside. 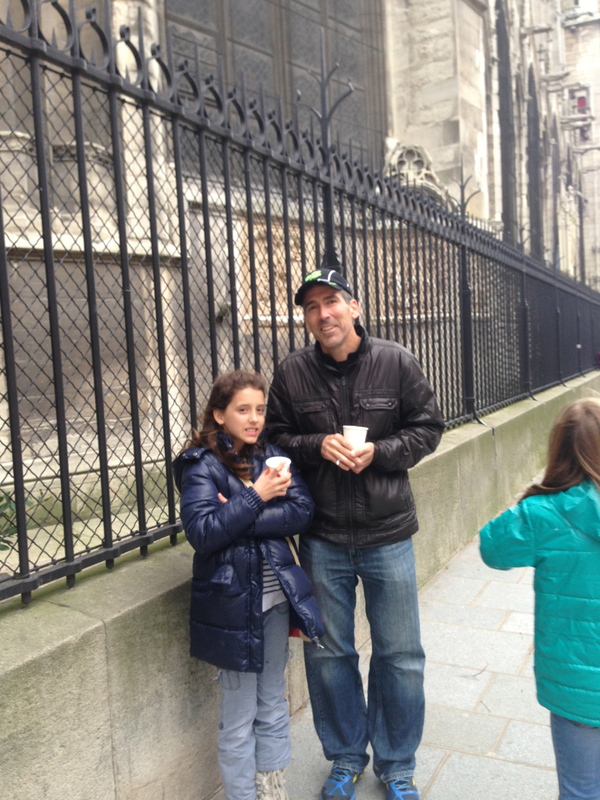 Our first impressions of Paris, although cold and rainy, were of the grandness of the place. Walking along the Seine we were surrounded by other tourists armed with maps, tour books and cameras. 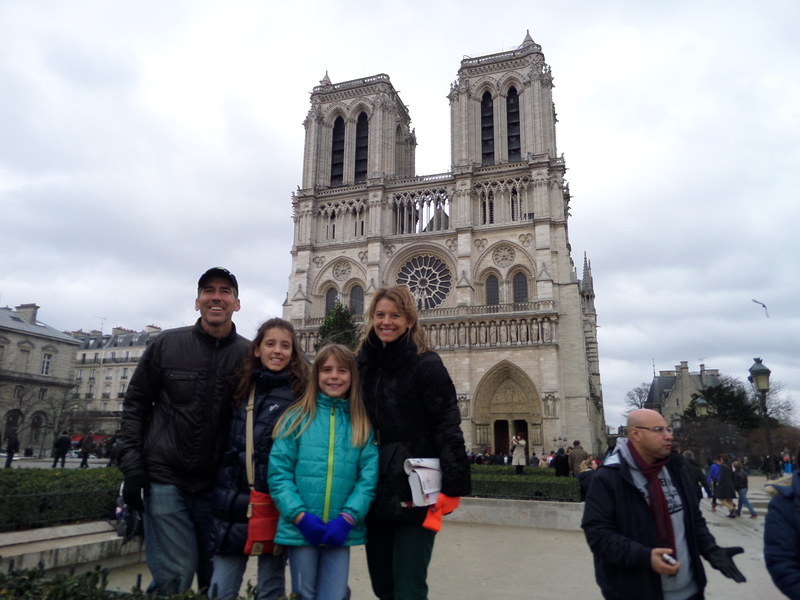 We met a nice family from Indiana on the street and walked with them to Notre-Dame Cathedral where we took turns snapping photos of each other’s families as we exchanged travel stories. 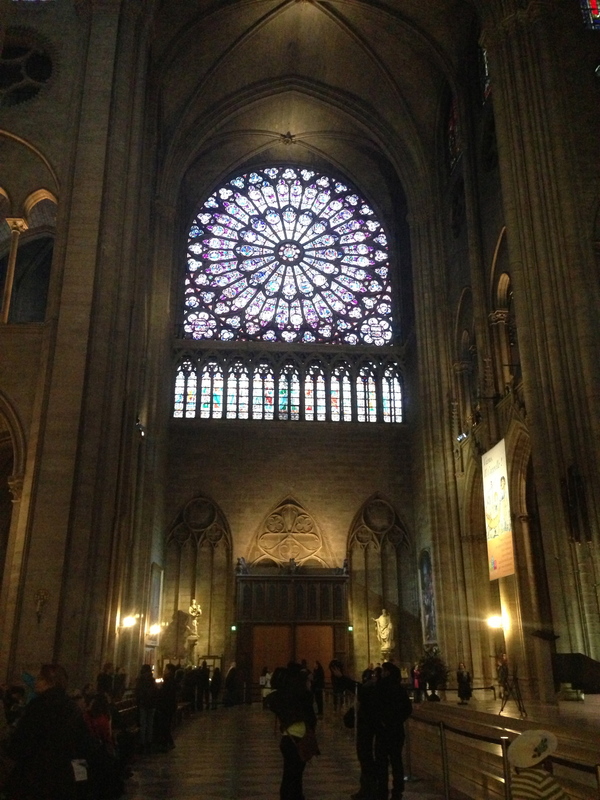 Notre-Dame was built between 1163-1345. It is on the Île de la Citè, an island in the Seine, in the 4th arrondissement of Paris. Entrance is free, they just asked that we remove our hats. 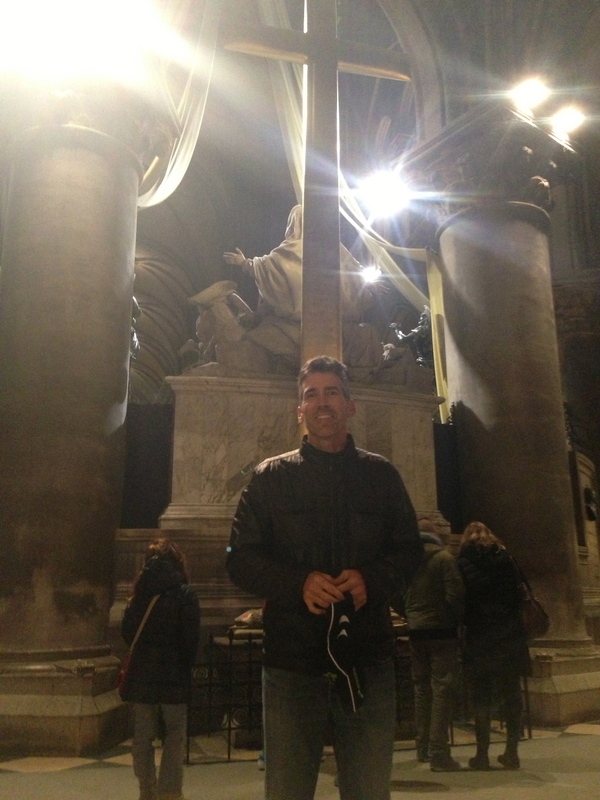 It is amazingly impressive to enter the cathedral. Above the entrance on the western side are 28 biblical kings (see photo below). In 1793 during the French Revolution they were mistakenly thought to be the kings of France. 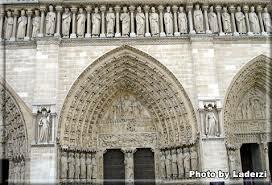 Story has it that the people stormed the cathedral shouting “off with their heads” and beheaded the 28 kings. Many of the heads were rediscovered in 1977 during an excavation and are now on display at the Musee de Cluny. At some point all of the heads were replaced with replicas. We were sure to check this out. So much history had passed through the doors that we walked through. 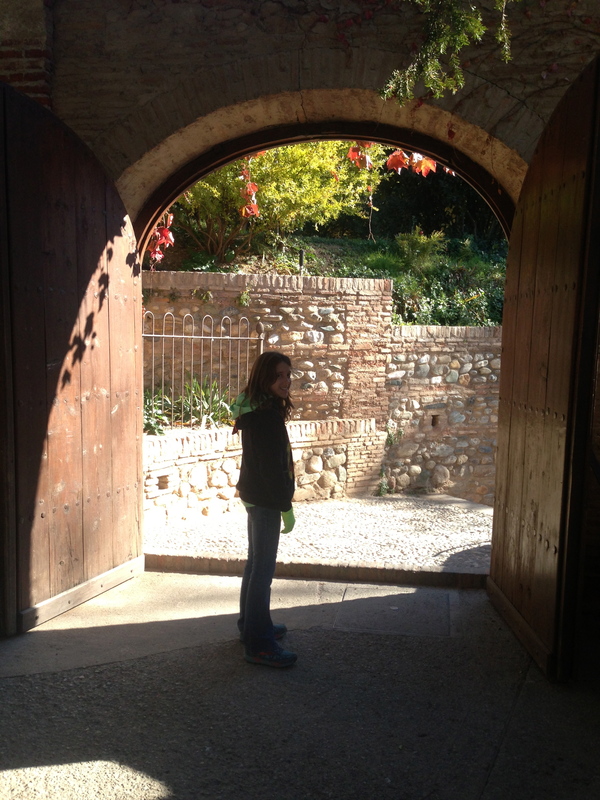 Despite the hundreds of visitors, it was very quiet. The light coming through the stained glass windows casted an ethereal glow. It was interesting to learn that the original windows had been destroyed by stray bullets during WW II. 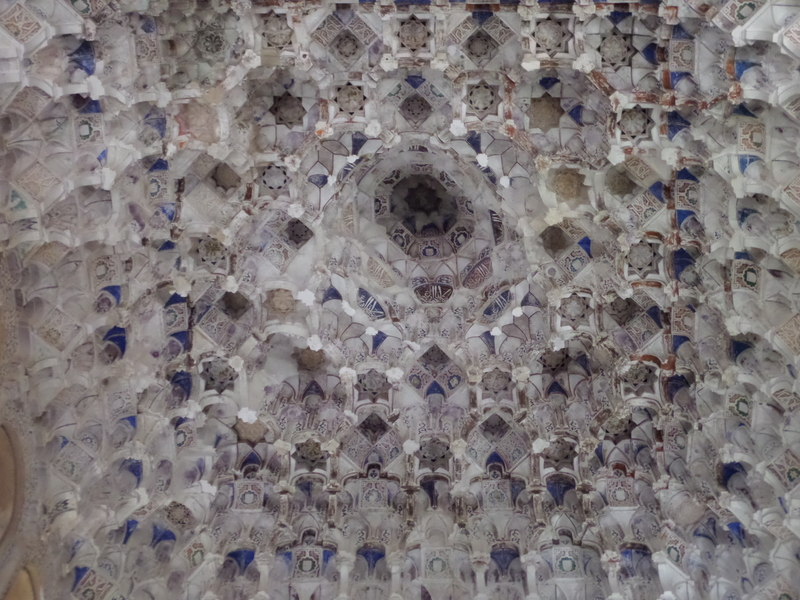 They were replaced with the modern geometrical patterns that we saw. Before WW II the windows were depictions of scenes from the Bible. Notre-Dame is famous for housing the “Crown of Thorns”. 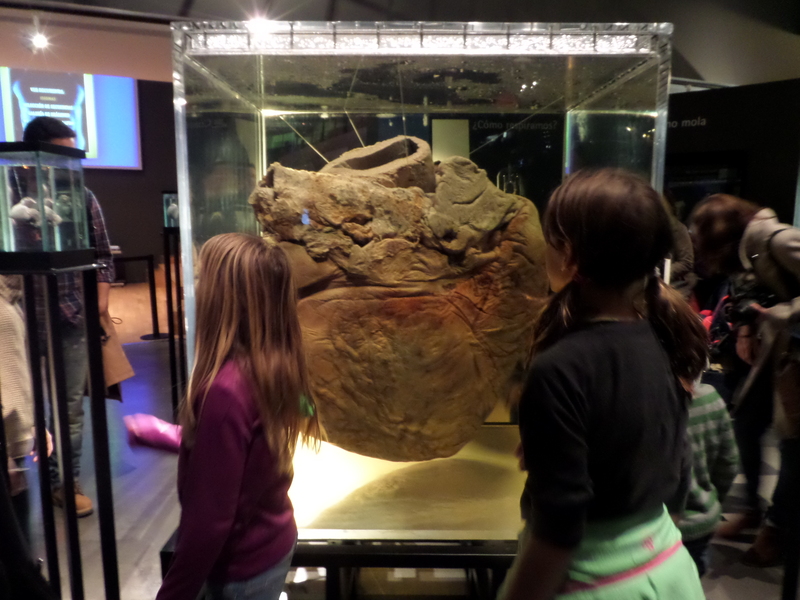 Unfortunately it is only on display the first Friday of each month and on certain holidays so we didn’t get to see it. 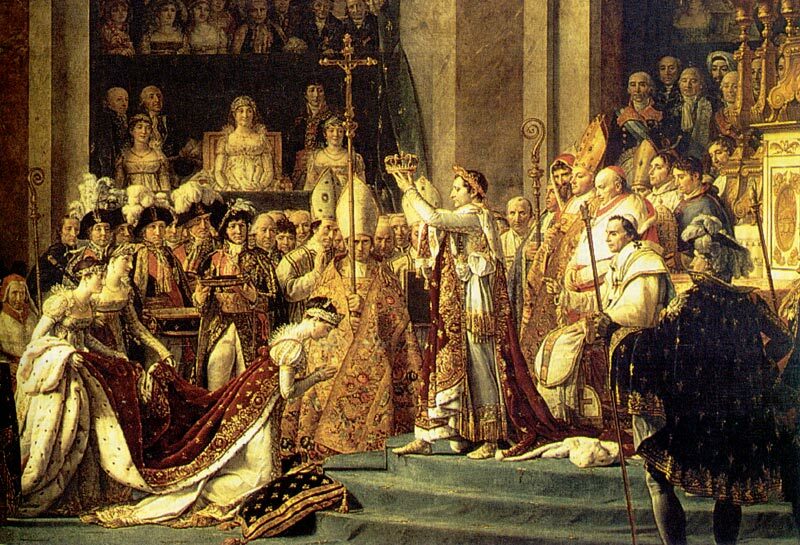 In 1804 Napoleon invited Pope Pius VII to come to Paris to crown him emperor in the Notre-Dame Cathedral. At the last minute, however, Napoleon seized the crown from the pope’s hands and crowned himself. There he is, Napoleon crowning himself! 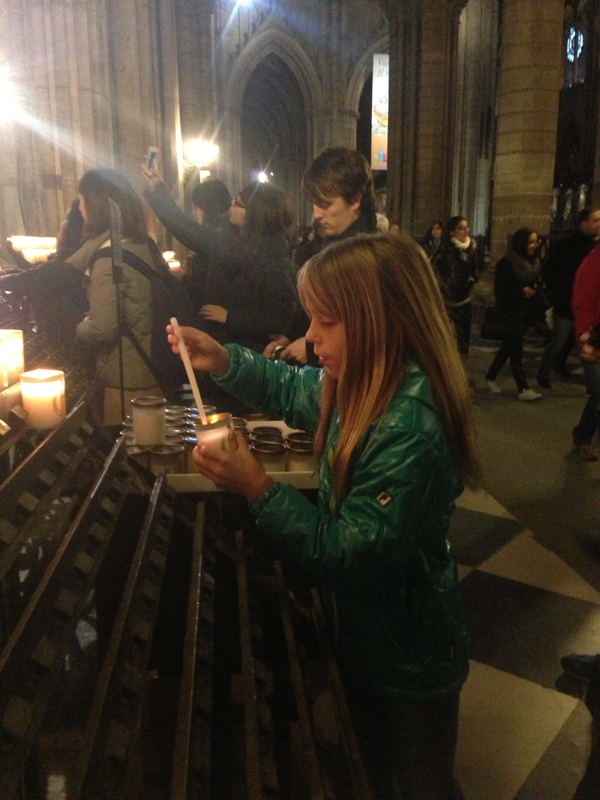 Throughout the walk through the cathedral there are candles that can be lit in honor of a loved one. We lit a candle for our friend Mark who has been sick. There was a very long line in the rain for the privilege to pay to climb the tower so we decided that it was time for a break. 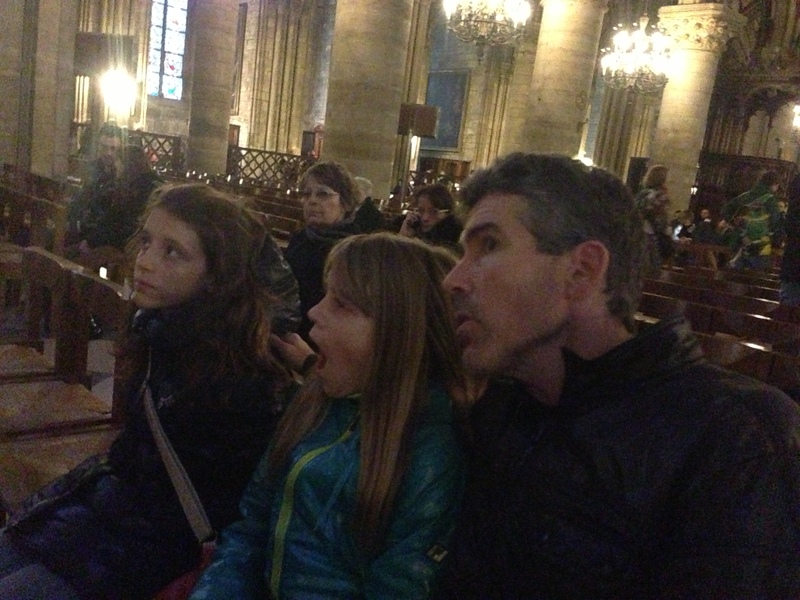 We had also planned to make it to Sainte-Chapelle, but alas, when traveling with little ones we had to remember that it is important not to torture the children for the sake of seeing all of the sights. 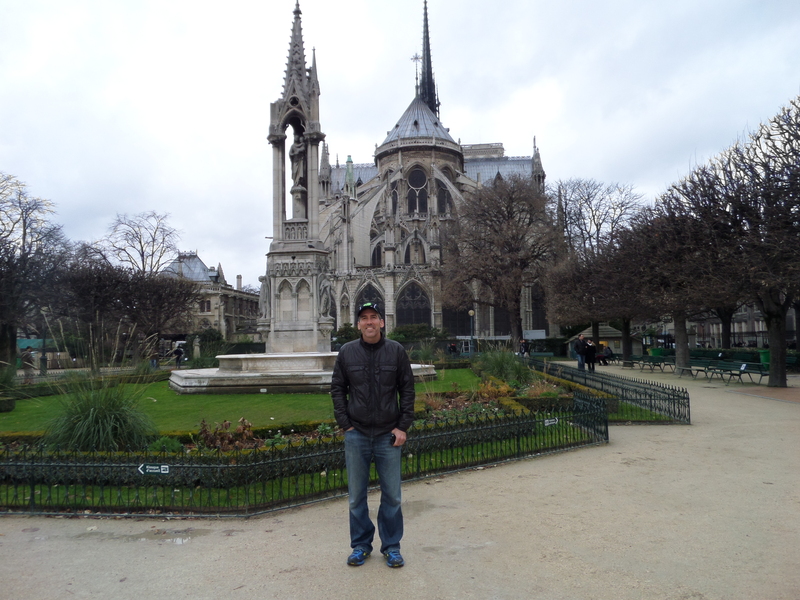 ***Cool tip***There is a really nice park that has free wifi behind Notre-Dame, (on the east side of the cathedral ). 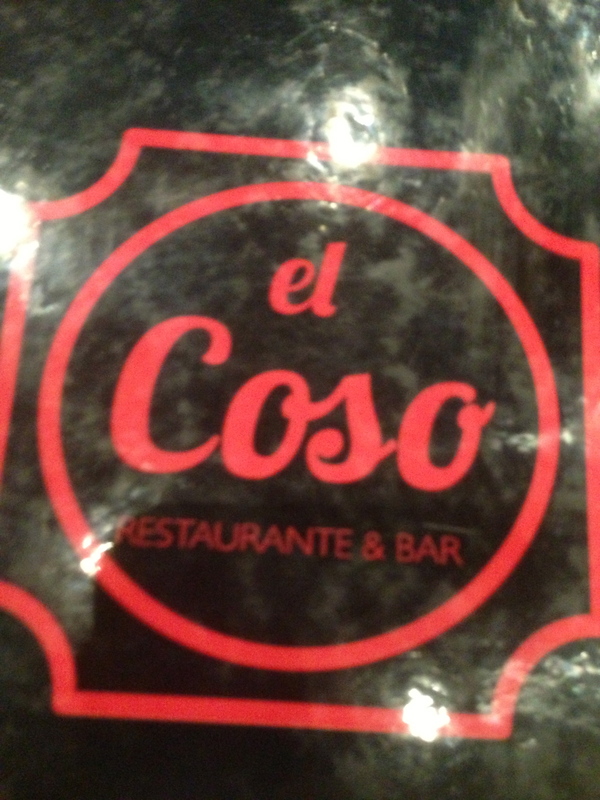 This was a great find for bored kids and parents in need of trip advisor’s advice for a good restaurant. 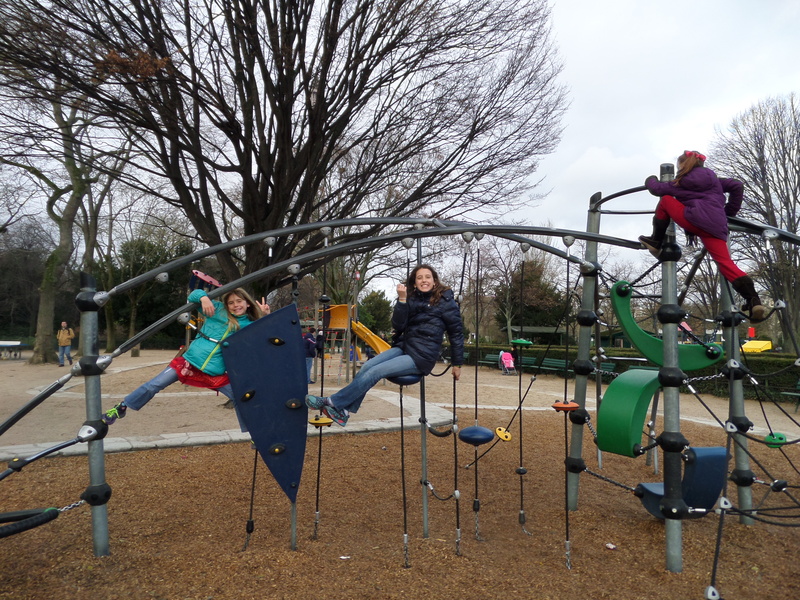 Sky and Savannah played with the French children while we sipped Vin Chaud (hot wine, very bad) and Chocolat Chaud (hot chocolate, very good). 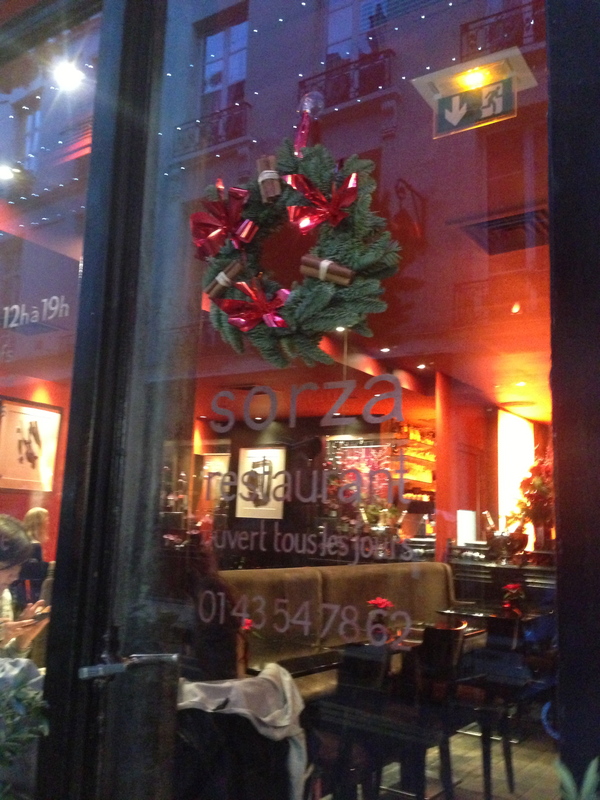 With the help of tripadvisor.com we found Sorza, a lovely little restaurant on Rue Saint-Louis on the Île de la Citè. 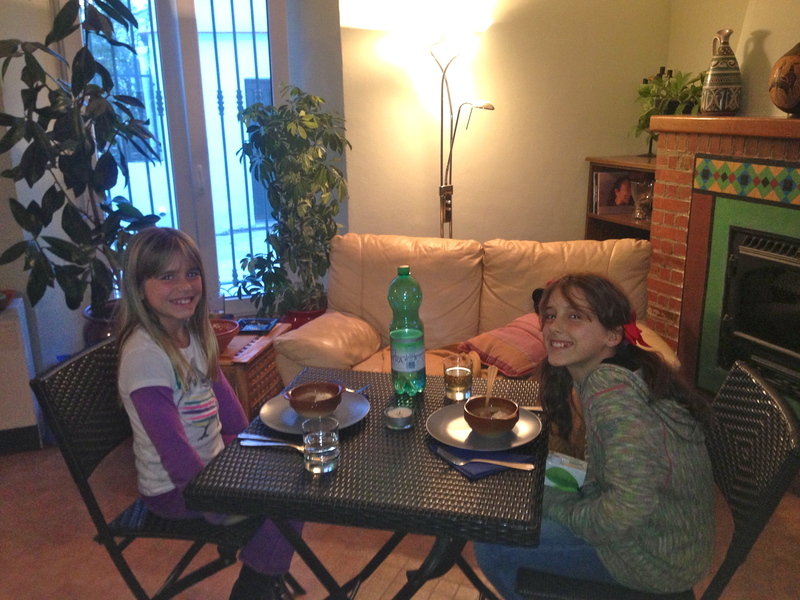 We all enjoyed a delicious meal. 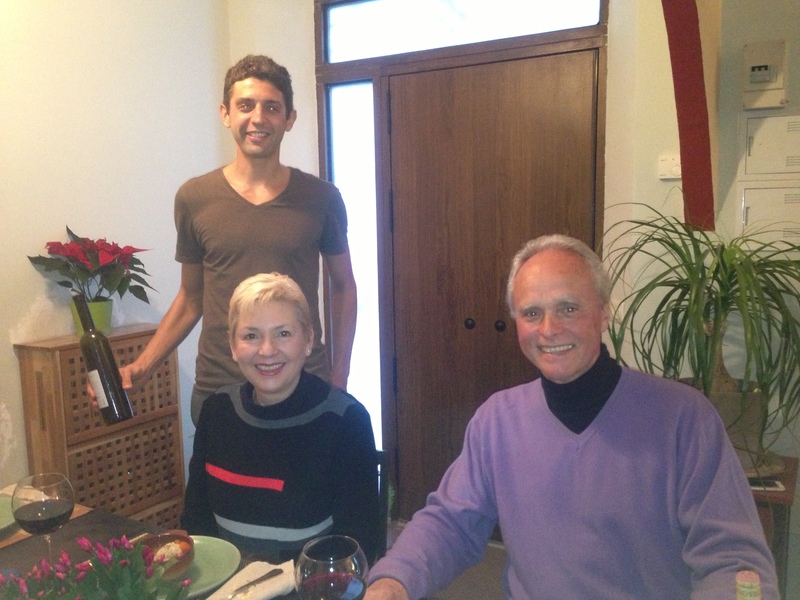 I had soufflé and French wine, what else for our first dinner in France? 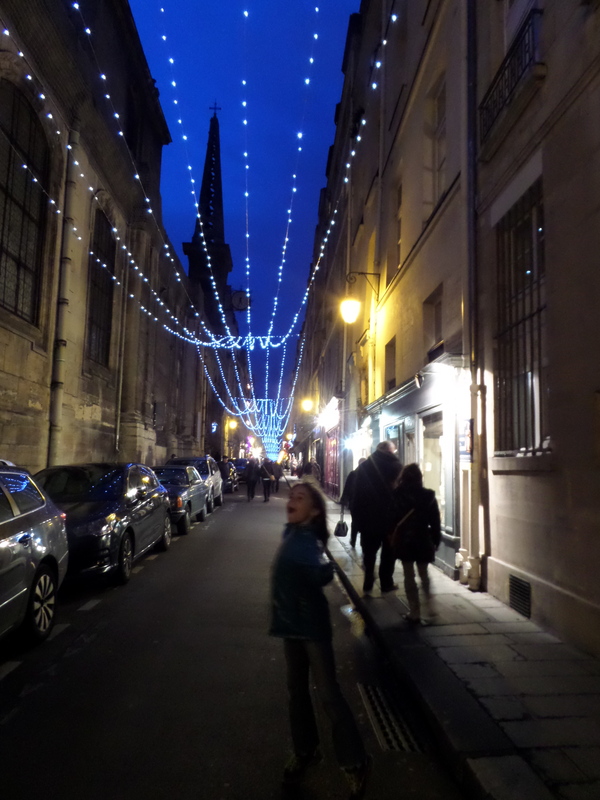 After dinner we walked down the lovely, and very fancy Rue Saint-Louis. 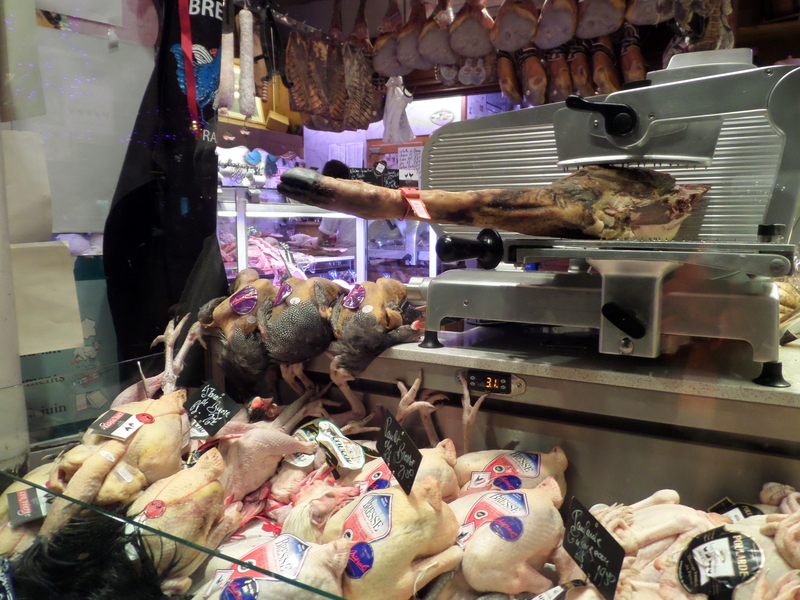 We browsed the shops and admired the simplest things that were unusually lovely and a sometimes a little scary in Paris. Do those chickens still have feathers on their wings? 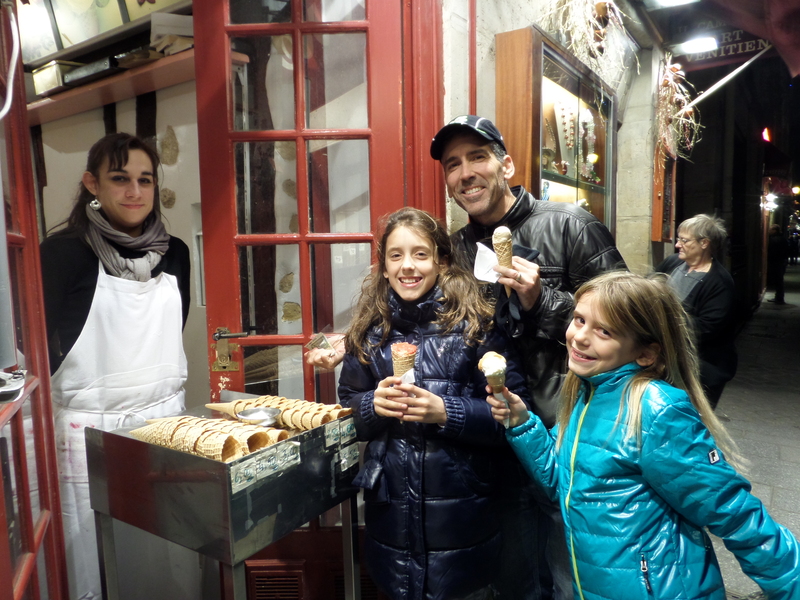 Mike and the girls enjoyed French ice cream despite the cold. 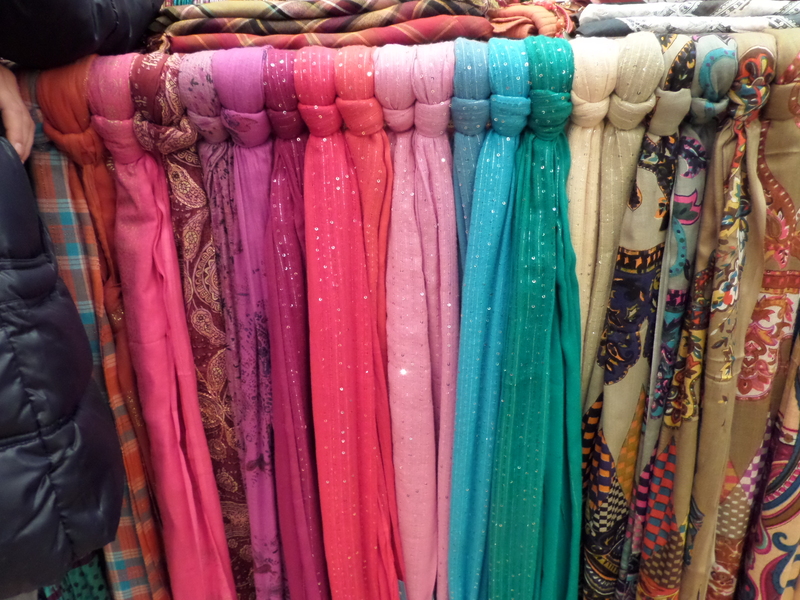 A rainbow of french scarves. The next day was Christmas Eve. 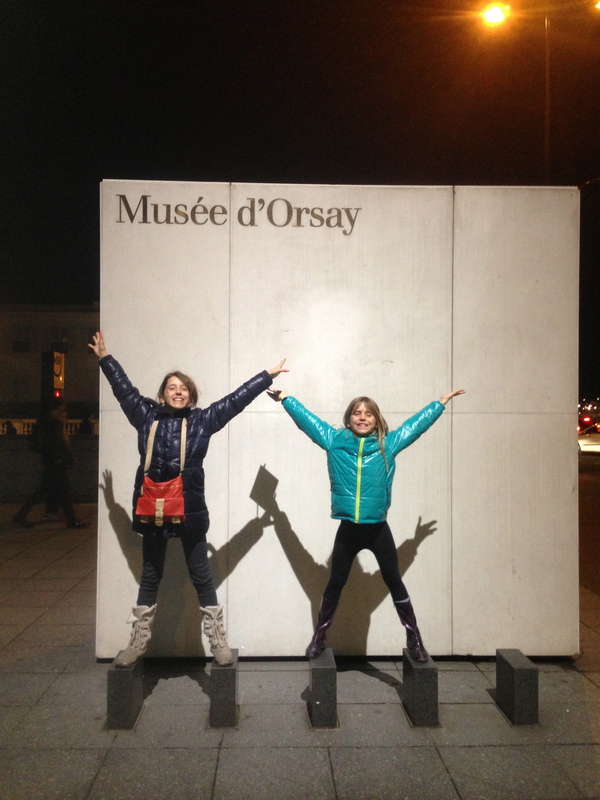 We wanted to visit the Musee d’Orsay and were thrilled to find that it was open. There is an RER stop right outside the museum but we were interested in exploring a bit on the way so we chose a metro stop on the other side of the river. It was raining and we were happy to see that lovely Monique had supplied us with umbrellas. 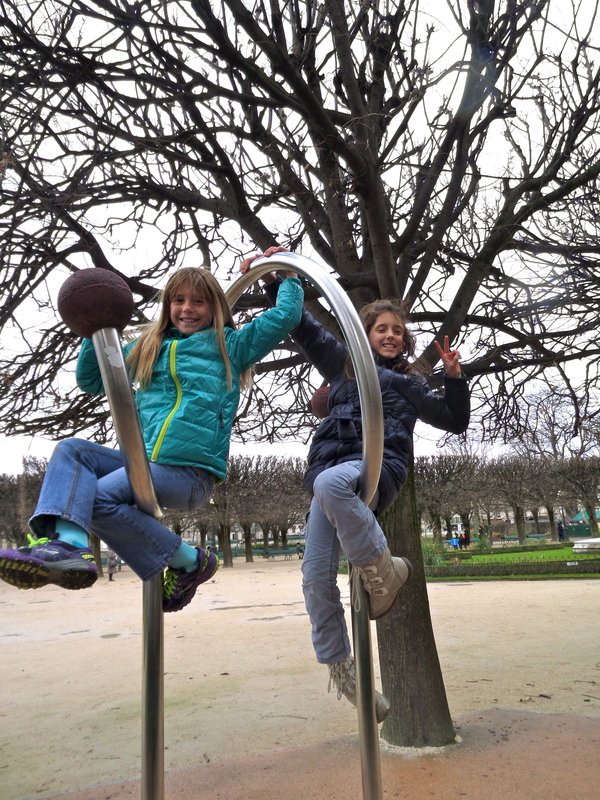 We climbed out of the metro at the edge of the Jardin des Tuileries. 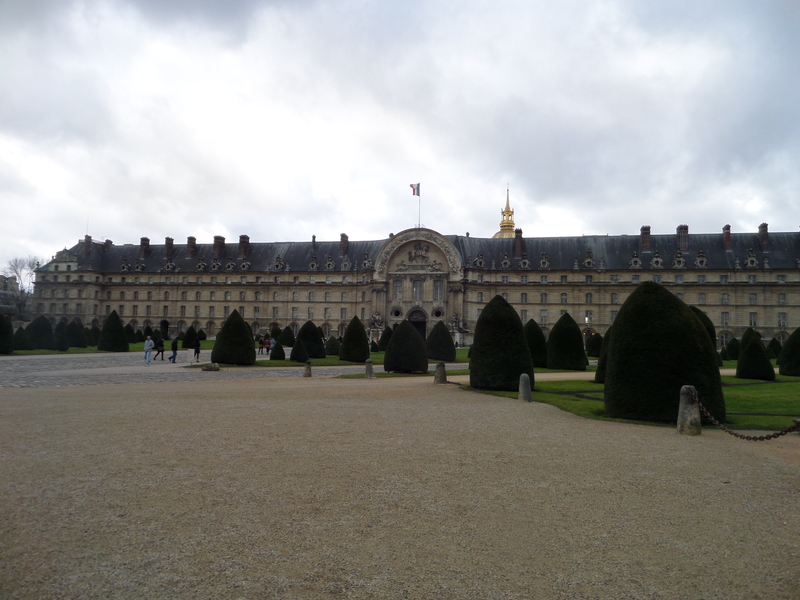 The Jardin des Tuileries was originally the vision of Queen Catherine de Medicis. 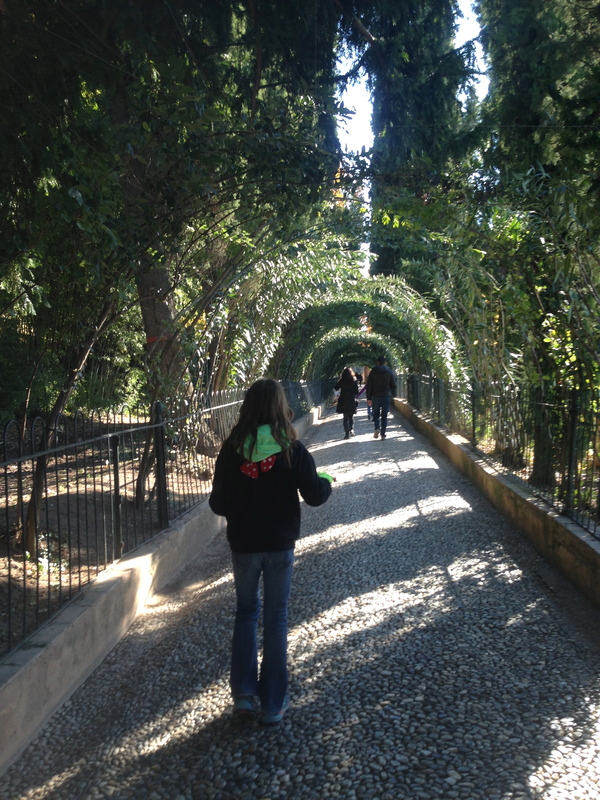 She modeled the gardens after those of her native Florence. 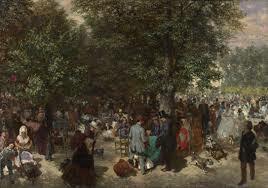 The area where the gardens were constructed was once occupied by workshops called tuileries where tiles for roofs and buildings were made, thus the name. There is much history in this beautiful place and although it was raining I could imagine that on a warm sunny day it must be packed with people, vendors and artists. 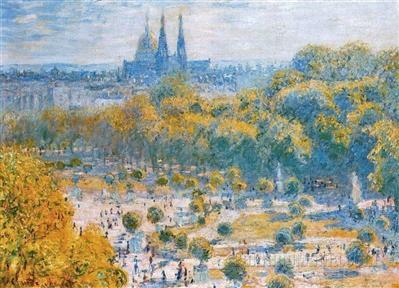 Monet, Renoir, Manet and so many artists have painted images of this famous garden. 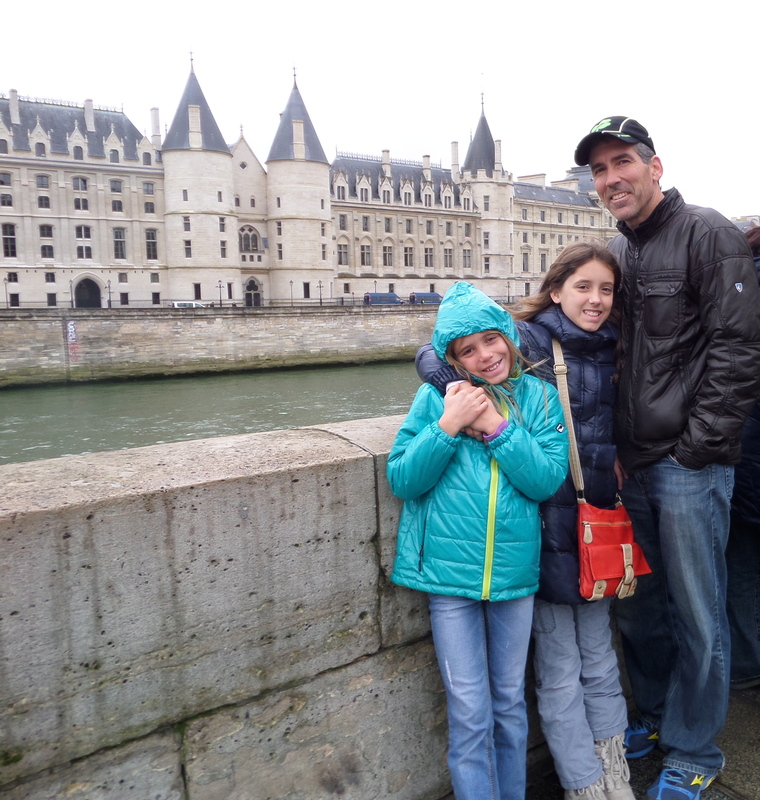 We had to cross the river Seine to get to the Musee d’Orsay and I had no idea what we were about to stumble upon on the bridge. We crossed under the street to the pedestrian bridge through a tunnel. 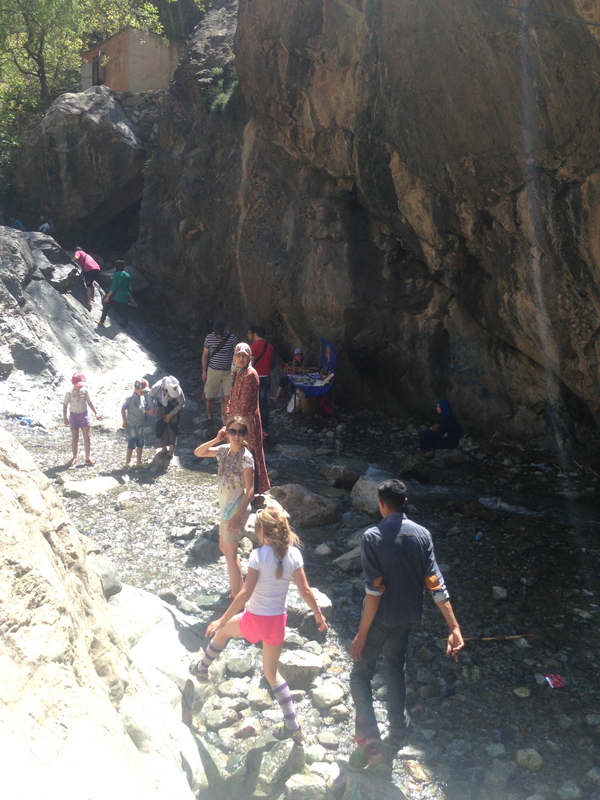 We could see a couple sitting on the stairs in the shelter of the tunnel near the bridge. They were sitting apart from each other writing on locks. We were about to cross the famous love-lock bridge. Paris, the most romantic city in the world, has 2 bridges where couples write their names on a lock, lock it to the bridge, then throw the key in the River Siene. This locks their relationship and unless one can find the key at the bottom of the river they will be in love forever. One must be very careful which bridge you put your lock on because Pont des Arts is for your committed love, while Pont de l’Archevêché is for your lover. We were crossing Pont des Arts. I glanced over the man’s shoulder as we walked by. He was writing “Will you marry me?” on his lock! How romantic! We glanced back a couple of times but didn’t want to intrude. 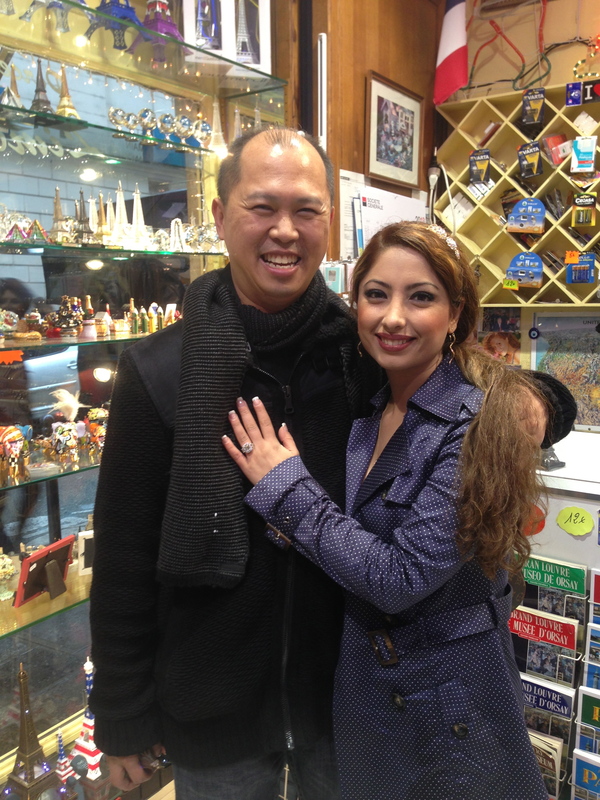 As it turned out we ran into the same couple in a gift shop later. I recognized them and couldn’t resist getting the story. It turns out that they are from Las Vegas. 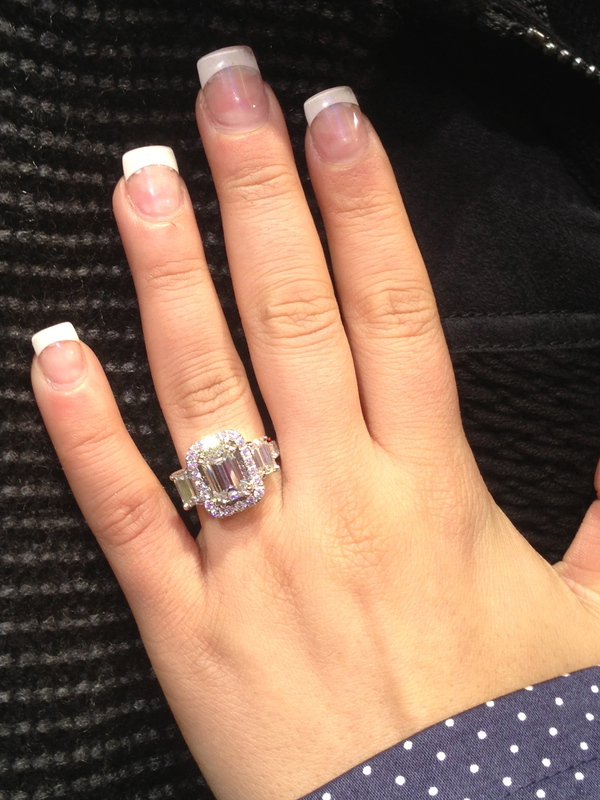 He proposed and, of course, she accepted. 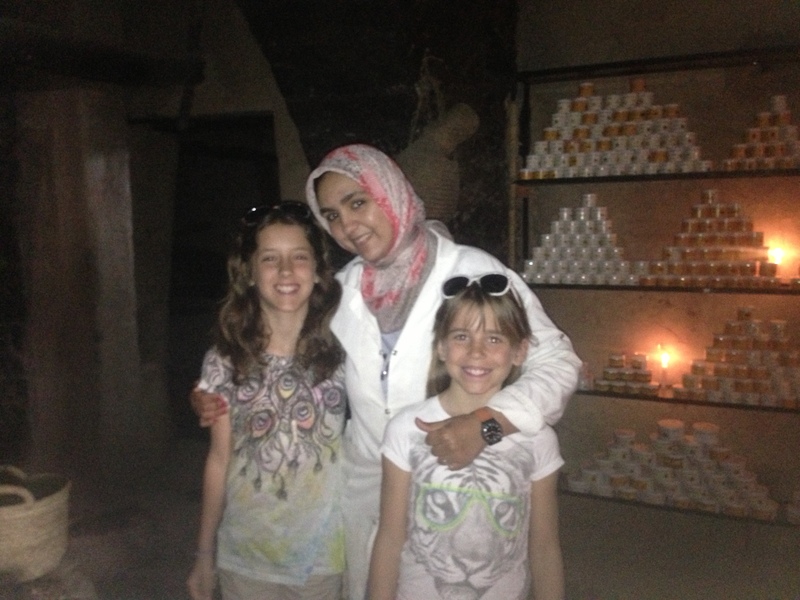 They were happy to tell their story, pose for pictures and accept hugs from Team Kezmoh. 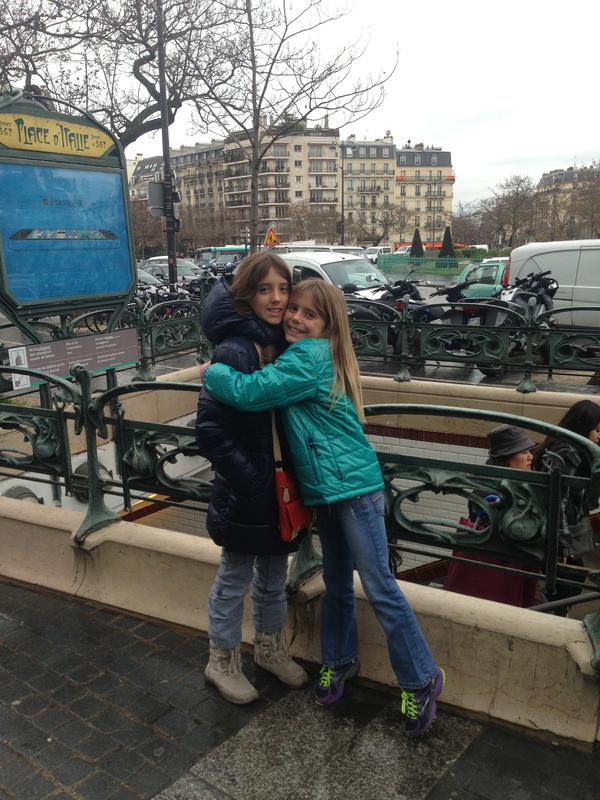 We never did get to the Musee D’Orsay that day, the line in the rain was too long. 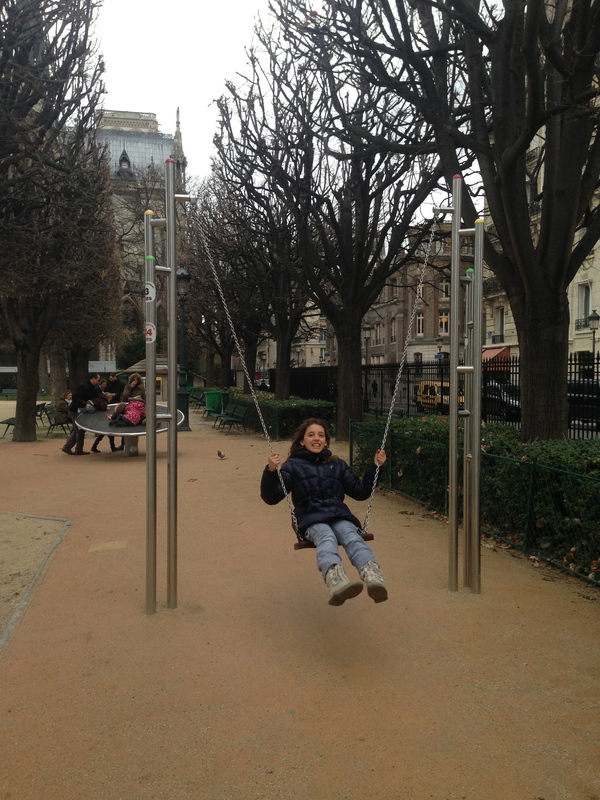 We found that even in the rain exploring the side streets of Paris can be fun. 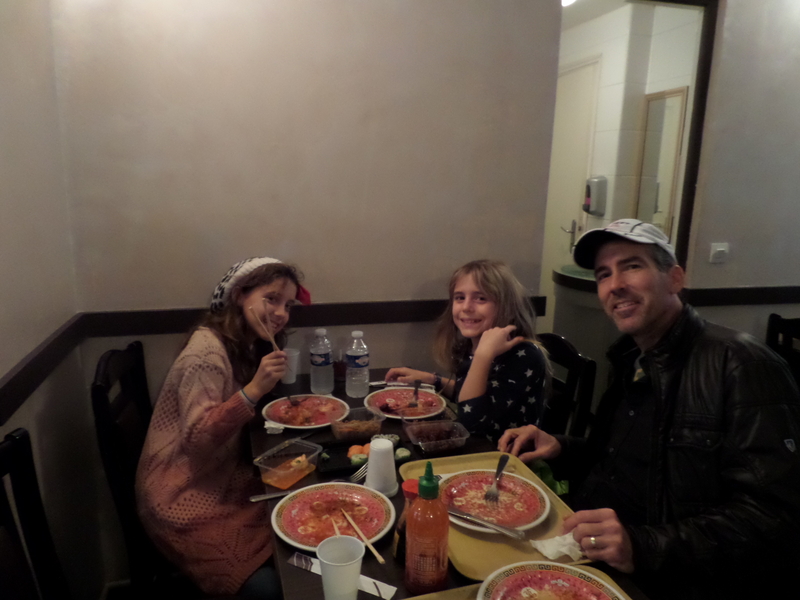 It was Christmas Eve so we ate Chinese food for dinner. 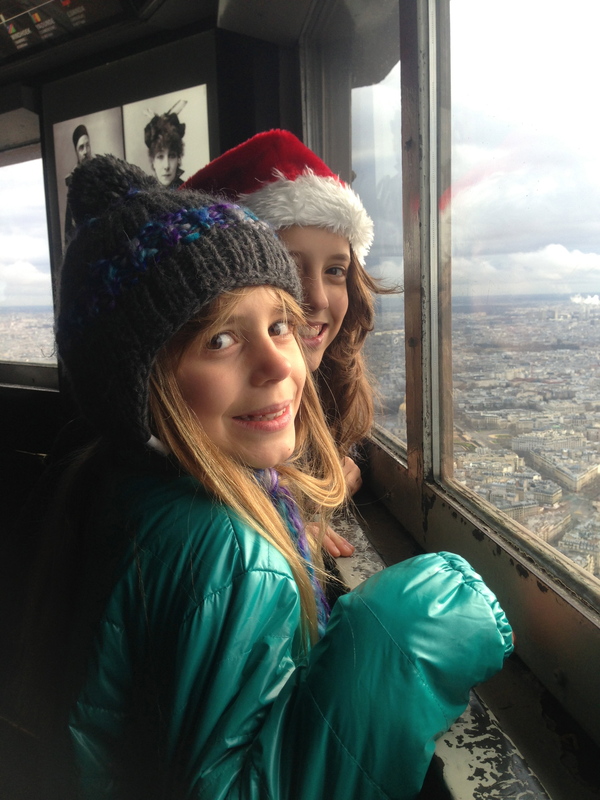 Christmas morning we awoke to sunshine and knew that this was the day get to the Eiffel Tower! 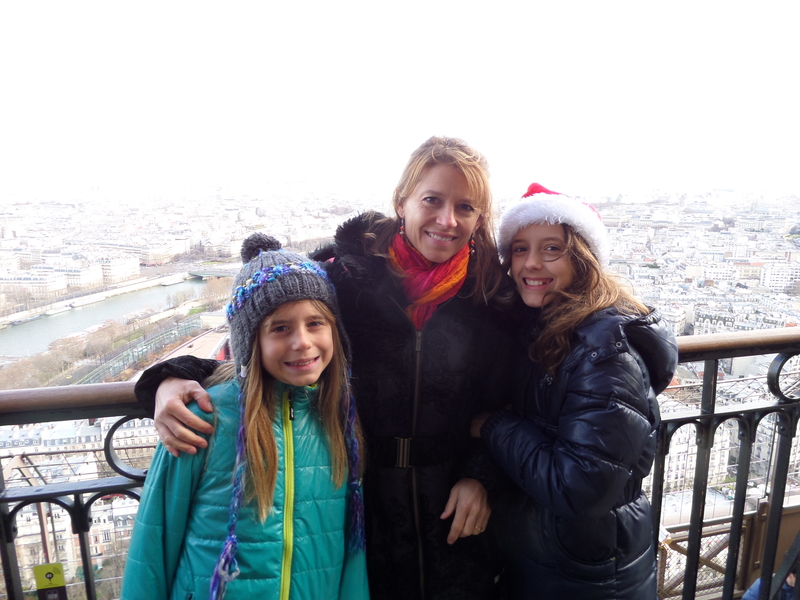 Sunshine on Christmas morning in Paris! 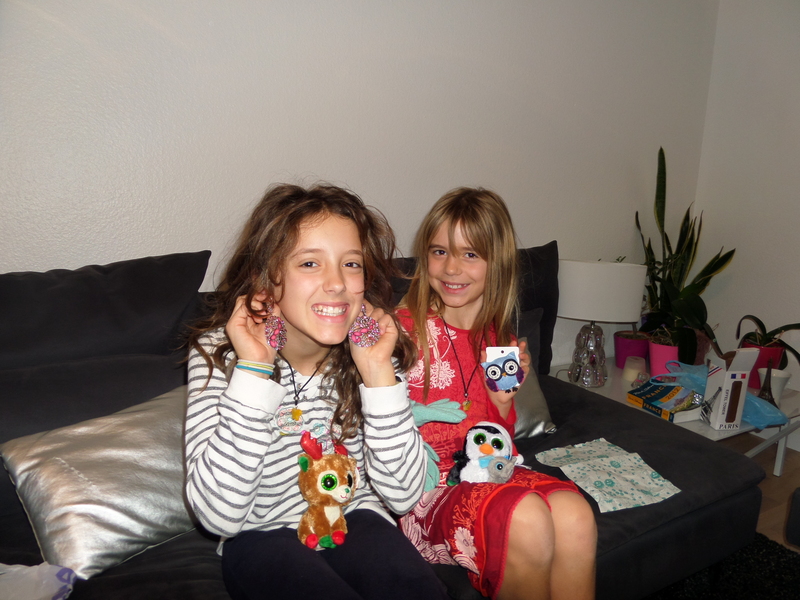 We opened presents that Santa brought in the night, had croissants for breakfast and got on the metro before most people were awake. 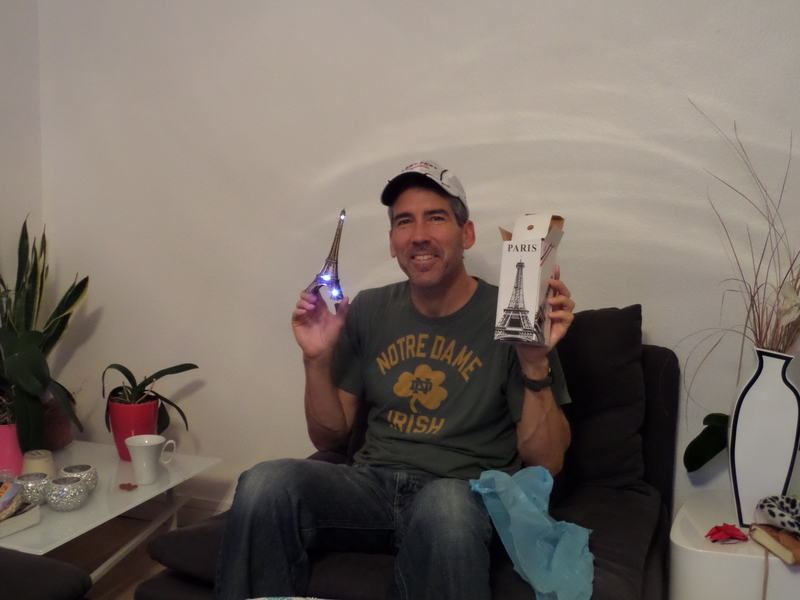 Santa brought Mike a little Eiffel Tower! ***cool tip*** There is an Eiffel Tower app that can be downloaded. 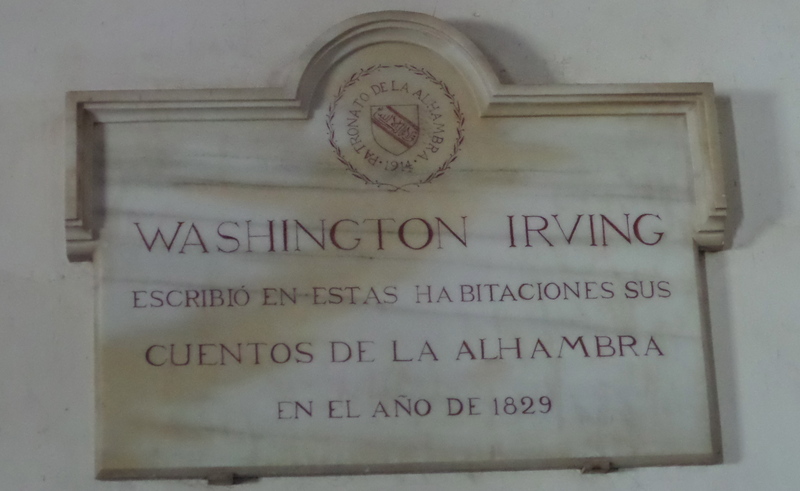 It gives a nice history and tour that can be listened to before or during your visit. The Eiffel Tower was named after engineer, Gustave Eiffel, who also designed the Statue of Liberty. It opened to the public in 1889. It was the entrance arch to the 1889 World’s Fair. At the time it was the tallest human-made structure in the world. It held the title until 1930 when the Chrysler Building was built. The tower in person is much more impressive than I imagined. It is as high as an 81 story building. View of the tower outside of the metro stop. 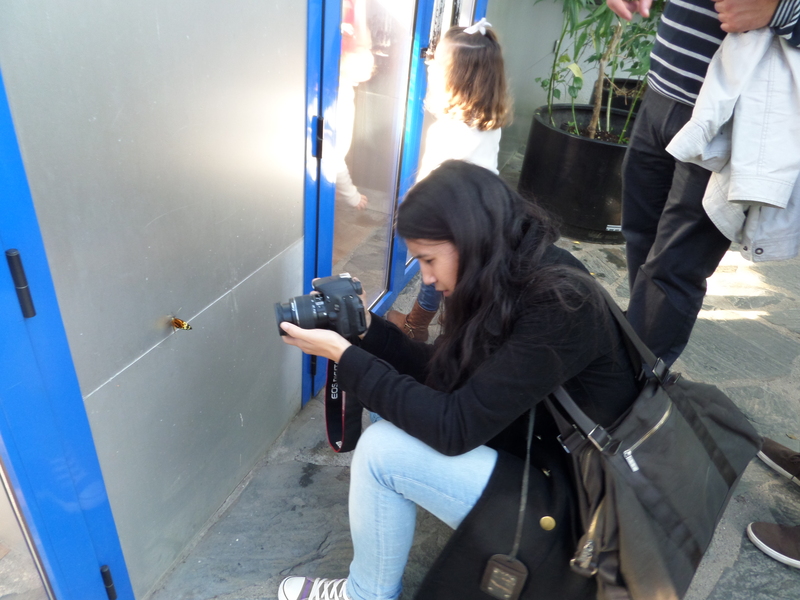 Everyone takes lots of pictures! Of course we wanted to climb to the top, no elevators for Team Kezmoh! There are 3 observation levels. One can take an elevator to each level or it is possible to climb the stairs from the ground to the second. From the second observation deck it is necessary to take an elevator. When we arrived the line for the elevator from the ground wound around like an amusement park line but the ticket office for the stairs was wide open! We bought our tickets and started climbing! 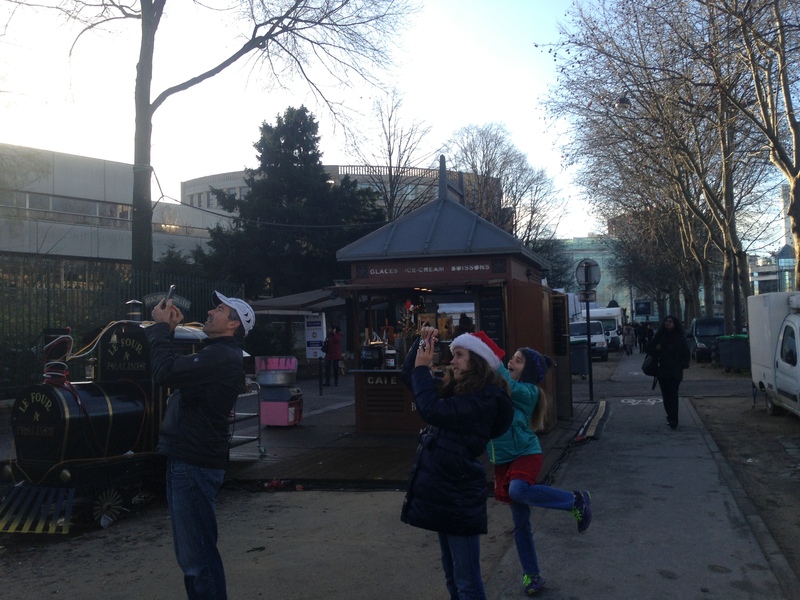 We took pictures from each level and just enjoyed being together on a sunny Christmas day in Paris. 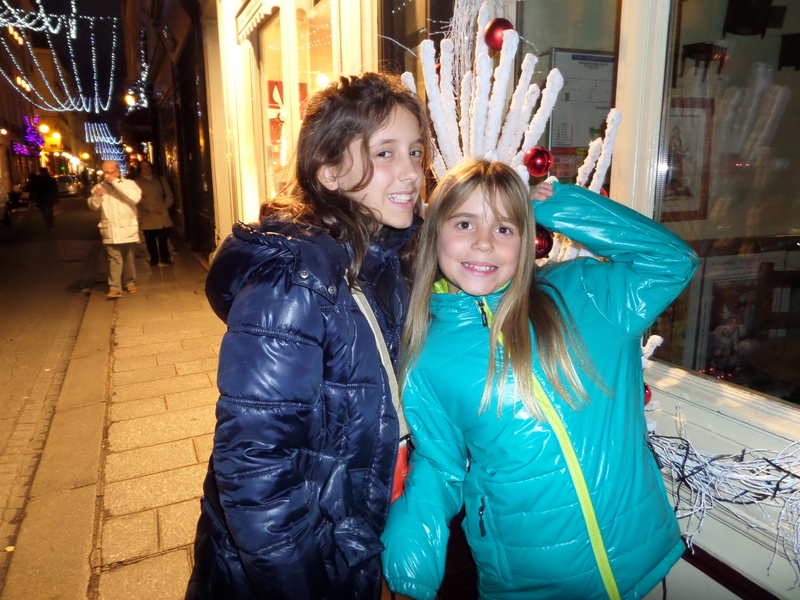 Level 2: The first candy canes we have found in Europe! Laura and Max, Americans traveling in Paris. They let us borrow their sign! Level 3, thankfully fully enclosed. It would be pretty cold up here! 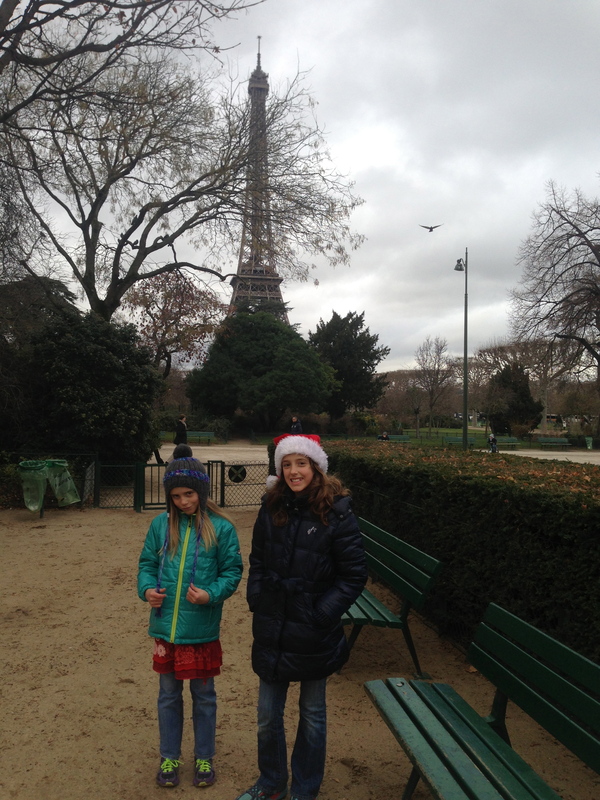 From the Eiffel Tower we found a park and ate crepes while we admired the tower. 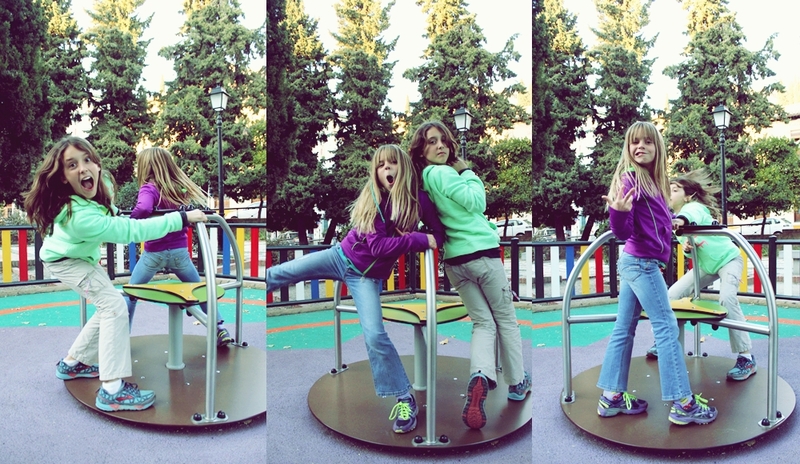 We always find a park! One thing that impressed us was that around any corner you might find an enormous building with cannons out front and friendly guards. 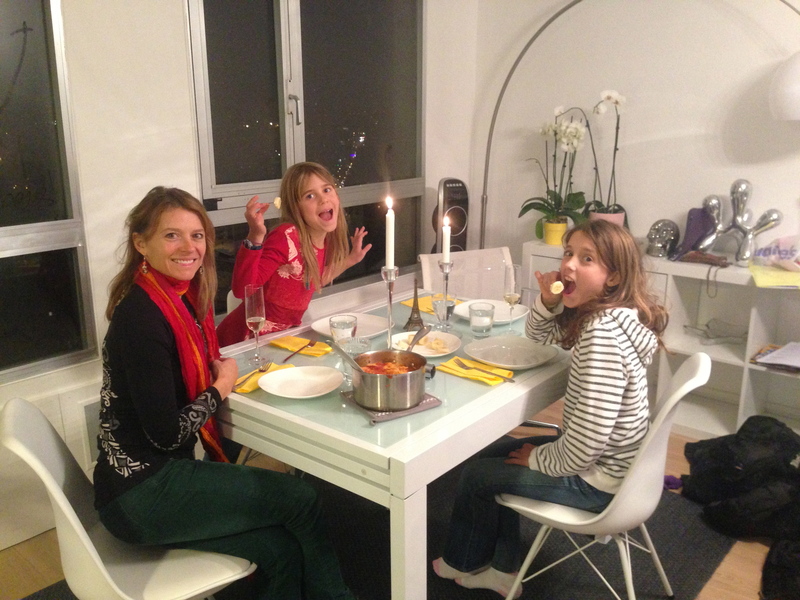 After a full day of exploring we had a lovely dinner back home in our cool Paris apartment. December 26, first order of business: buy a Paris Museum Pass. If you plan to visit any museums in Paris I highly recommend the Paris museum pass. It will save you literally hours of waiting in lines. It can be purchased at parismuseumpass.com before you leave home so that you don’t have to wait in a line for it when you arrive in Paris. If you didn’t do this, like us, it can also be purchased at several places in Paris. They are listed on the website. What makes the pass so cool is that it is a “fast pass”. The lines for the museums, as we learned on Christmas Eve, are daunting. Hundreds of people wait in serpentine lines in the rain for entry to see these famous landmarks. With the Paris museum pass we just walked to the front, showed our pass and were admitted without a wait. 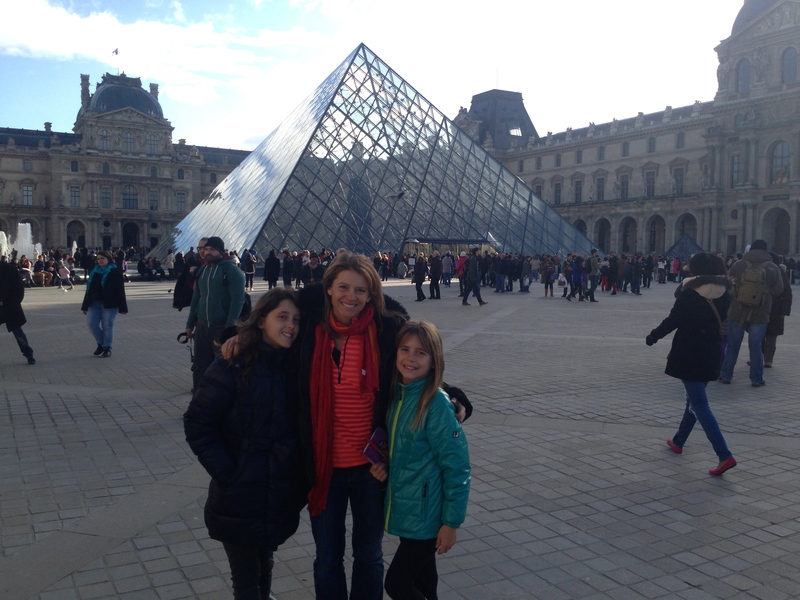 On to the Louvre! 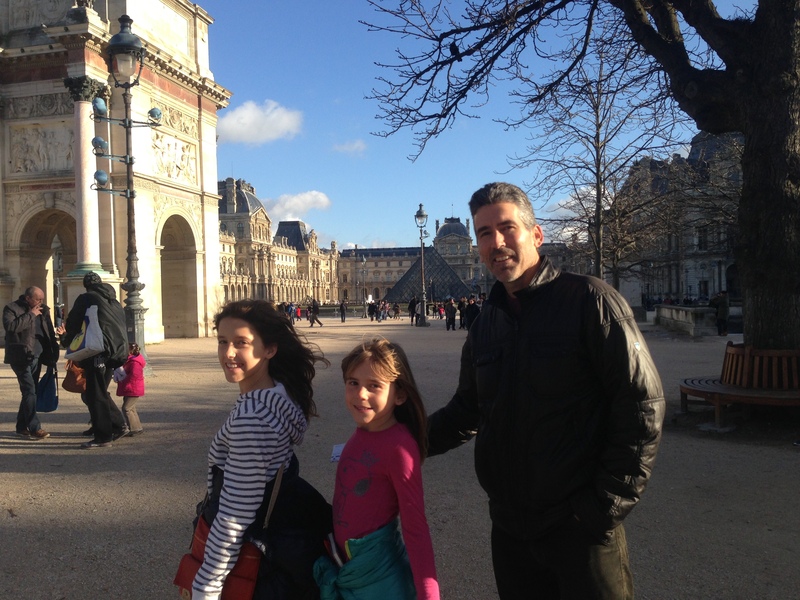 Doesn’t everyone who visits Paris have this picture in front of the Louvre? 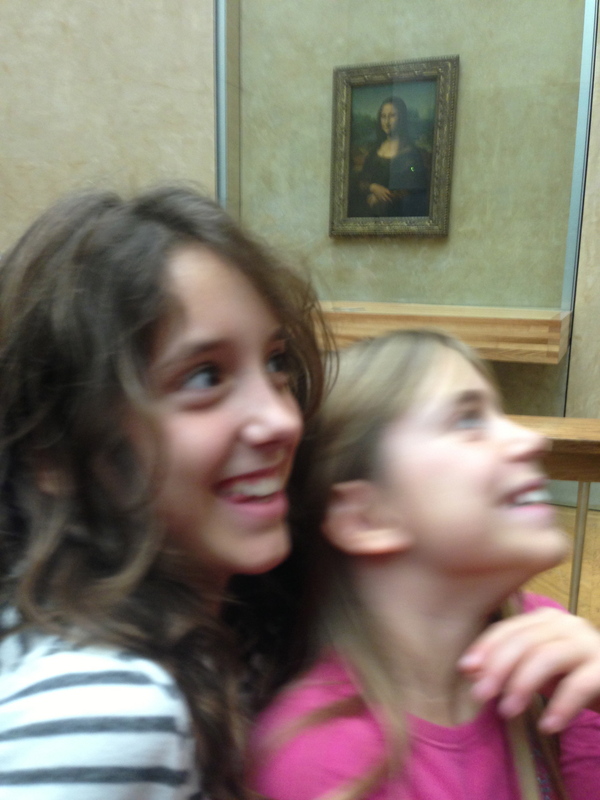 One thing that is cool about the Louvre is that they allow cameras. It is overwhelmingly huge so I asked family and friends if there was anything that one should not miss. Everyone says the Mona Lisa. Is that because the Mona Lisa is amazing or unlike anything you have ever seen? I think not, it is because everyone wants you to experience the chaos in the room in which Mona lives. This is not a space for the claustrophobic or for anyone who likes to enjoy their art with quiet contemplation. 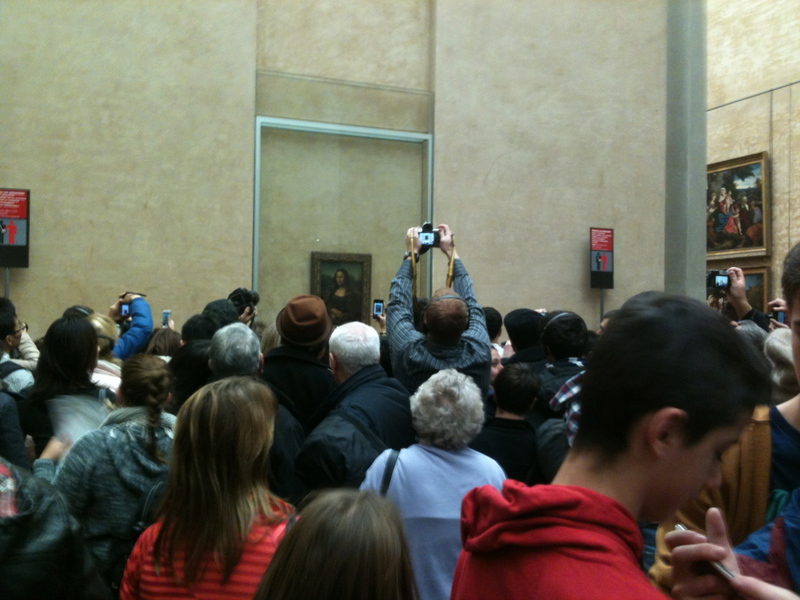 Mona’s room is wall to wall tourists, cameras snapping and people pushing their way to the front. 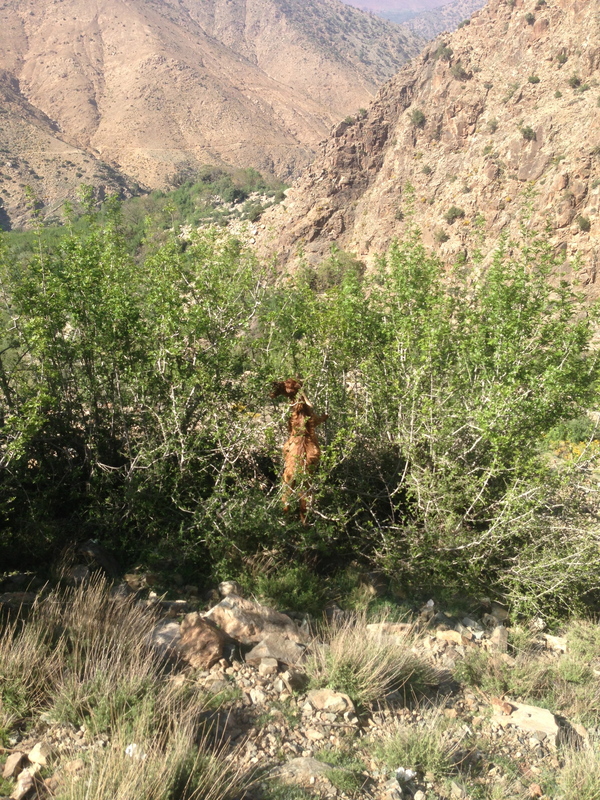 Guess what we did when we found her? Mike would have probably turned on his heel and left in a second, but Sky, Savannah and I were on a mission. 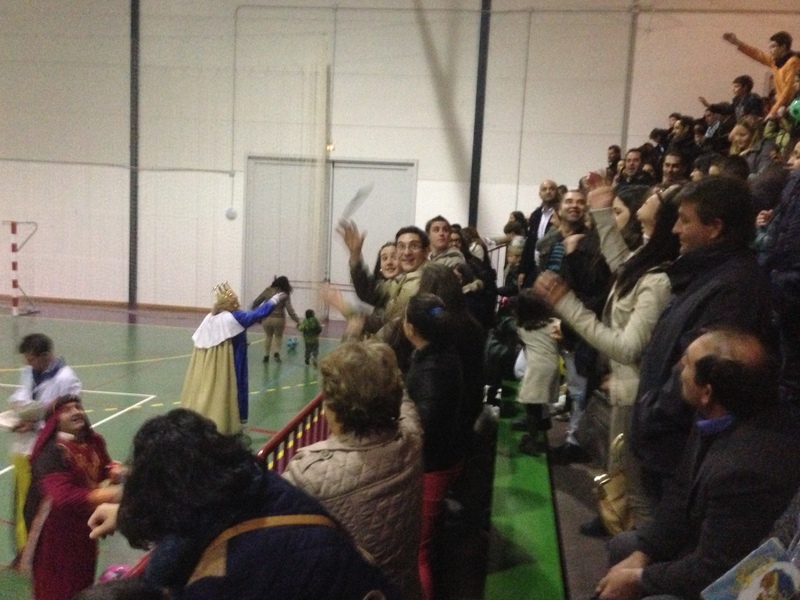 We dove into the crowd, cameras at the ready! Yep that is Mona, all alone on her own wall! Hard to get a good picture. Here are Sky and Savannah admiring her ladyship. We actually only visited one wing of the Louvre. One could plan a week to explore the whole place. On the way to pay homage to Da Vinci’s Mona Lisa we passed a mind-blowing number of religious paintings. 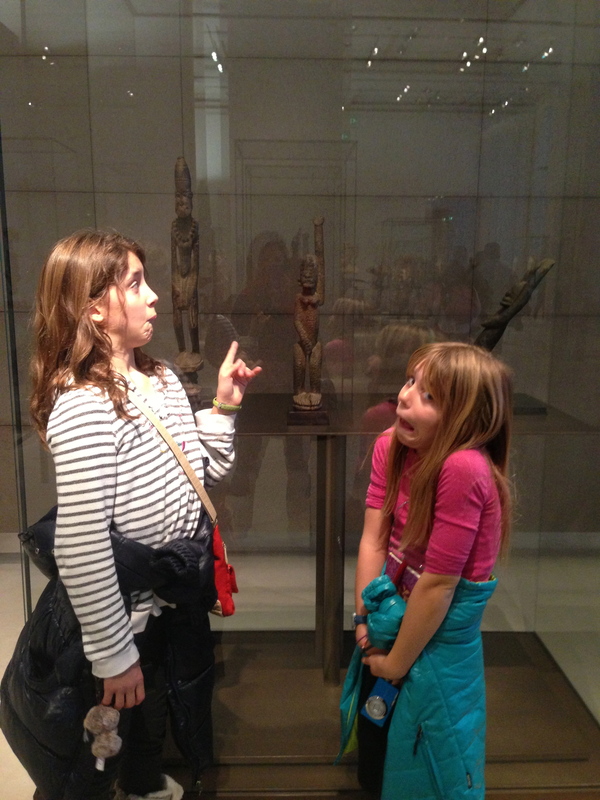 The girls enjoyed the Latin American and African Art. Reminds me of my brother Russell’s rabbits. Is this the weirdest sculpture of a breast feeding woman that you have ever seen? 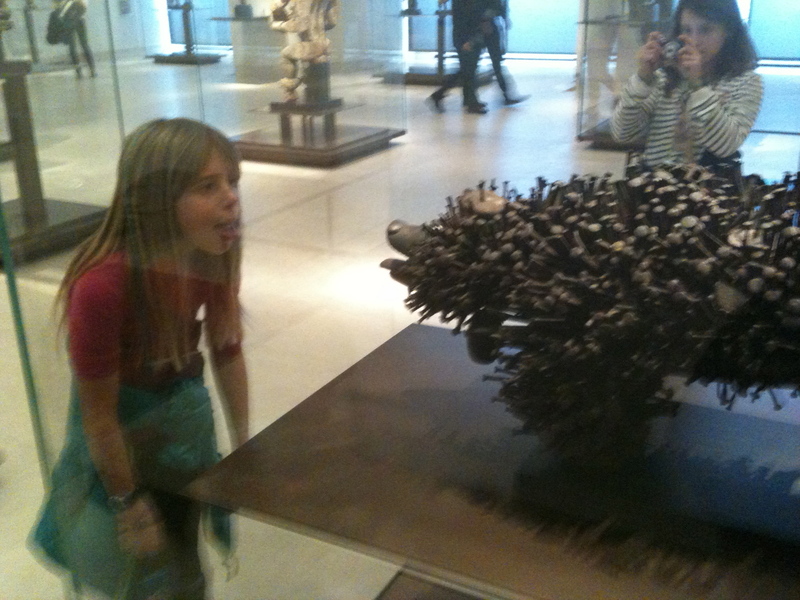 Remember the movie, “The Night at the Museum”? 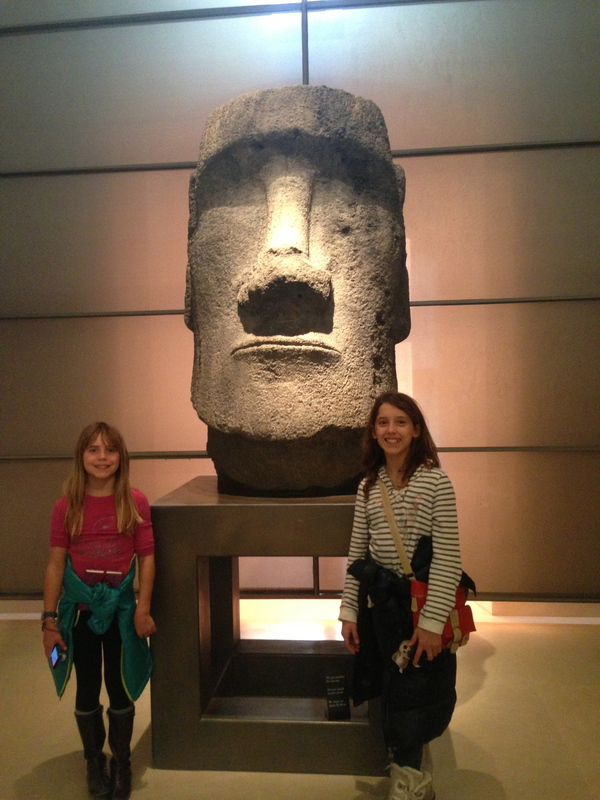 Dum Dum actually lives in the Louvre! Lunch, then next stop: Musée D’Orsay. Good to escape a museum for some fresh French air. 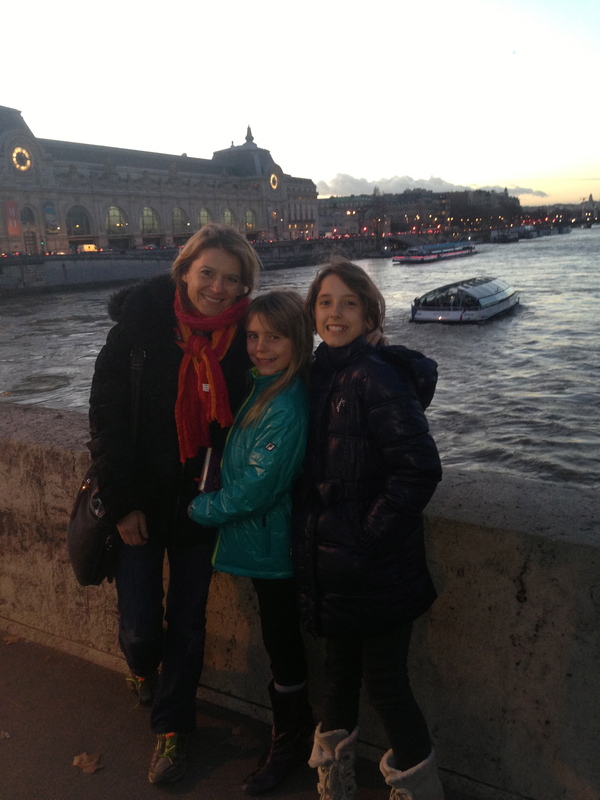 Crossing the Seine, the Musée D’Orsay in the background. My advice: unless you like really big crowds and you don’t mind admitting that you skipped the Louvre when people ask you about your trip, skip the Louvre and just go to the Musee D’Orsay. 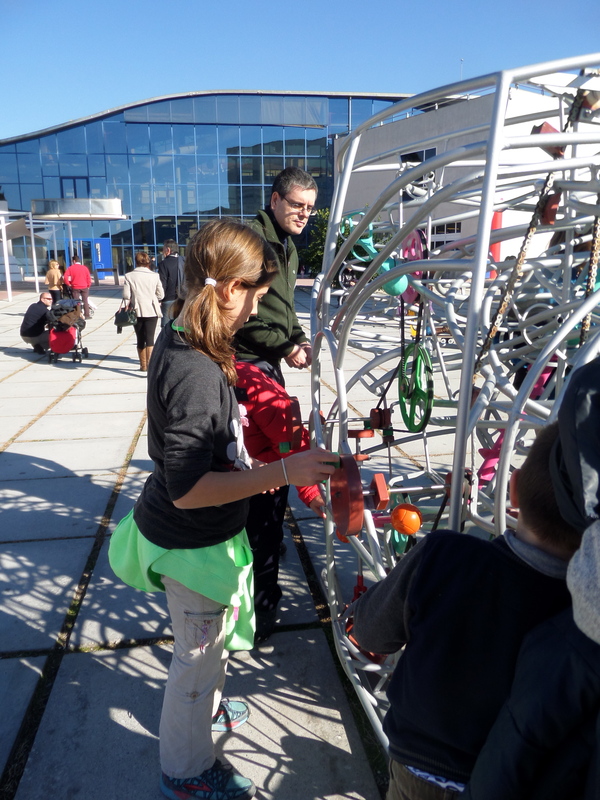 It is every bit as impressive, the crowds were more manageable and the art is really more agreeable. 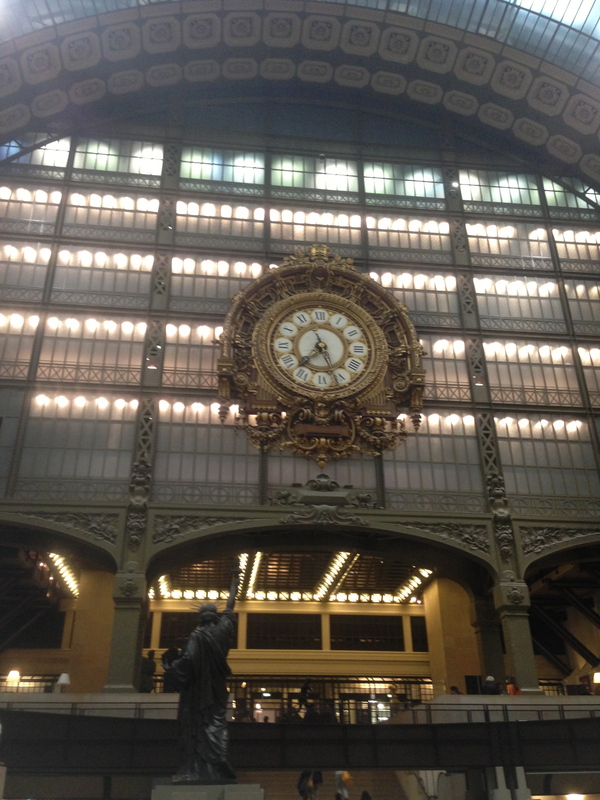 The Musee D’Orsay is housed in a grand railway station built in 1900. It had been completely abandoned in 1961. In 1978 it was saved from demolition by the French president, Pompidou. 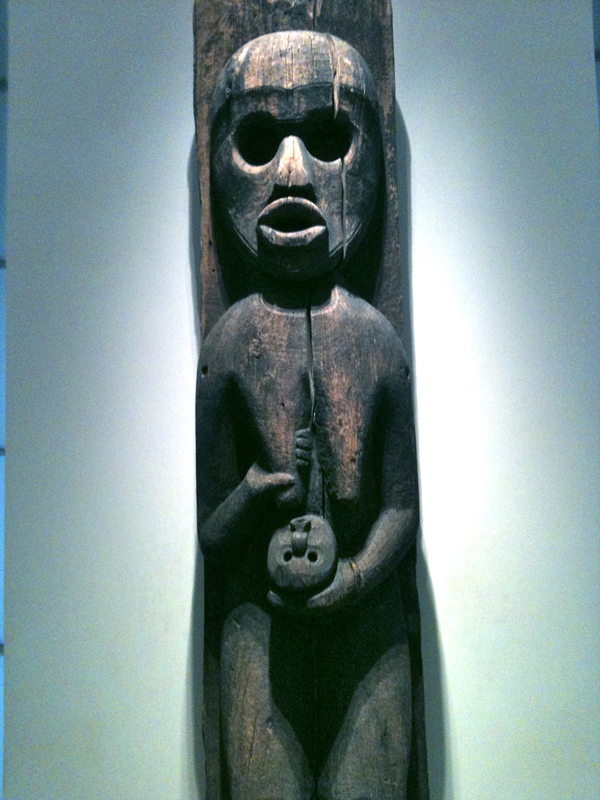 It is the museum of 19th and 20th century art while the Louvre houses much older pieces. 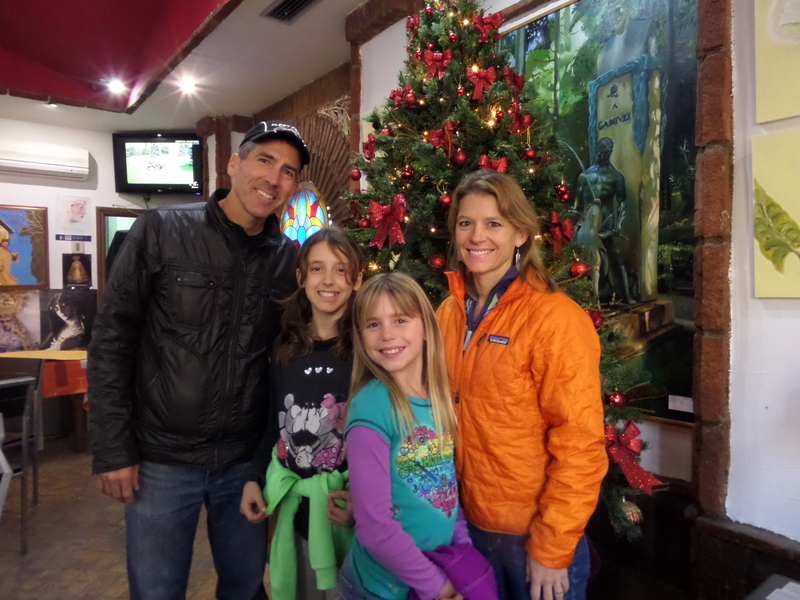 We love the impressionists and it was a huge hit for the entire family. Sadly no pictures allowed inside. 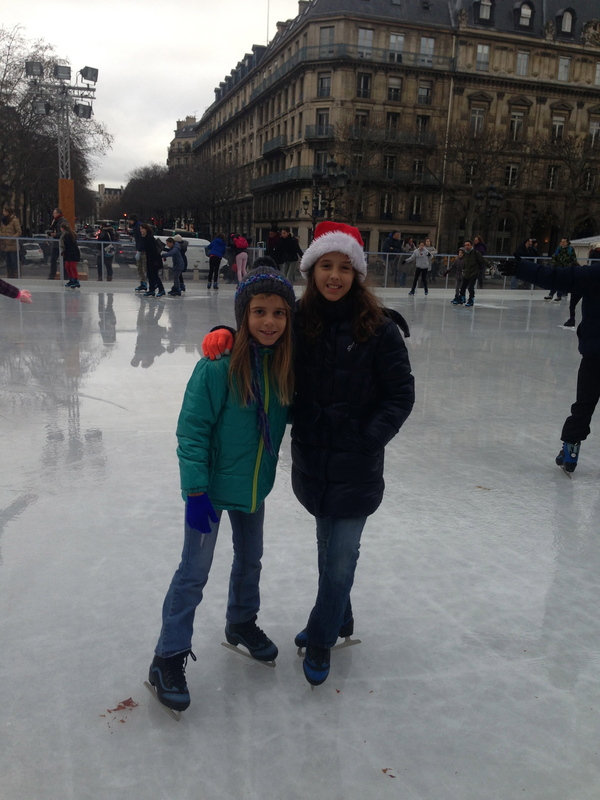 Dec 27 Wow, 2 museums in one day left us really tired, but Sky and Savannah had their hearts set on some ice skating in front of the Hotel De Ville. The Hotel de Ville is not actually a hotel, it is city hall, an impressive city hall! 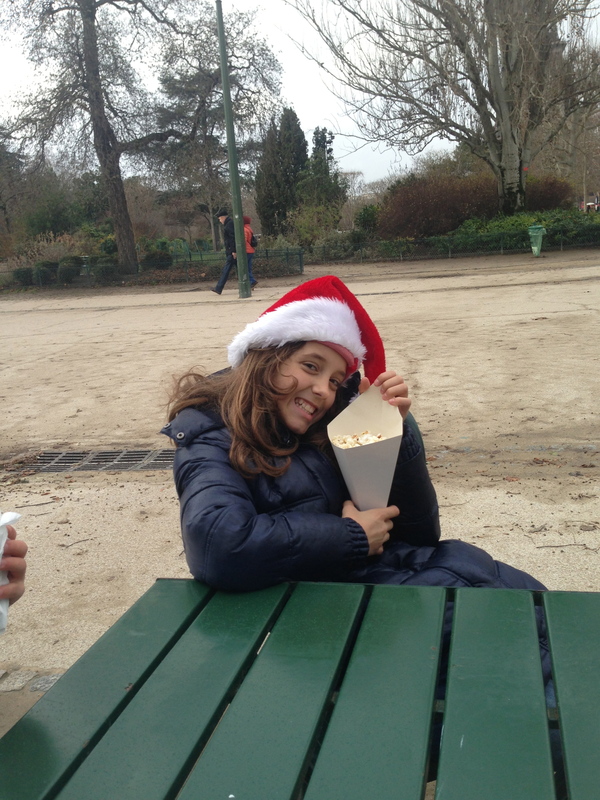 After skating we enjoyed some French churros and popcorn. 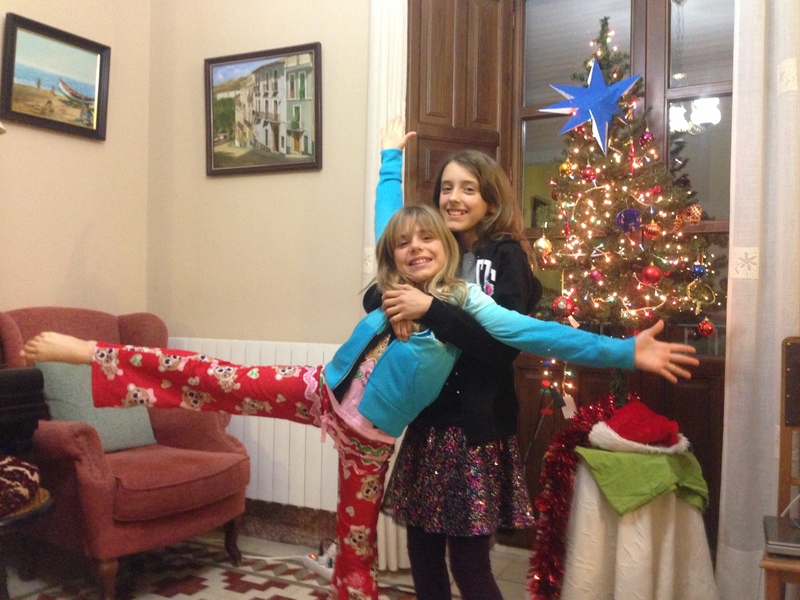 December 28: Travel day to London (a future post). 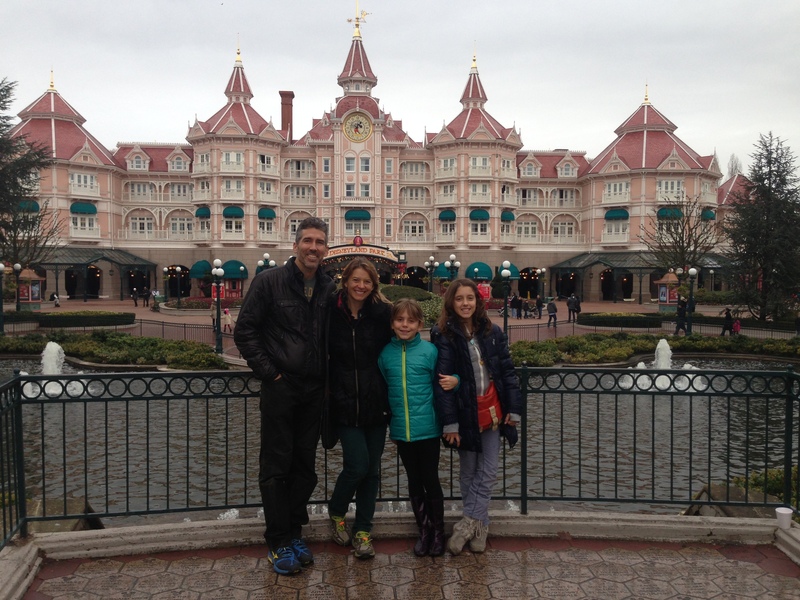 We thought that taking the Eurostar (super-fast train) from Paris to London would be fun. As it turns out, it is shockingly expensive if purchased on short notice. 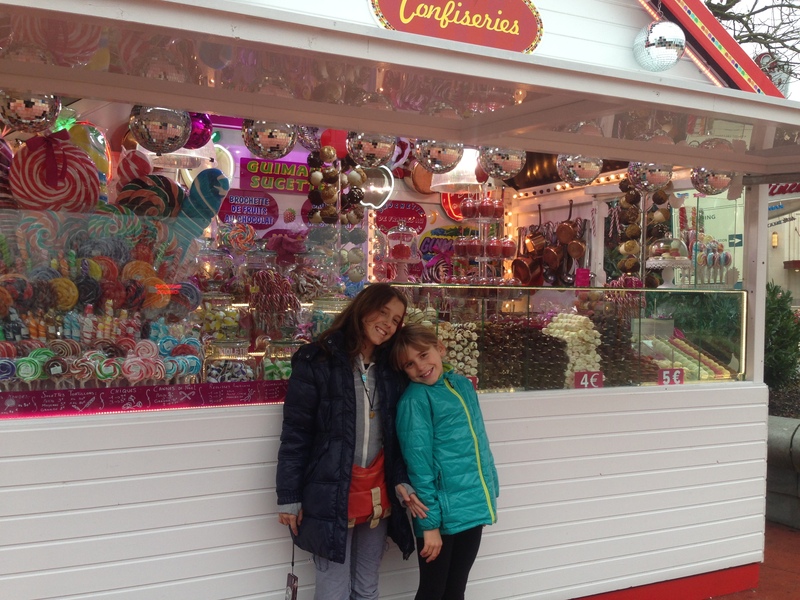 We were able buy the tickets for a discount if we left from EuroDisney. We didn’t have enough time to visit the park which was too bad, but we did have time to walk around Europe’s Downtown Disney. 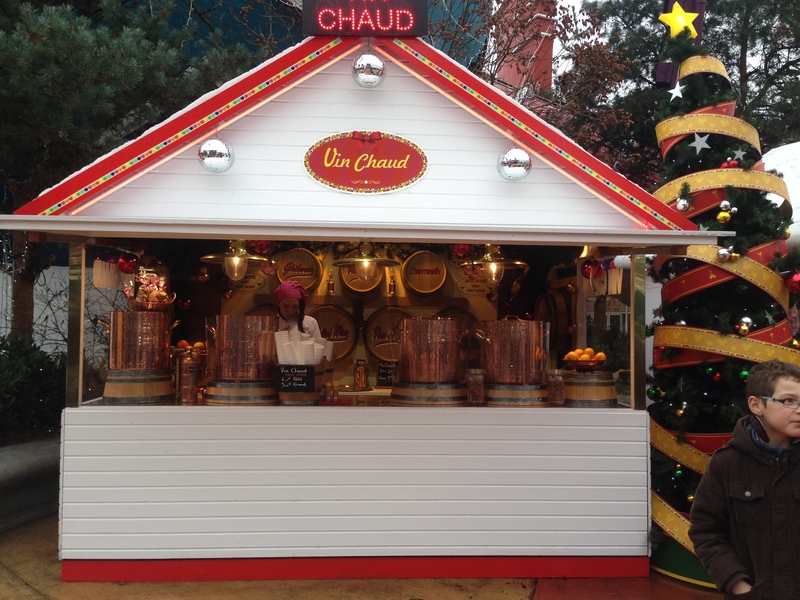 Vin Chaud (hot wine) stand in Downtown Disney. One thing I haven’t seen in Orlando or Anaheim! 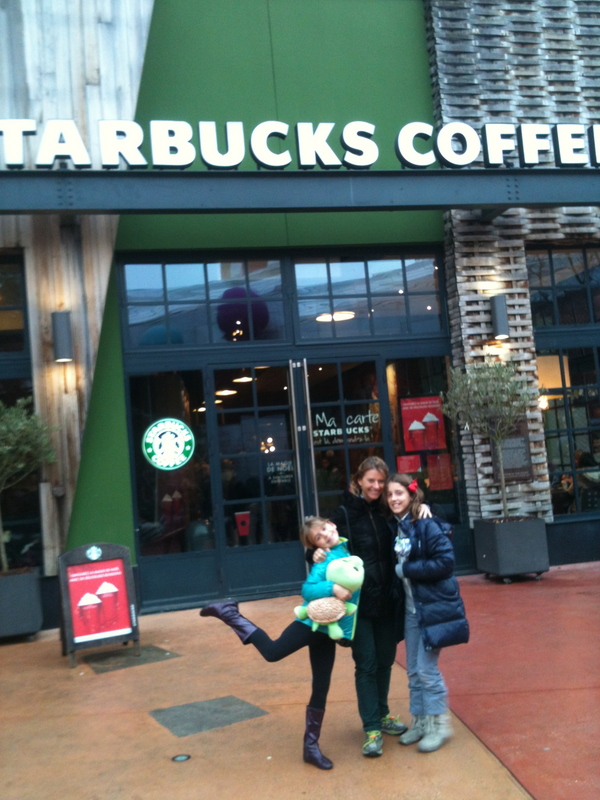 We ate in the Rainforest café and managed to get a coffee at Starbucks before we had to catch our train to London. 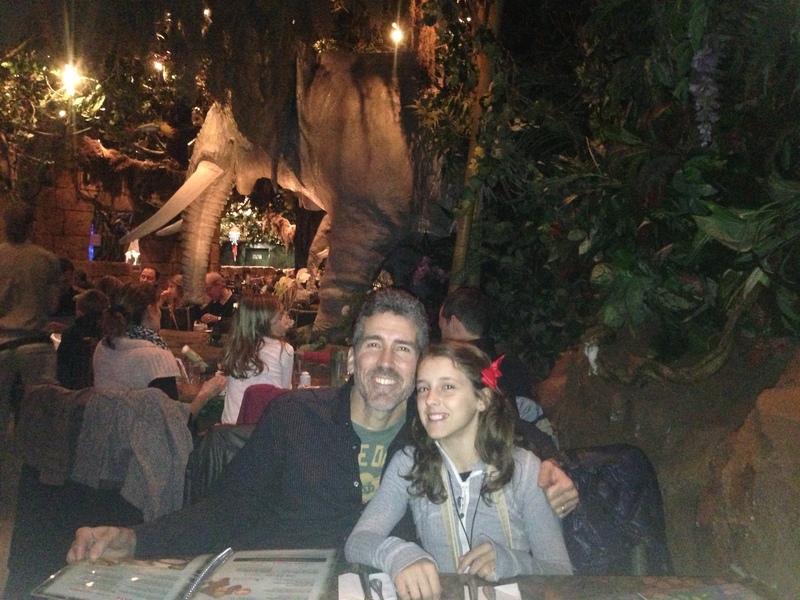 We were happy to eat at the Rainforest café because there was no line and after a few months away from home it is really nice to visit some American spots! 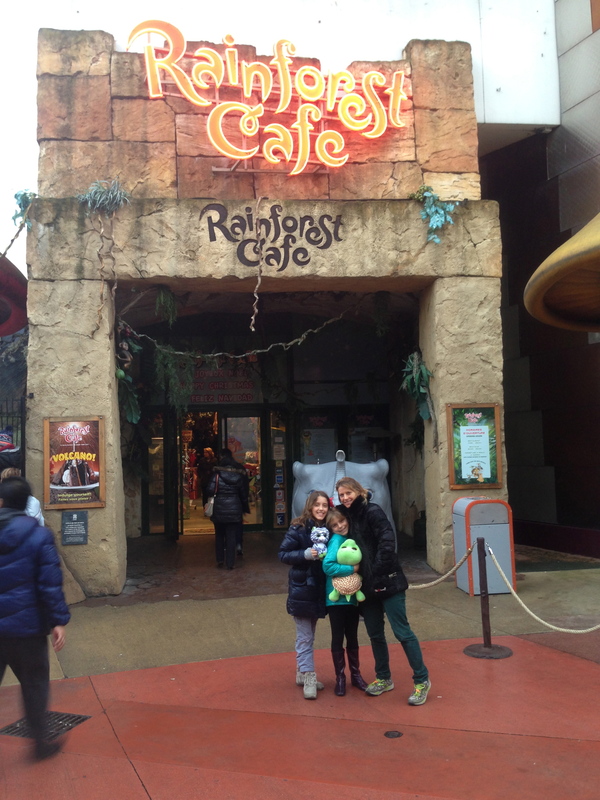 Rainforest Cafe. Look, no line! 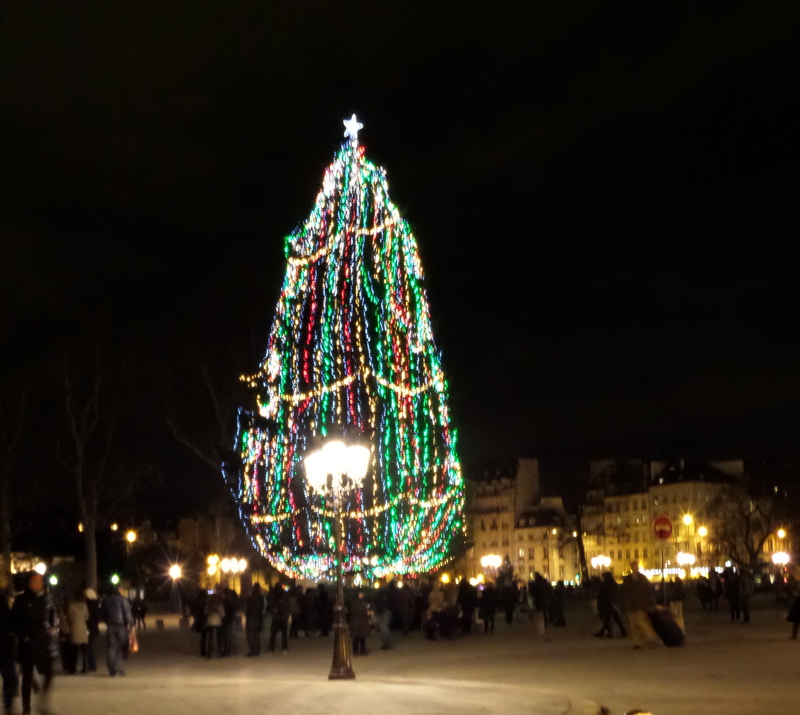 Christmas in Paris was magical. 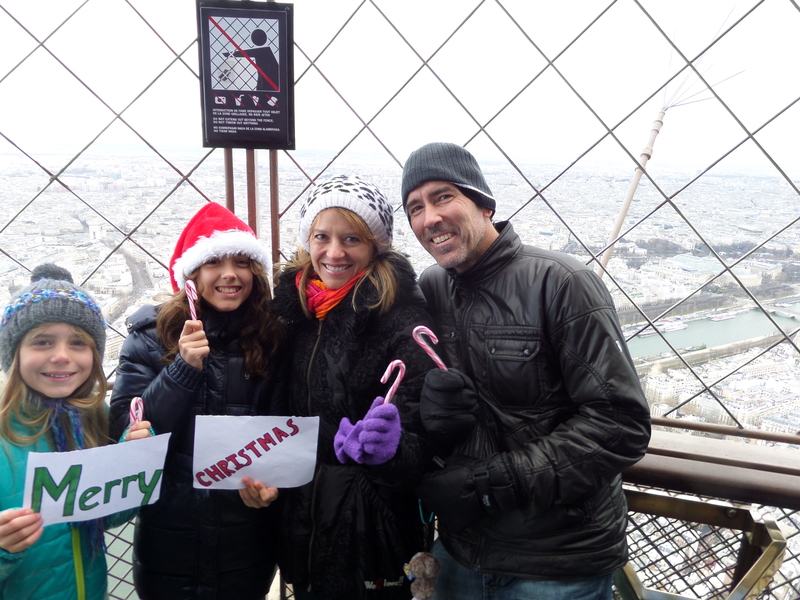 Everyone agreed that the Eiffel Tower was our favorite. 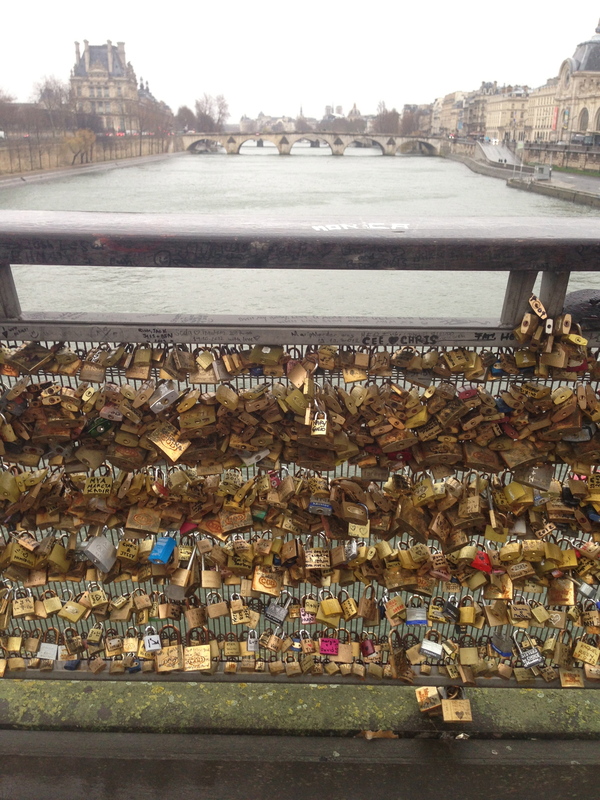 I also wouldn’t have wanted to miss the “Love-Lock bridge”. Mike liked our cool high rise apartment. 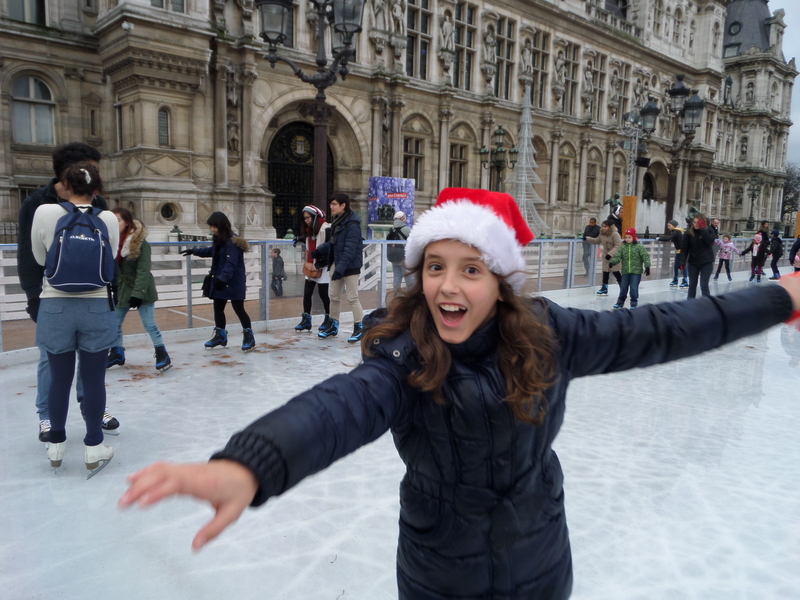 Savvy loved ice skating and crepes. Sky loved the parks and art. We could have spent another week exploring but Team Kezmoh is off to London. 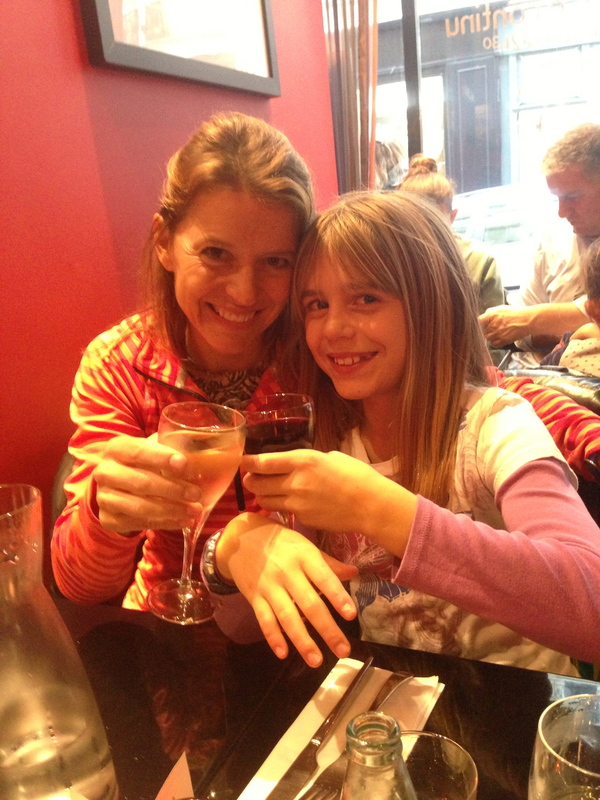 We will be back to Paris for a summer visit some day soon.